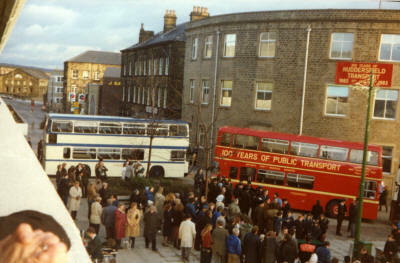 BUSES TRANSFERRED FROM HUDDERSFIELD CORPORATION TO THE WEST YORKSHIRE P.T.E. 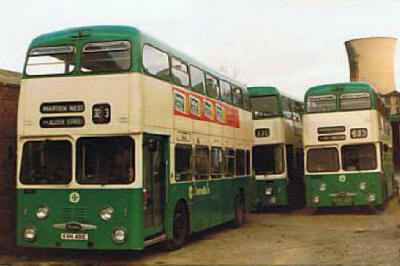 4001 (LCX34E) AEC Reliance 6MU3R6739 with Willowbrook CF1488/67642 B53F body. 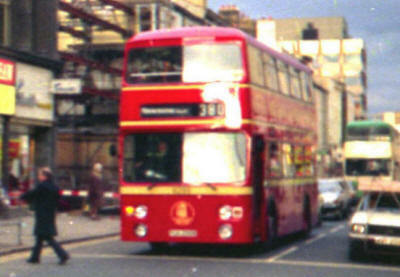 Ex Huddersfield Corporation 1 on 1 4 1974 taken over from Hanson's Buses 405 on 1 10 1969. New to Hanson's 4/1967. Seen in St Georges Square. 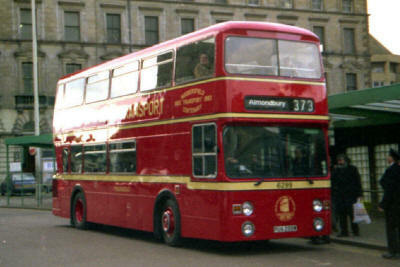 73 Huddersfield - Waterloo, Seen in St Georges Square. 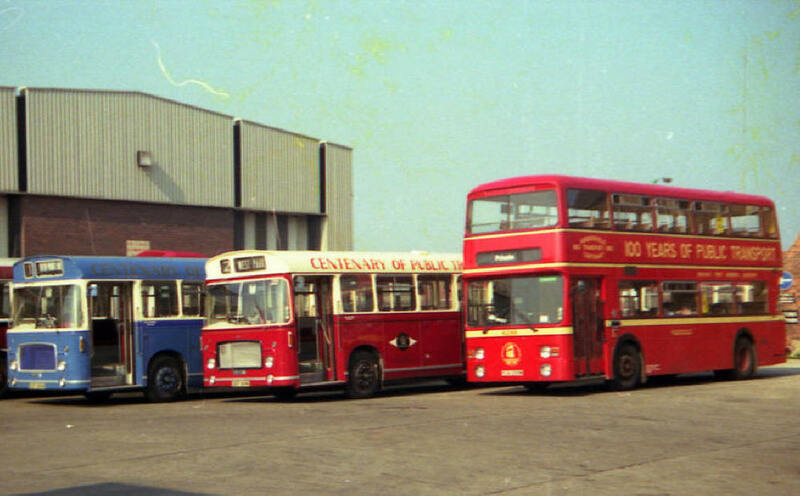 4003 (OCX312F) AEC Reliance 6MU3R7099 with Willowbrook CF1640/67906 B53F body. Ex Huddersfield Corporation 3 on 1 4 1974 taken over from Hanson's Buses 412 on 1 10 1969. New to Hanson's 1968. Seen at Huddersfield Bus Station. 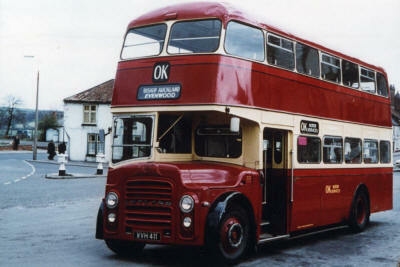 4009 (LVH9) AEC Reliance MU2RA1319 with C.H.Roe GO4288 B44F body built 1956. Ex Huddersfield Corporation 9 on 1 4 1974. 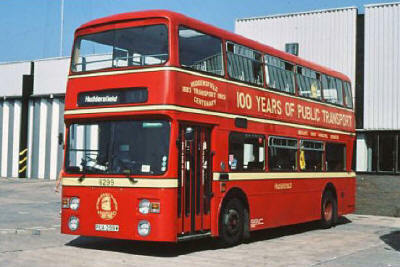 Originally owned by Huddersfield Joint Omnibus Committee (Railway/State). Quite often loaned to Baddeley Bros., Holmfirth. A10 Recovery Wagon chassis ex A1 Transport, Gildersome, fitted with Holmes Crane. 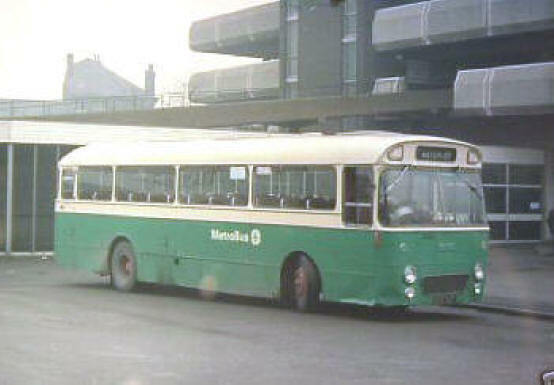 Ex Huddersfield Corporation A10 on 1 4 1974. 4011 (LVH11) AEC Reliance MU2RA1320 with C.H.Roe GO4289 B44F body built 1956. 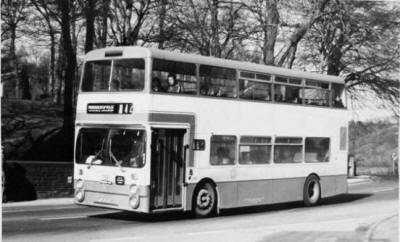 Ex Huddersfield Corporation 11 on 1 4 1974. 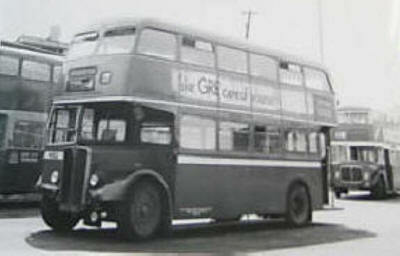 Originally owned by Huddersfield Joint Omnibus Committee (Railway/State). 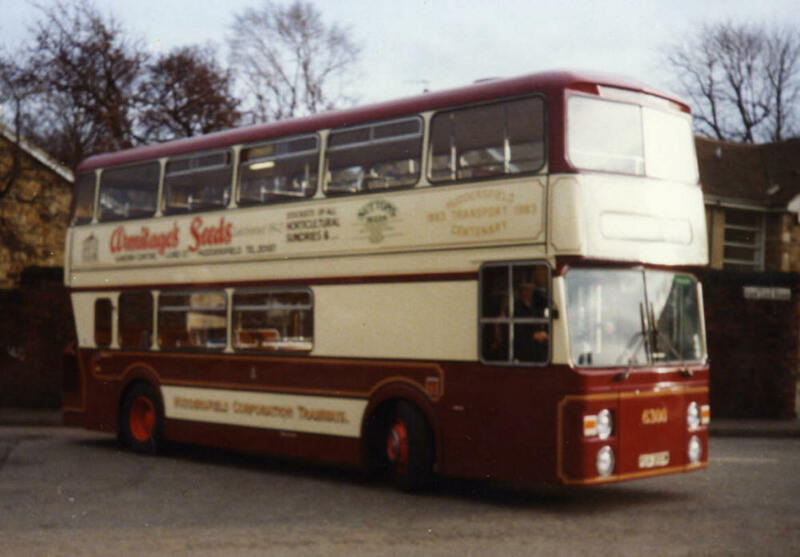 Quite often loaned to Baddeley Bros., Holmfirth. 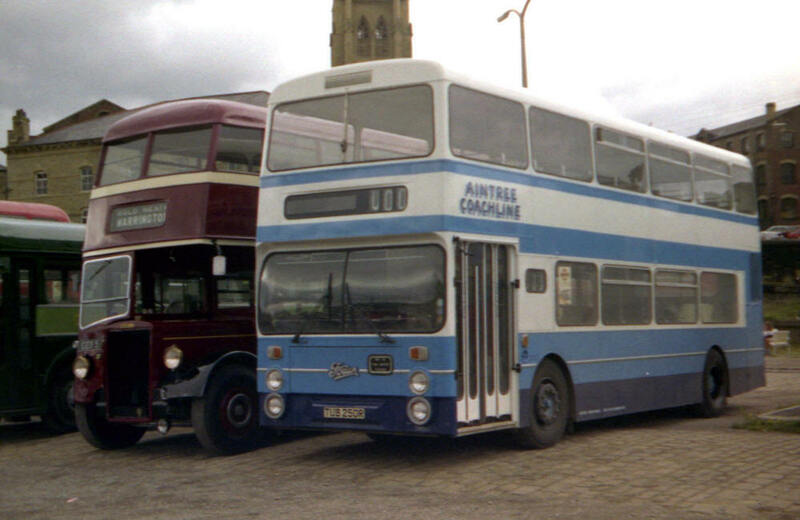 A11 (ECX425) AEC Regent lll 9612E4144 with Northern Coachbuilders body L29/26R new 1 6 1949. Used as driver trainer, Ex Huddersfield Corporation 11 on 1 4 1974. 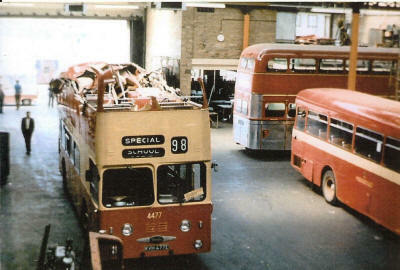 Now preserved & under restoration. Seen at Longroyd Bridge Depot. 4012 (LVH12) AEC Reliance MU2RA1318 with C.H.Roe GO4290 B44F body built 1956. 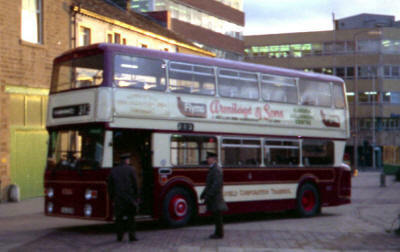 Ex Huddersfield Corporation 12 on 1 4 1974. Originally owned by Huddersfield Joint Omnibus Committee (Corporation). 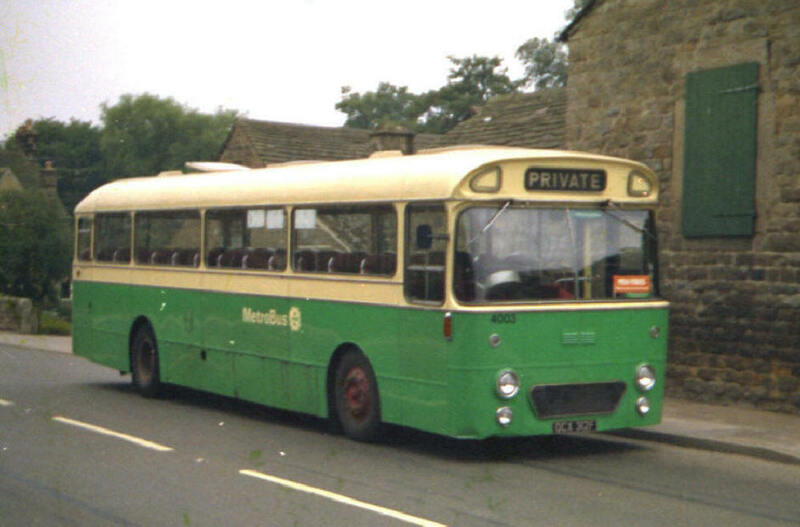 Quite often loaned to Baddeley Bros., Holmfirth. 4013 (OCX113) AEC Reliance MU2RA2118 with East Lancashire 5522 B44F body built 1959. 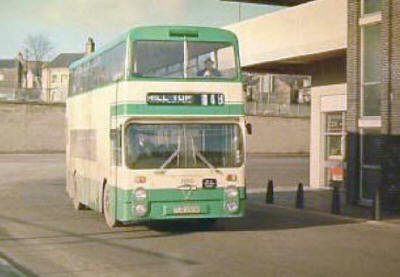 Ex Huddersfield Corporation 13 on 1 4 1974. Originally owned by Huddersfield Joint Omnibus Committee (Railway/State). 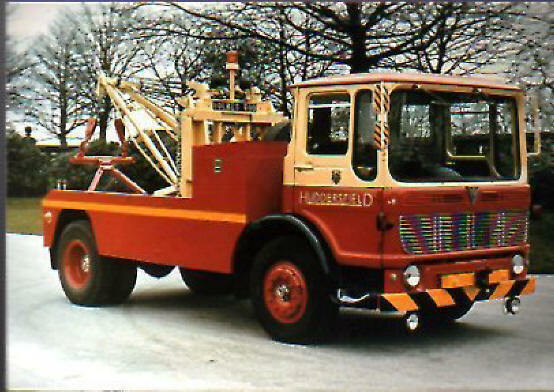 Quite often loaned to Baddeley Bros., Holmfirth. 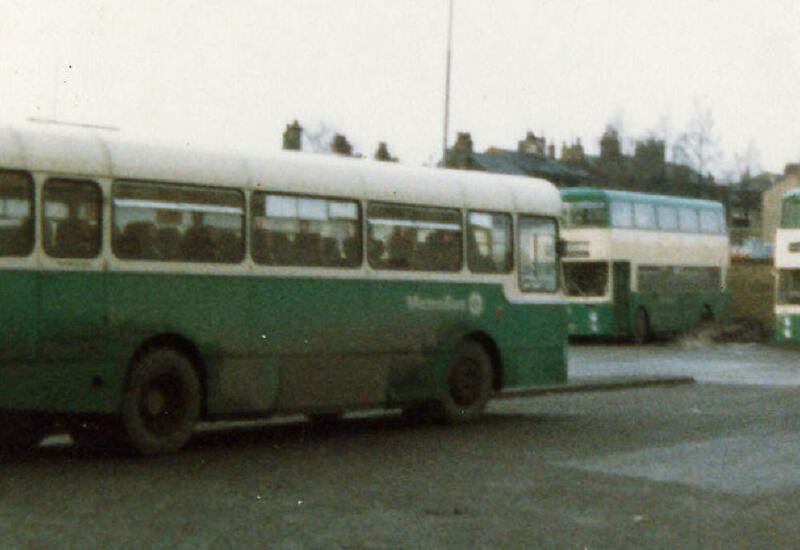 Seen at Leeds Road Garage. 4014 (OCX114) AEC Reliance MU2RA2119 with East Lancashire 5518 B44F body built 1959. 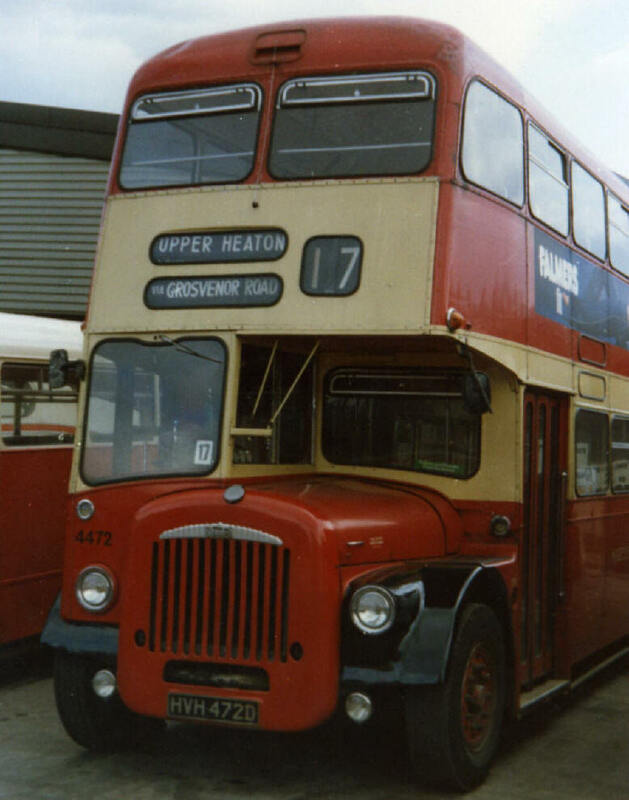 Ex Huddersfield Corporation 14 on 1 4 1974. Originally owned by Huddersfield Joint Omnibus Committee (Corporation). 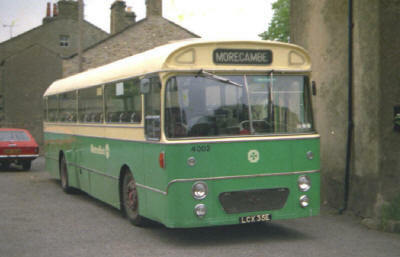 4015 (OCX115) AEC Reliance MU2RA2120 with East Lancashire 5520 B44F body built 1959. 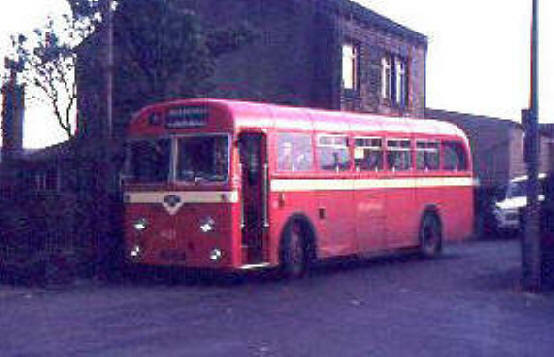 Ex Huddersfield Corporation 15 on 1 4 1974. 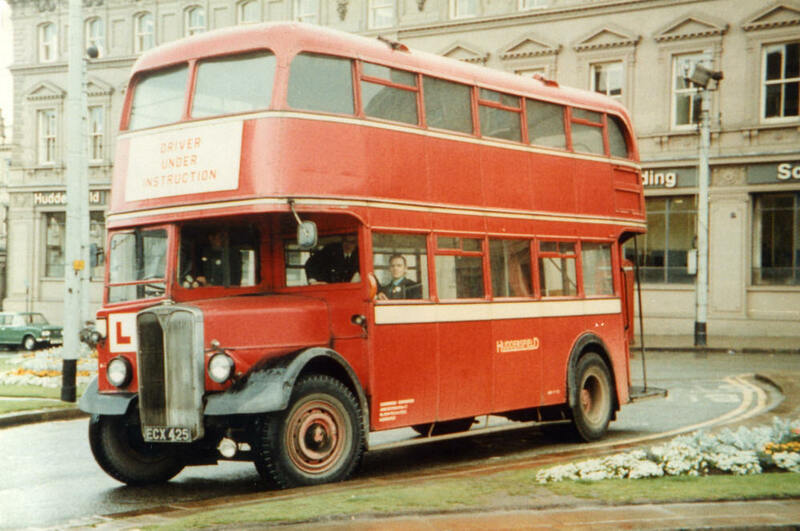 Originally owned by Huddersfield Joint Omnibus Committee (Railway/State). 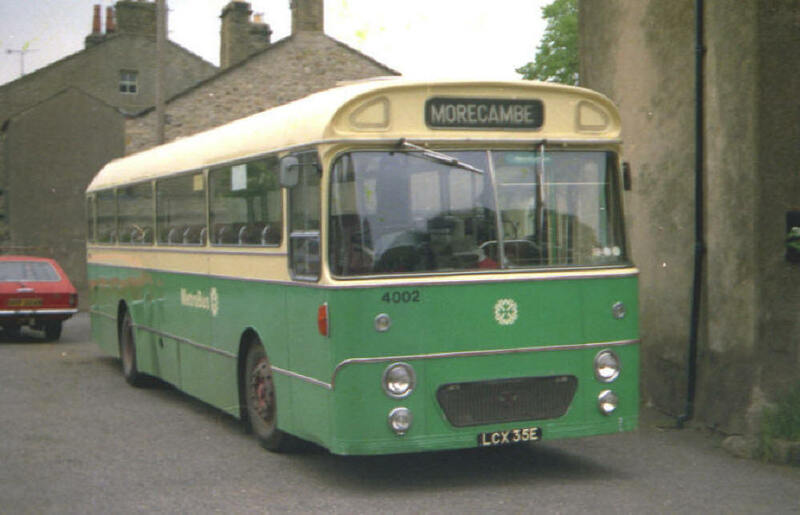 4016 (OCX116) AEC Reliance MU2RA2121 with East Lancashire 5521 B44F body built 1959. 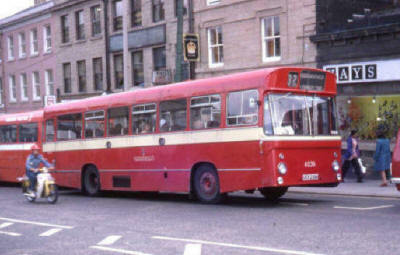 Ex Huddersfield Corporation 16 on 1 4 1974. Originally owned by Huddersfield Joint Omnibus Committee (Corporation). 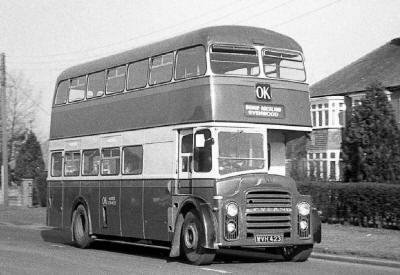 4017 (OCX117) AEC Reliance MU2RA2122 with East Lancashire 5519 B44F body built 1959. 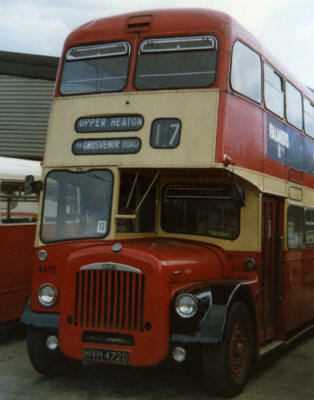 Ex Huddersfield Corporation 17 on 1 4 1974. Originally owned by Huddersfield Joint Omnibus Committee (Railway/State). 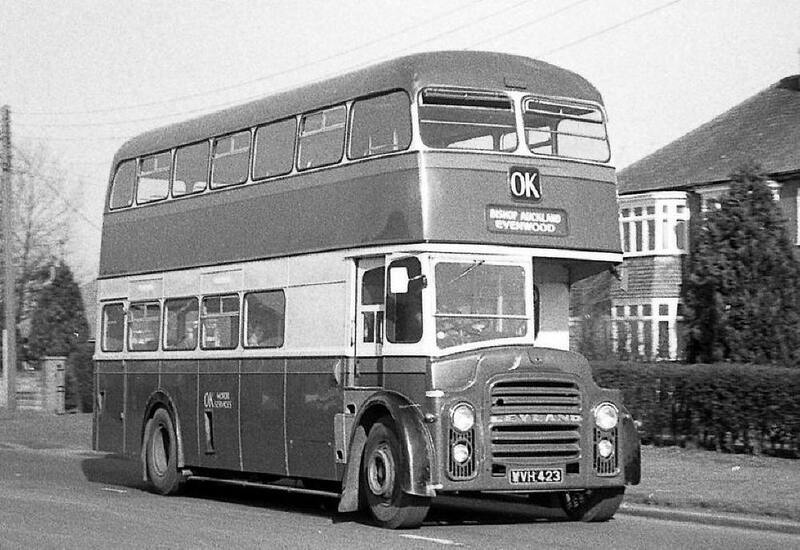 4018 (OCX118) AEC Reliance MU2RA2123 with East Lancashire 5517 B44F body built 1959. 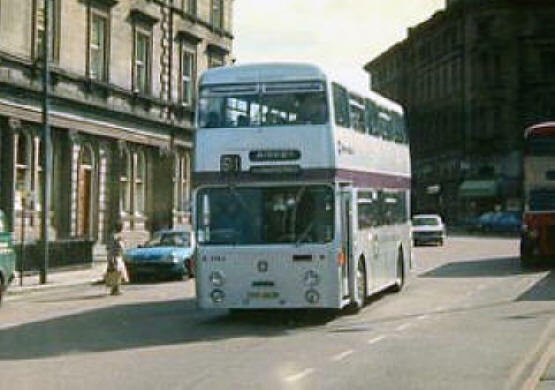 Ex Huddersfield Corporation 18 on 1 4 1974. Originally owned by Huddersfield Joint Omnibus Committee (Corporation). 4019 (SCX19) AEC Reliance MU2RA2401 with C.H.Roe GO5210 B44F body built 10/1960. Ex Huddersfield Corporation 19 on 1 4 1974. 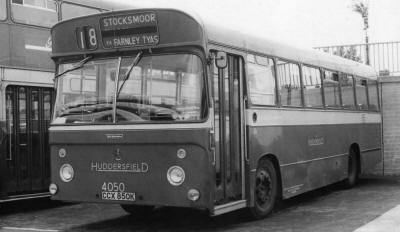 Originally owned by Huddersfield Joint Omnibus Committee (Railway/State). 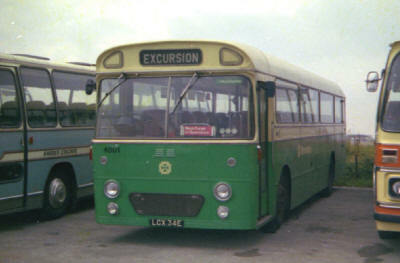 4021 (SCX21) Leyland Leopard L1 60288 with C.H.Roe 5219 B44F body built 3/1961. Ex Huddersfield Corporation 21 on 1 4 1974. 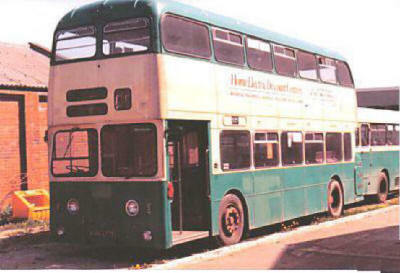 Originally owned by Huddersfield Joint Omnibus Committee (Railway/State). Transferred to Calderdale. 3 Huddersfield - Scapegoat Hill, Seen at Scapegoat Hill. 4022 (SCX22) Leyland Leopard L1 60289 with C.H.Roe GO5218 B44F body built 3/1961. 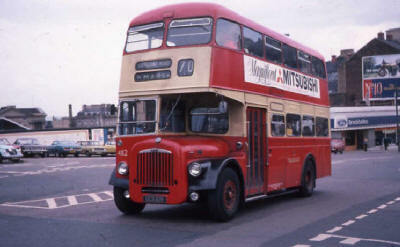 Ex Huddersfield Corporation 22 on 1 4 1974. Originally owned by Huddersfield Joint Omnibus Committee (Corporation). 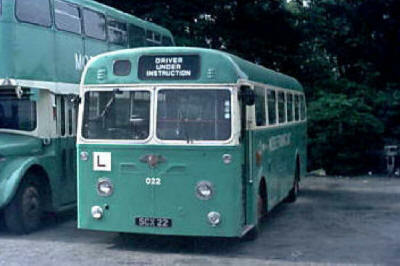 Transferred to Calderdale, became Training bus 022. 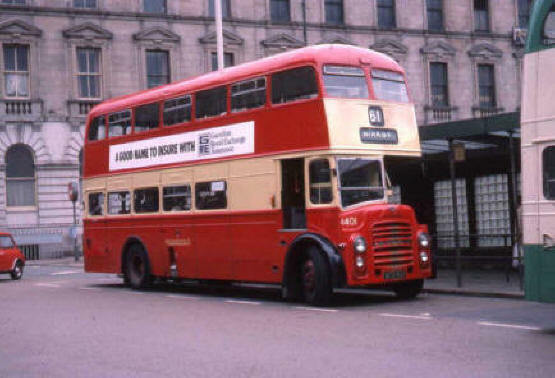 4023 (ACX324A) AEC Reliance 2MU3RA4685 with C.H.Roe GO5795 B44F body built 12/1963. 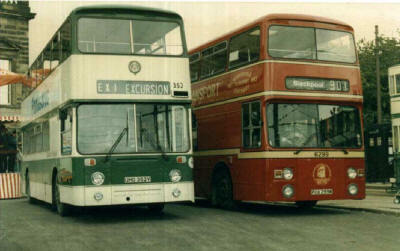 Ex Huddersfield Corporation 23 on 1 4 1974. Originally owned by Huddersfield Joint Omnibus Committee (Railway/State). 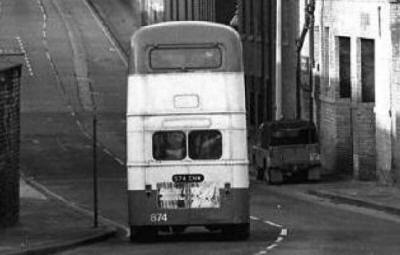 4024 (ACX324A) AEC Reliance 2MU3RA4686 with C.H.Roe GO5796 B44F body built 12/1963. Ex Huddersfield Corporation 24 on 1 4 1974. 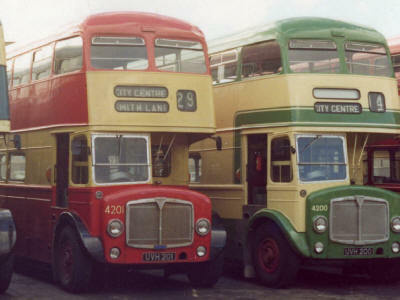 Originally owned by Huddersfield Joint Omnibus Committee (Corporation). 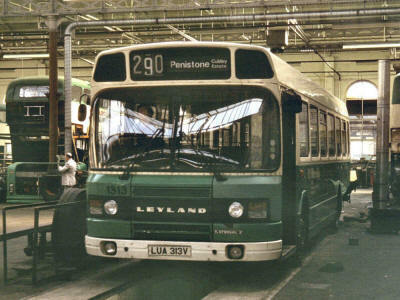 4025 (KVH25E) Leyland Leopard PSU4/2RL65209 with Neepsend Coachworks B44F body built 7/1967. 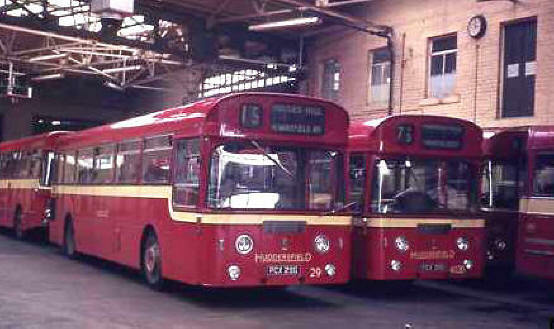 Ex Huddersfield Corporation 25 on 1 4 1974. Originally owned by Huddersfield Joint Omnibus Committee (Railway/State). 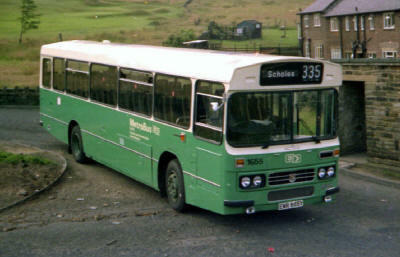 Quite often on loan to Baddeley Bros., Holmfirth. 4026 (KVH26E) Leyland Leopard PSU4/2RL65251 with Neepsend Coachworks B44F body built 7/1967. Ex Huddersfield Corporation 26 on 1 4 1974. Originally owned by Huddersfield Joint Omnibus Committee (Corporation). 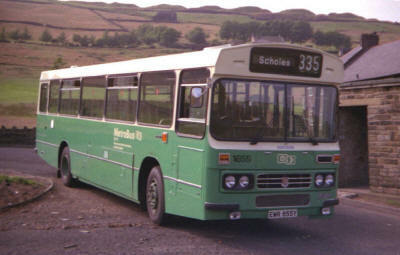 Quite often on loan to Baddeley Bros., Holmfirth. 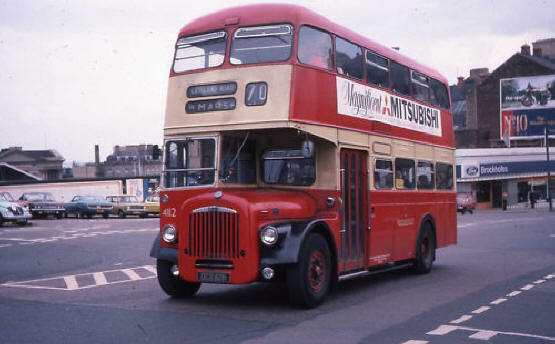 4027 (MVH27F) AEC Swift MP2R093 with C.H.Roe GO6462 B44F body built 12/1967. Ex Huddersfield Corporation 27 on 1 4 1974. 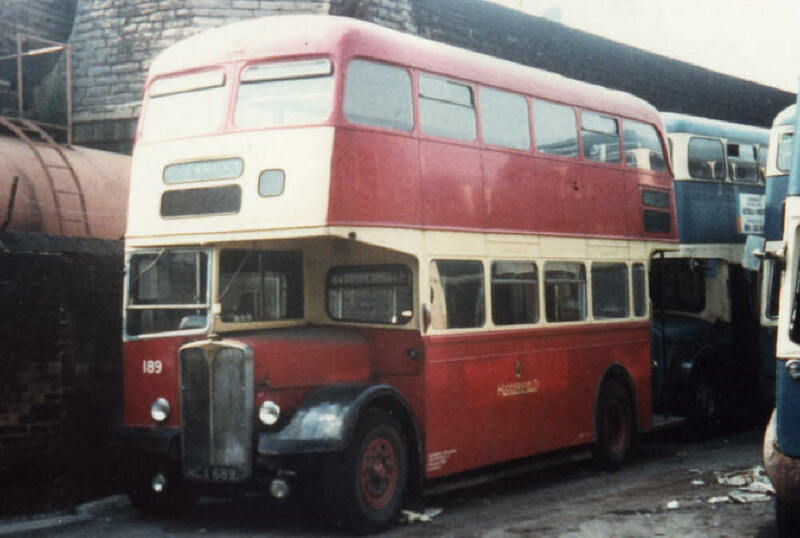 Originally owned by Huddersfield Joint Omnibus Committee (Railway/State). 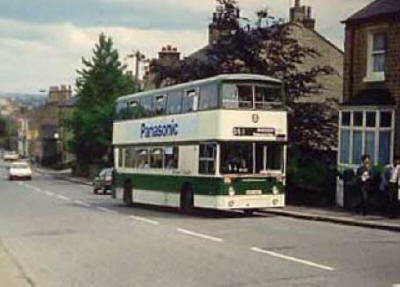 86 Huddersfield - Beaumont Park. 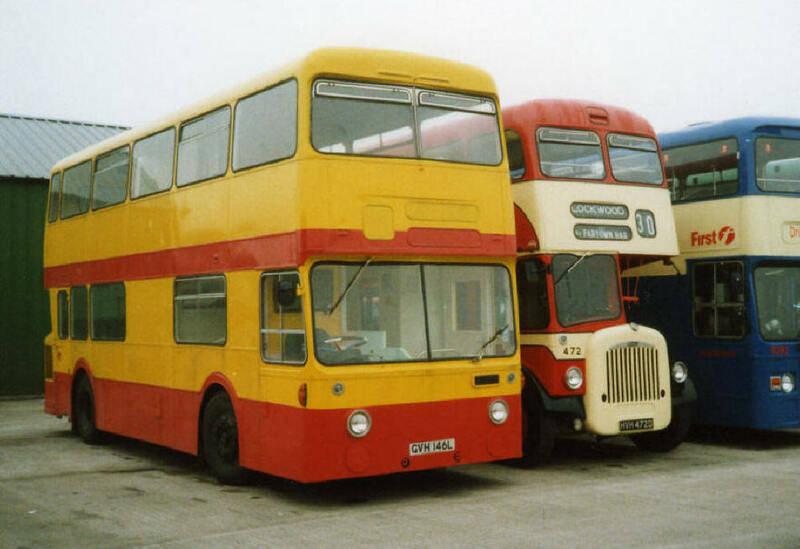 Seen at Huddersfield Bus Station. 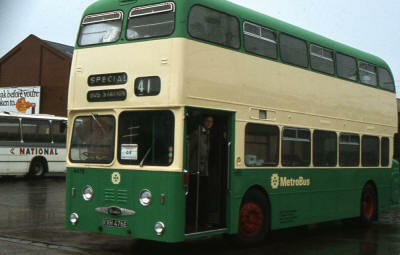 4028 (MVH28F) AEC Swift MP2R094 with C.H.Roe GO6463 B44F body built 12/1967. 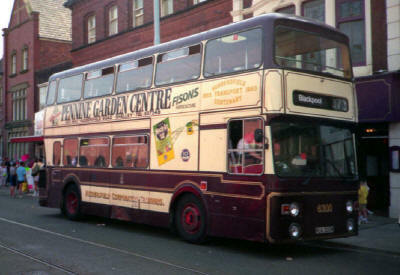 Ex Huddersfield Corporation 28 on 1 4 1974. 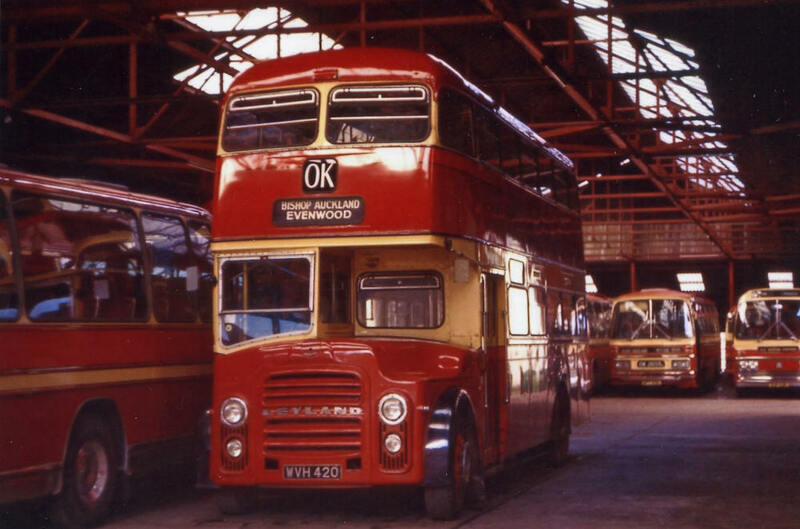 Originally owned by Huddersfield Joint Omnibus Committee (Corporation). 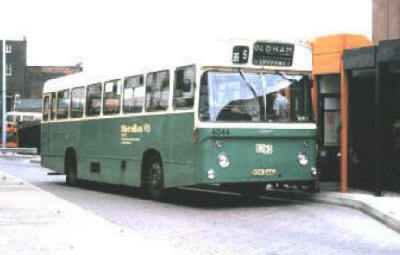 4029 (PCX29G) Daimler Fleetline SRG6LX62128 with C.H.Roe GO6553 B44F body built 1968. 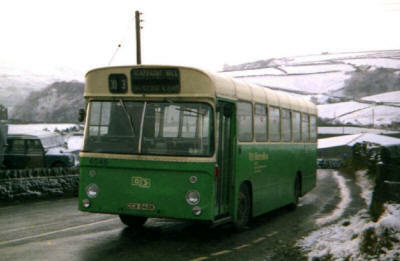 Ex Huddersfield Corporation 29 on 1 4 1974. Originally owned by Huddersfield Joint Omnibus Committee (Railway/State). 4030 (PCX30G) Daimler Fleetline SRG6LX62129 with C.H.Roe GO6554 B44F body built 10/1968. 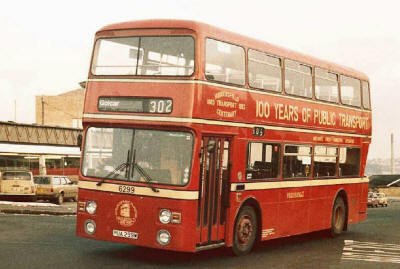 Ex Huddersfield Corporation 30 on 1 4 1974. 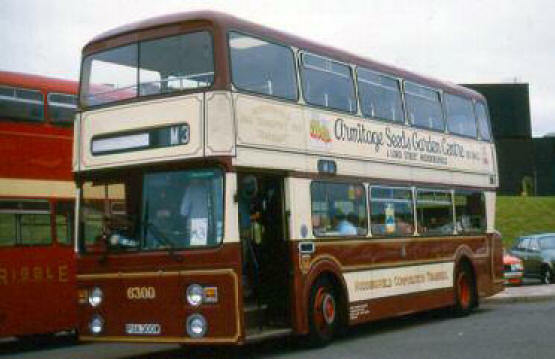 Originally owned by Huddersfield Joint Omnibus Committee (Corporation). 4031 (TCX531H) Seddon Pennine RU46534 with Pennine 654 B43D body seats from former Hanson's buses, built 4/1970, converted to B45F 1973. 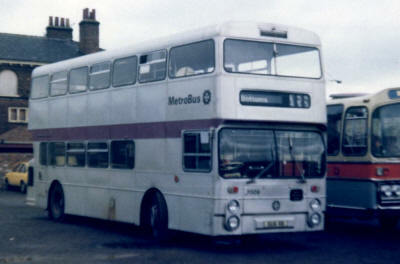 Ex Huddersfield Corporation 31 on 1 4 1974. 4032 (TCX532H) Seddon Pennine RU46535 with Pennine 656 B43D body seats from former Hanson's buses, built 5/1970, converted to B45F 1973. Ex Huddersfield Corporation 32 on 1 4 1974. 4033 (TCX533H) Seddon Pennine RU46536 with Pennine 655 B43D body seats from former Hanson's buses, built 4/1970, converted to B45F 1973. 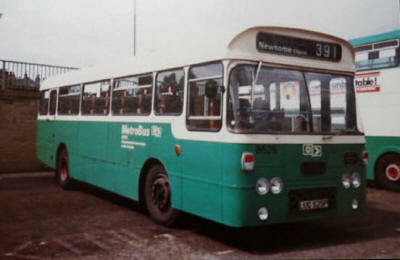 Ex Huddersfield Corporation 33 on 1 4 1974. 4034 (UCX234H) Seddon Pennine RU47238 with Pennine 778 B43D body built 6/1970, converted to B45F 1973. 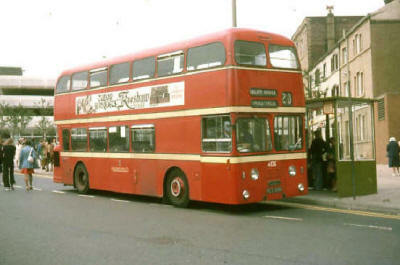 Ex Huddersfield Corporation 34 on 1 4 1974. 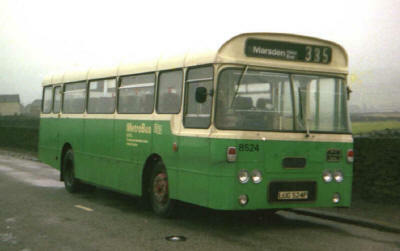 4035 (UCX235H) Seddon Pennine RU47239 with Pennine 779 B43D body built 6/1970, converted to B45F 1973. Ex Huddersfield Corporation 35 on 1 4 1974. 4036 (UCX236H) Seddon Pennine RU47240 with Pennine 780 B43D body built 6/1970, converted to B45F 1973. 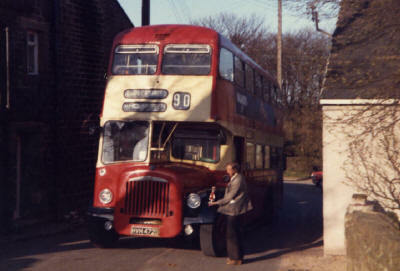 Ex Huddersfield Corporation 36 on 1 4 1974. 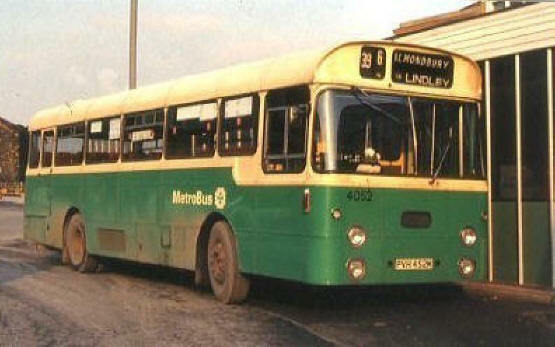 4037 (UCX237H) Seddon Pennine RU47241 with Pennine 781 B43D body built 7/1970, converted to B45F 1973. Ex Huddersfield Corporation 37 on 1 4 1974. 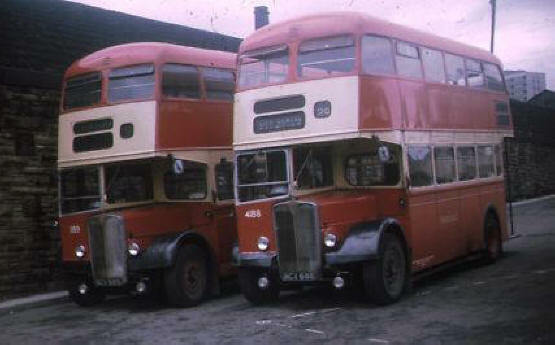 4038 (UCX238H) Seddon Pennine RU47242 with Pennine 782 B43D body built 8/1970, converted to B45F 1973. 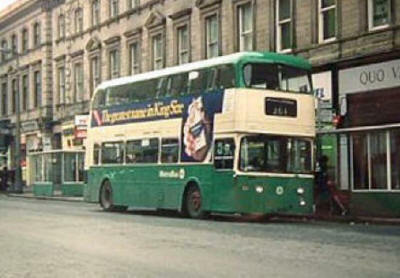 Ex Huddersfield Corporation 38 on 1 4 1974. 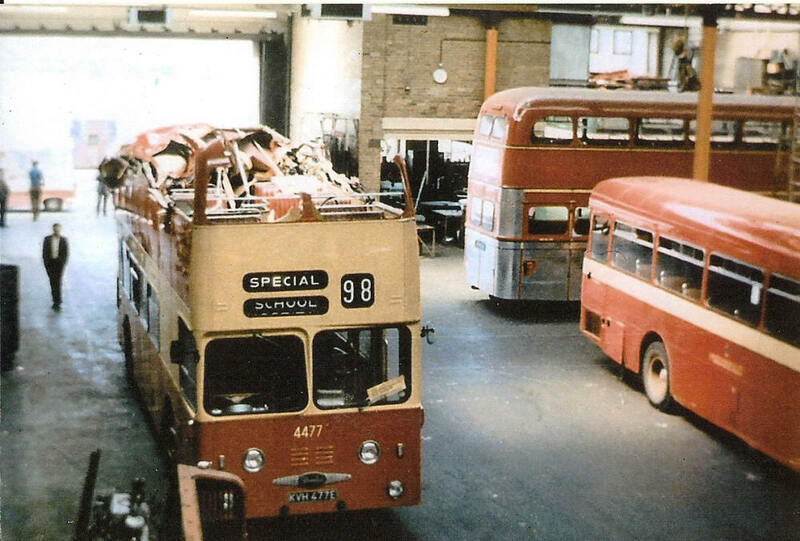 4039 (UCX239H) Seddon Pennine RU47243 with Pennine 783 B43D body built 8/1970, converted to B45F 1973. 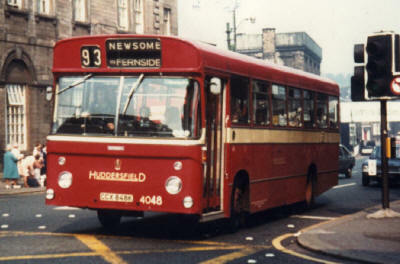 Ex Huddersfield Corporation 39 on 1 4 1974. 4040 (XCX240J) Seddon Pennine RU48360 with Pennine 1055 B43D body built 10/1971, converted to B45F 1974. Ex Huddersfield Corporation 40 on 1 4 1974. 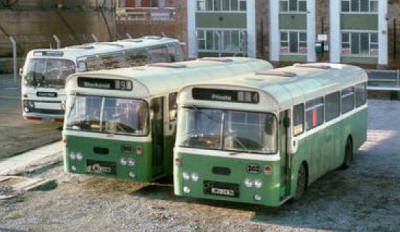 4041 (XCX241J) Seddon Pennine RU48361 with Pennine 1056 B43D body built 9/1971, converted to B45F 1973. Ex Huddersfield Corporation 41 on 1 4 1974. 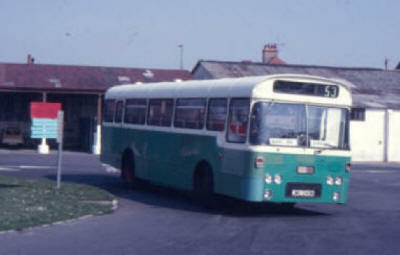 4042 (XCX242J) Seddon Pennine RU48362 with Pennine 1057 B43D body built 8/1971, converted to B45F 1973. 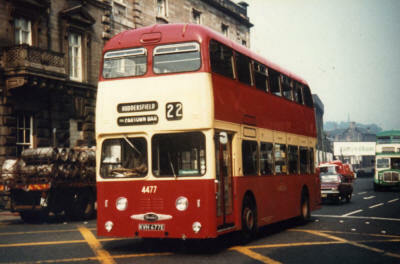 Ex Huddersfield Corporation 42 on 1 4 1974. 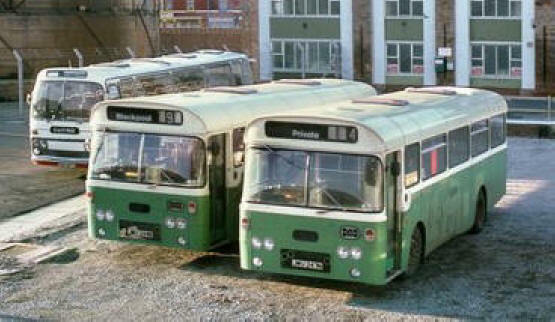 4043 (XCX243J) Seddon Pennine RU48363 with Pennine 1058 B43D body built 8/1971, converted to B45F 1973. 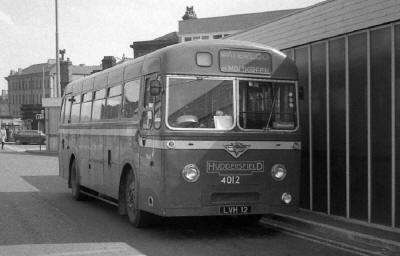 Ex Huddersfield Corporation 43 on 1 4 1974. 4044 (XCX244J) Seddon Pennine RU48364 with Pennine 1059 DP39D body built 10/1971, converted to DP41F 1974. 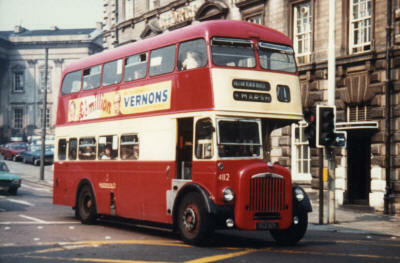 Ex Huddersfield Corporation 44 on 1 4 1974. 365 Huddersfield - Marsden - Uppermill - Oldham. Seen at Huddersfield Bus Station. 4045 (XCX245J) Seddon Pennine RU48365 with Pennine 1060 DP39D body built 10/1971, converted to DP41F 1974. 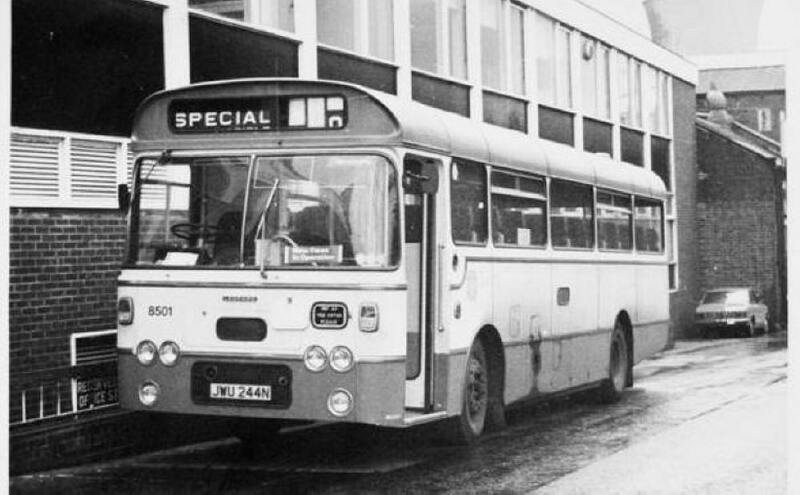 Ex Huddersfield Corporation 45 on 1 4 1974. 4046 (XCX246J) Seddon Pennine RU48366 with Pennine 1061 DP39D body built 10/1971, converted to DP41F 1974. 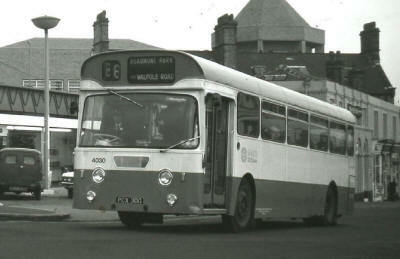 Ex Huddersfield Corporation 46 on 1 4 1974. 4047 (XCX247J) Seddon Pennine RU48367 with Pennine 1062 DP39D body built 10/1971, converted to DP41F 1973. Ex Huddersfield Corporation 47 on 1 4 1974. 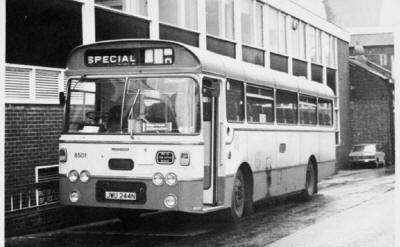 4048 (CCX848K) Seddon Pennine RU51909 with Pennine 1063 B43D body built 8/1972, converted to B45F 1973. Ex Huddersfield Corporation 48 on 1 4 1974. 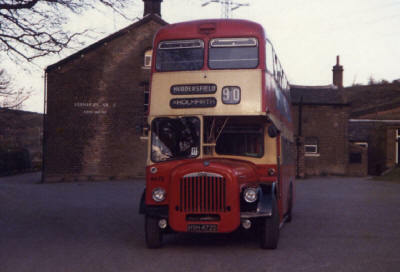 93 Weatherhill - Birkby - Huddersfield - Waterloo - Almondbury - Newsome - Milnsbridge - Lindley. Seen at Huddersfield John William Street. 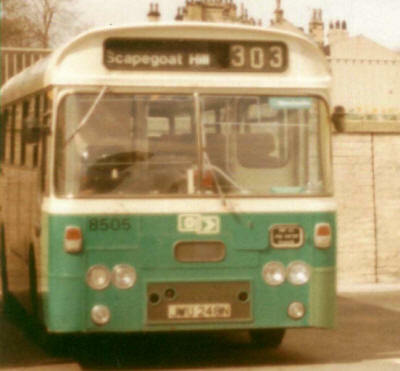 303 Huddersfield - Scapegoat Hill, Seen at Rochdale Road. 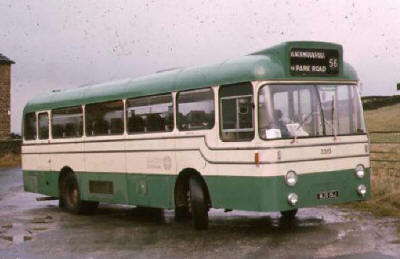 4049 (CCX849K) Seddon Pennine RU51910 with Pennine 1064 B43D body built 8/1972, converted to B45F 1973. 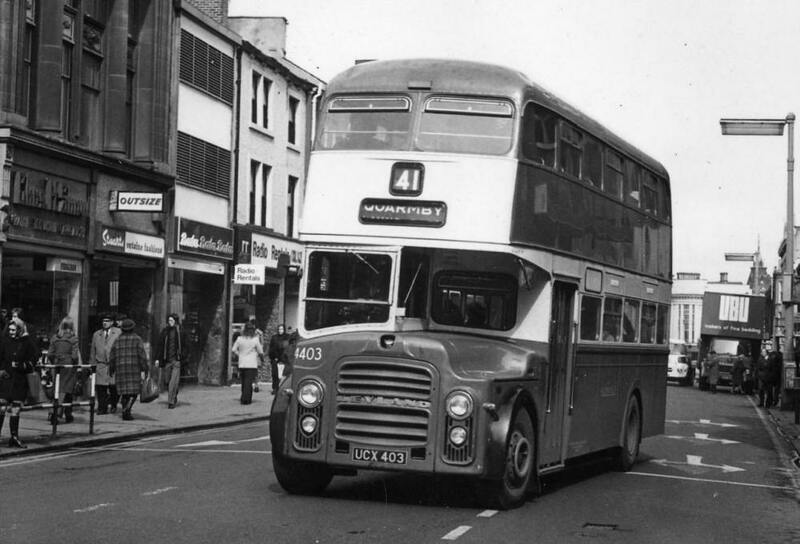 Ex Huddersfield Corporation 49 on 1 4 1974. 4050 (CCX850K) Seddon Pennine RU51911 with Pennine 1065 B43D body built 8/1972, converted to B45F 1973. Ex Huddersfield Corporation 50 on 1 4 1974. 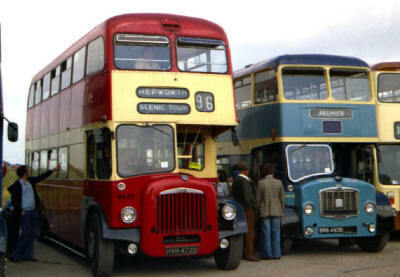 18 Huddersfield - Almondbury - Dean Bottom - Stocksmoor. Seen at Huddersfield Bus Station. 4051 (CCX851K) Seddon Pennine RU51912 with Pennine 1066 B43D body built 8/1972, converted to B45F 1973. Ex Huddersfield Corporation 51 on 1 4 1974. 392 Huddersfield - Birkby - Weatherhill - Milnsbridge - Newsome. 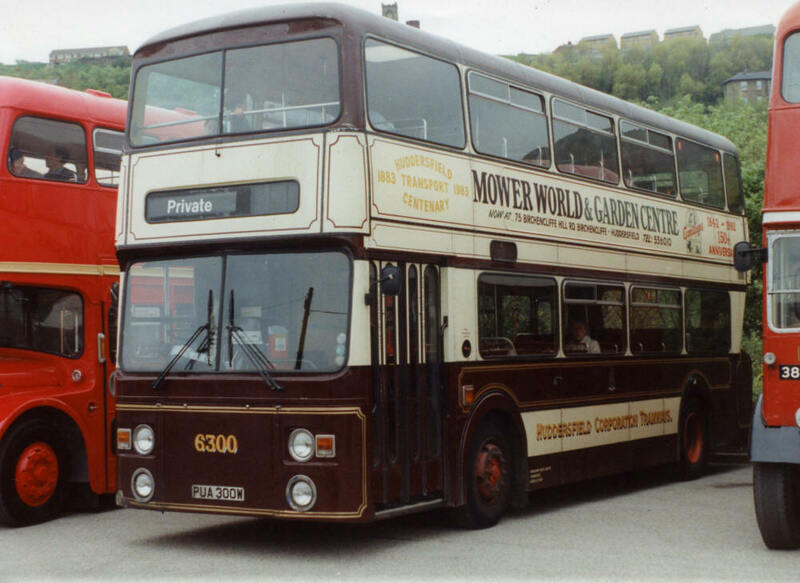 Seen at Huddersfield Bus Station. 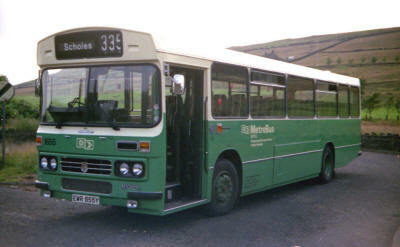 318 Huddersfield - Almondbury - Dean Bottom - Stocksmoor. Seen at Castle Hill. 4082 (BCX485B) AEC-Hanson Reliance 6685 with C.H.Roe GO5819 B41F body Ex Huddersfield Corporation 82 on 1 4 1974 taken over from Hanson's Buses 382 on 1 10 1969. 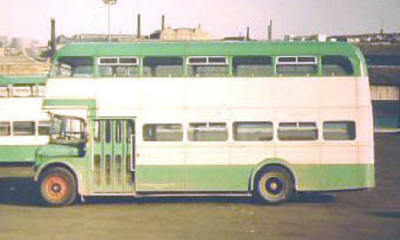 Originally rebuilt in 1964 from Hansons coach 336 (JCX753) AEC Reliance MU3RV289 with Plaxton C41C body. 4090 (ECX887C) AEC-Hanson Reliance 6689 with C.H.Roe GO6069 B41F body Ex Huddersfield Corporation 90 on 1 4 1974 taken over from Hanson's Buses 390 on 1 10 1969. 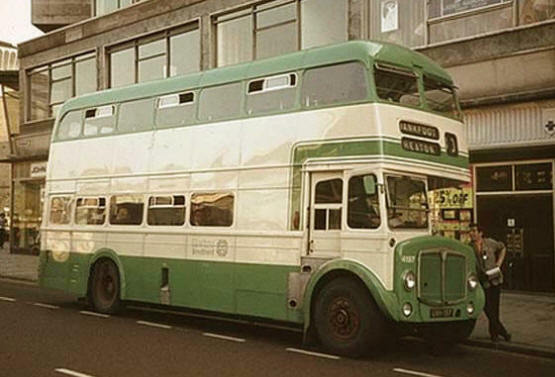 Originally rebuilt from Bottomleys coach (KVH353) a 1956 AEC Reliance MU3RV821 with Plaxton C41C body. 4101 (XCX101) Leyland Titan PD2A24 622726 with C.H.Roe GO5646 H37/28F body built 5/1963, Ex Huddersfield Corporation 101 on 1 4 1974. 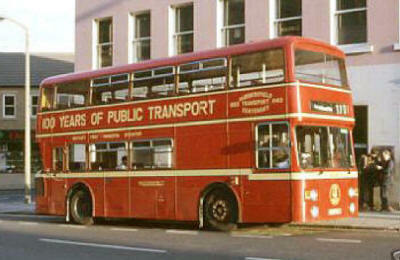 Originally owned by Huddersfield Joint Omnibus Committee (Railway/State). 4102 (XCX102) Leyland Titan PD2A/24 622727 with C.H.Roe GO5647 H37/28F body built 5/1963, Ex Huddersfield Corporation 102 on 1 4 1974. Originally owned by Huddersfield Joint Omnibus Committee (Corporation). 4103 (XCX103) Leyland Titan PD2A/24 622728 with C.H.Roe GO5648 H37/28F body built 5/1963, Ex Huddersfield Corporation 103 on 1 4 1974. 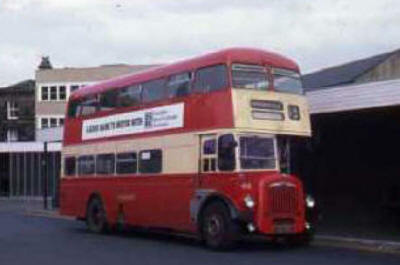 Originally owned by Huddersfield Joint Omnibus Committee (Railway/State). 4104 (XCX104) Leyland Titan PD2A/24 623337 with C.H.Roe GO5644 H37/28F body built 5/1963, Ex Huddersfield Corporation 104 on 1 4 1974. 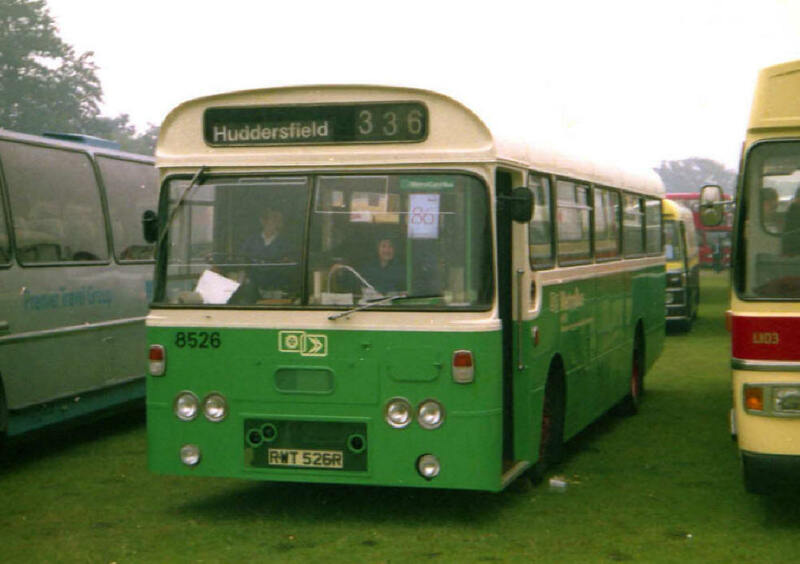 Originally owned by Huddersfield Joint Omnibus Committee (Corporation). 4105 (XCX105) Leyland Titan PD2A/24 623338 with C.H.Roe GO5645 H37/28F body built 5/1963, Ex Huddersfield Corporation 105 on 1 4 1974. Originally owned by Huddersfield Joint Omnibus Committee (Railway/State). 4106 (XCX106) Leyland Titan PD2A/24 623339 with C.H.Roe GO5649 H37/28F body built 5/1963, Ex Huddersfield Corporation 106 on 1 4 1974. 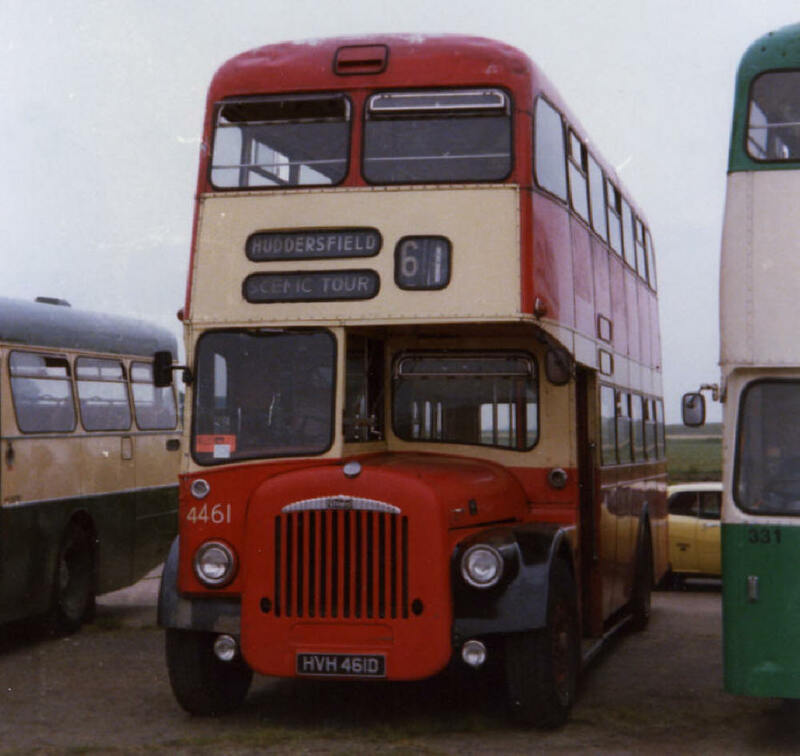 Originally owned by Huddersfield Joint Omnibus Committee (Corporation). 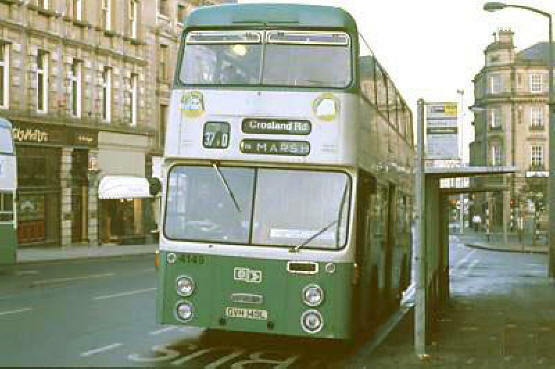 70 Rawthorpe - Huddersfield - Crosland Road. Seen at Huddersfield Westgate. 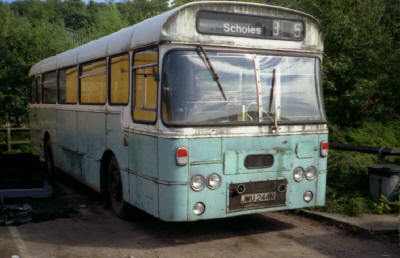 4107 (BCX107B) Daimler CVG6LX27DD20020 with C.H.Roe GO5805 H37/28F body built 2/1964, Ex Huddersfield Corporation 107 on 1 4 1974. 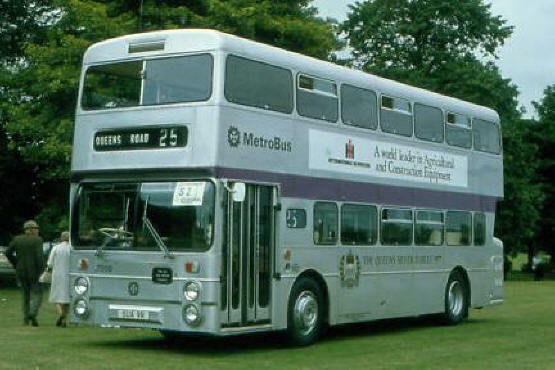 Originally owned by Huddersfield Joint Omnibus Committee (Railway/State). 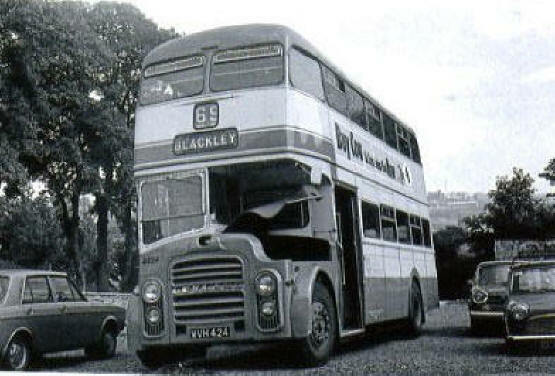 4108 (BCX108B) Daimler CVG6LX27DD20021 with C.H.Roe GO5804 H37/28F body built 2/1964, Ex Huddersfield Corporation 108 on 1 4 1974. Originally owned by Huddersfield Joint Omnibus Committee (Corporation). 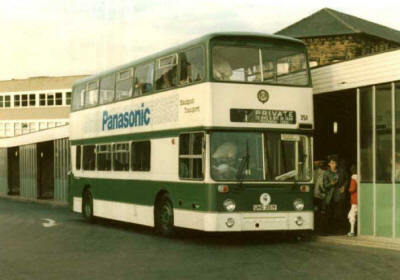 4109 (BCX109B) Daimler CVG6LX27DD20022 with C.H.Roe GO5803 H37/28F body built 2/1964, Ex Huddersfield Corporation 109 on 1 4 1974. Originally owned by Huddersfield Joint Omnibus Committee (Railway/State). 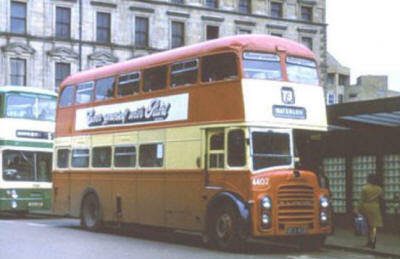 4110 (BCX110B) Daimler CVG6LX27DD20023 with C.H.Roe GO5806 H37/28F body built 2/1964, Ex Huddersfield Corporation 110 on 1 4 1974. 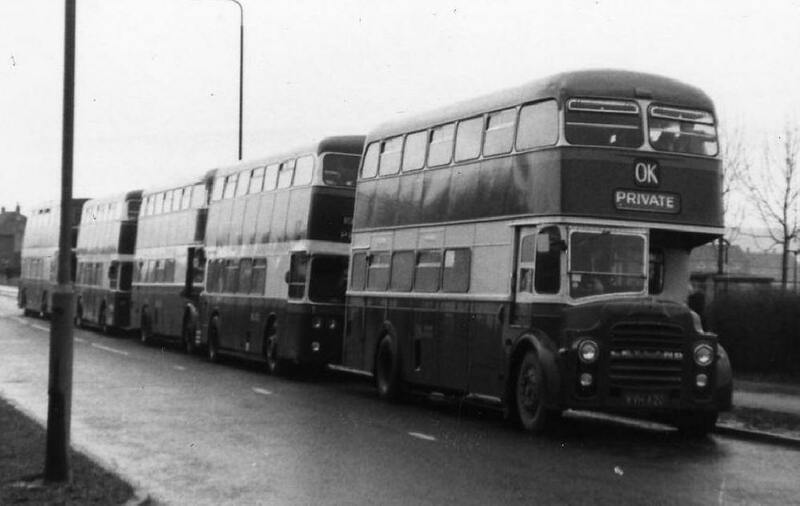 Originally owned by Huddersfield Joint Omnibus Committee (Corporation). 4111 (DCX111B) Daimler CVG6LX27DD20131 with C.H.Roe GO5984 H37/28F body built 11/1964, Ex Huddersfield Corporation 111 on 1 4 1974. Originally owned by Huddersfield Joint Omnibus Committee (Railway/State). 4112 (DCX112B) Daimler CVG6LX27DD20132 with C.H.Roe GO5985 H37/28F body built 11/1964, Ex Huddersfield Corporation 112 on 1 4 1974. Originally owned by Huddersfield Joint Omnibus Committee (Corporation). 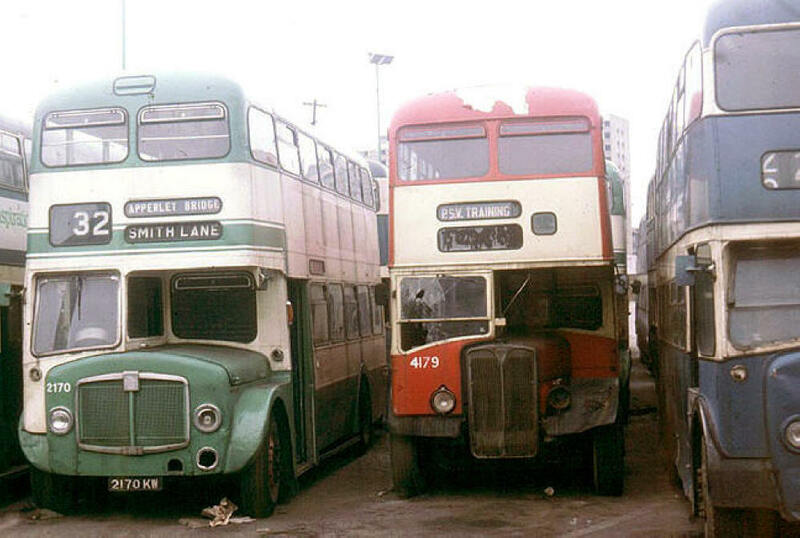 71 Lindley - Huddersfield - Dalton. Seen at Huddersfield St. Georges Square. 4113 (DCX113B) Daimler CVG6LX30DD30264 with C.H.Roe GO5988 H39/31F body built 12/1964, Ex Huddersfield Corporation 113 on 1 4 1974. 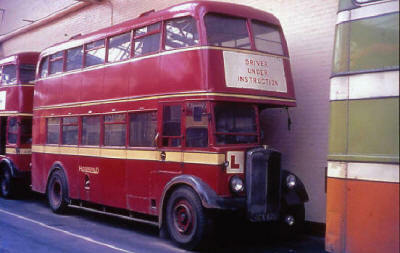 Originally owned by Huddersfield Joint Omnibus Committee (Railway/State). 4114 (DCX114B) Daimler CVG6LX30DD30265 with C.H.Roe GO5986 H39/31F body built 12/1964, Ex Huddersfield Corporation 114 on 1 4 1974. 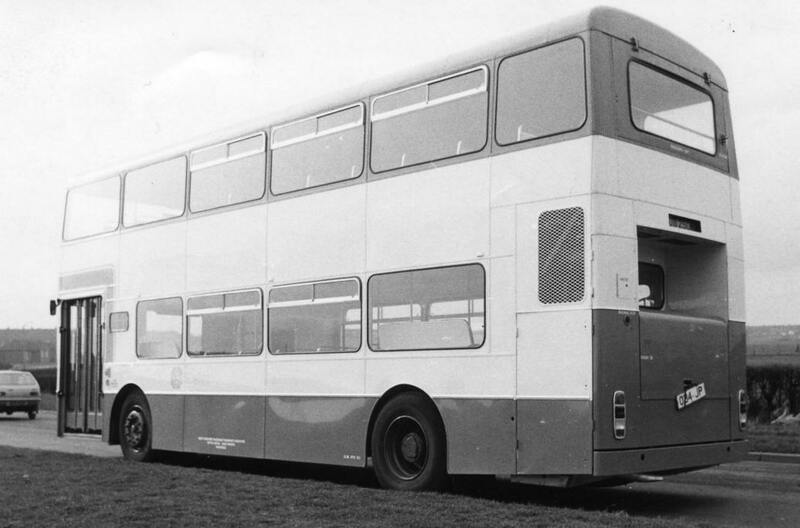 Originally owned by Huddersfield Joint Omnibus Committee (Corporation). 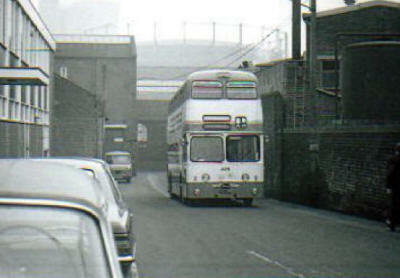 74 Waterloo - Huddersfield - Salendine Nook. Seen at Marsh. 4115 (DCX115B) Daimler CVG6LX30DD30266 with C.H.Roe GO5987 H39/31F body built 12/1964, Ex Huddersfield Corporation 115 on 1 4 1974. 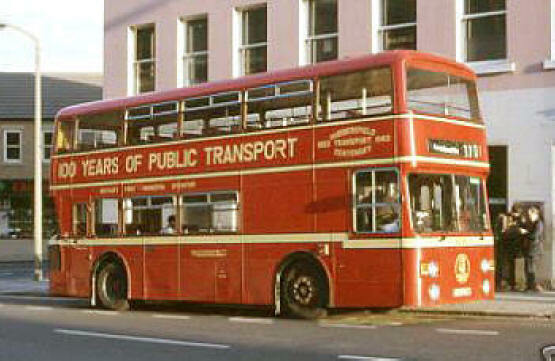 Originally owned by Huddersfield Joint Omnibus Committee (Railway/State). 4116 (DCX116B) Daimler CVG6LX30DD30267 with C.H.Roe GO5989 H39/31F body built 12/1964, Ex Huddersfield Corporation 116 on 1 4 1974. 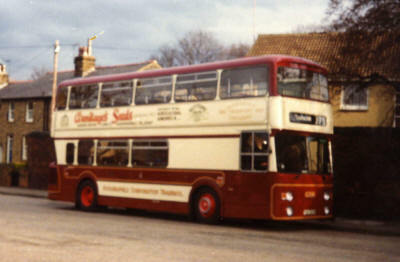 Originally owned by Huddersfield Joint Omnibus Committee (Corporation). 4117 (EVH117C) Daimler CVG6LX30DD30321 with C.H.Roe GO6062 H39/31F body built 10/1965, Ex Huddersfield Corporation 117 on 1 4 1974. Originally owned by Huddersfield Joint Omnibus Committee (Railway/State). 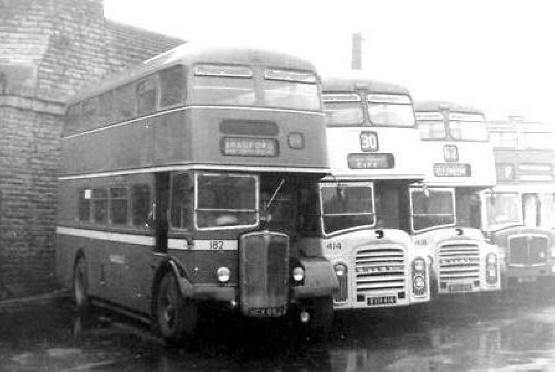 41 Bradley - Huddersfield - Quarmby. Seen a Deighton Keldregate. 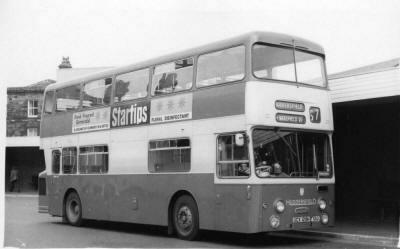 57 Huddersfield - Lepton. 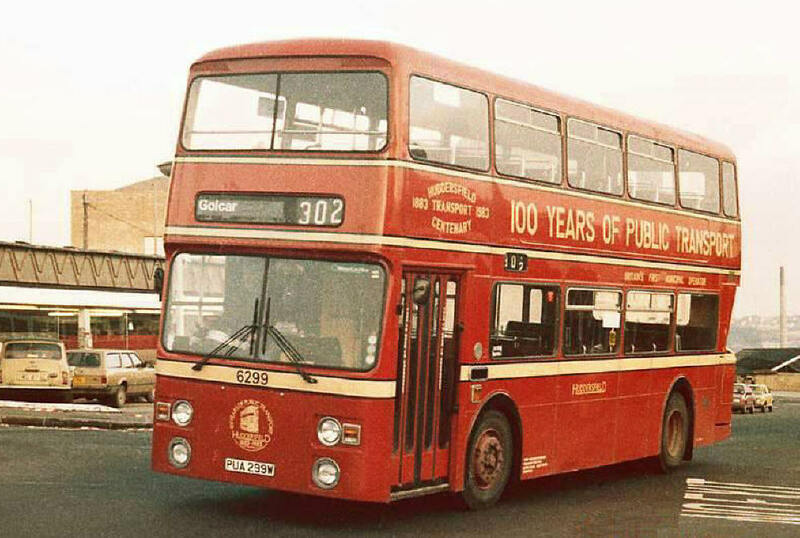 Seen at Huddersfield Bus Station. 4118 (EVH118C) Daimler CVG6LX30DD30322 with C.H.Roe GO6063 H39/31F body built 10/1965, Ex Huddersfield Corporation 118 on 1 4 1974. Originally owned by Huddersfield Joint Omnibus Committee (Corporation). 4119 (EVH119C) Daimler CVG6LX30DD30323 with C.H.Roe GO6064 H39/31F body built 10/1965, Ex Huddersfield Corporation 119 on 1 4 1974. Originally owned by Huddersfield Joint Omnibus Committee (Railway/State). 4120 (EVH120C) Daimler CVG6LX30DD30324 with C.H.Roe GO6065 H39/31F body built 10/1965, Ex Huddersfield Corporation 120 on 1 4 1974. 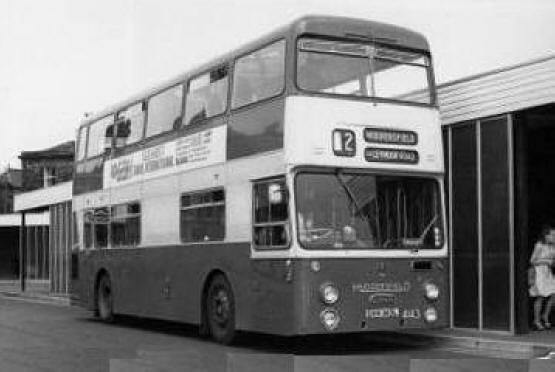 Originally owned by Huddersfield Joint Omnibus Committee (Corporation). 4121 (EVH121C) Daimler CVG6LX30DD30325 with C.H.Roe GO6066 H39/31F body built 10/1965, Ex Huddersfield Corporation 121 on 1 4 1974. 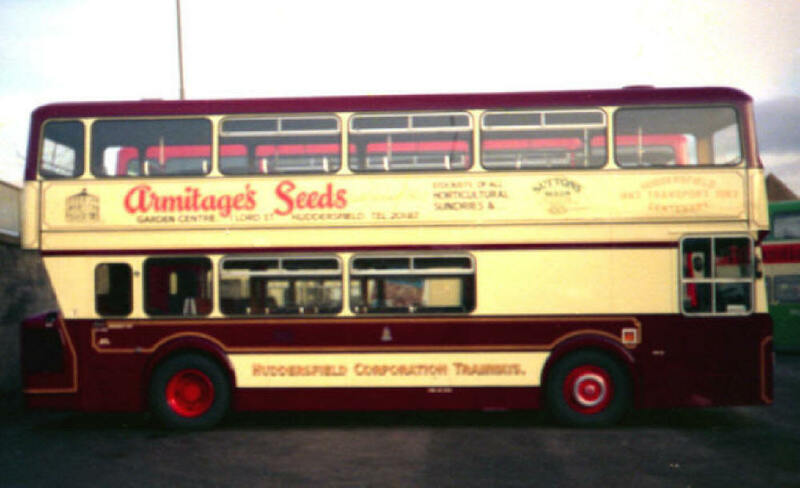 Originally owned by Huddersfield Joint Omnibus Committee (Railway/State). 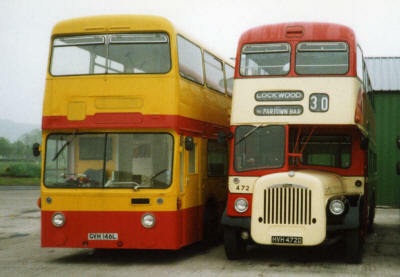 40 Longwood - Huddersfield - Bradley. Seen at St. Georges Square. 4122 (EVH122C) Daimler CVG6LX30DD30326 with C.H.Roe GO6066 H40/30F body built 10/1965, Ex Huddersfield Corporation 122 on 1 4 1974. Originally owned by Huddersfield Joint Omnibus Committee (Corpororation). 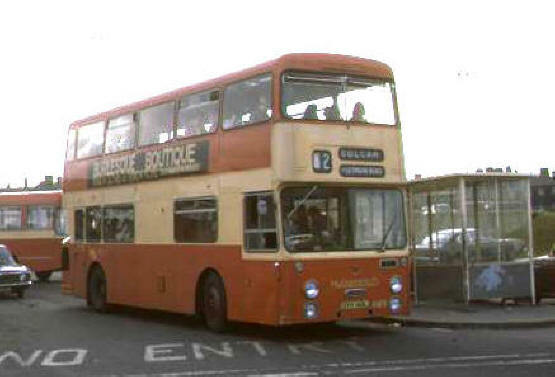 19 Huddersfield - Dean Bottom - Storthes Hall Hospital. 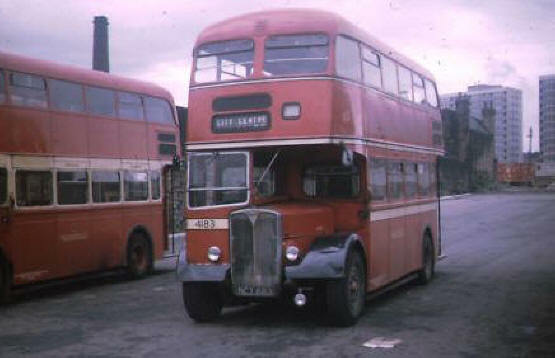 Seen at Huddersfield Bus Station. 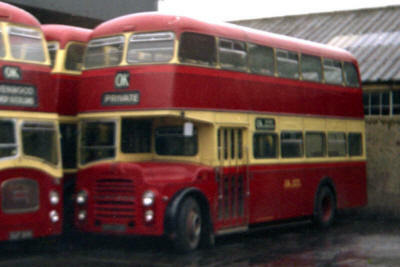 4123 (RCX123G) Daimler Fleetline CRG6LX63220 with C.H.Roe GO6670 H43/32F body built 2/1969, Ex Huddersfield Corporation 123 on 1 4 1974. Originally owned by Huddersfield Joint Omnibus Committee (Railway/State). 4124 (RCX124G) Daimler Fleetline CRG6LX63221 with C.H.Roe GO6671 H43/32F body built 2/1969, Ex Huddersfield Corporation 124 on 1 4 1974. 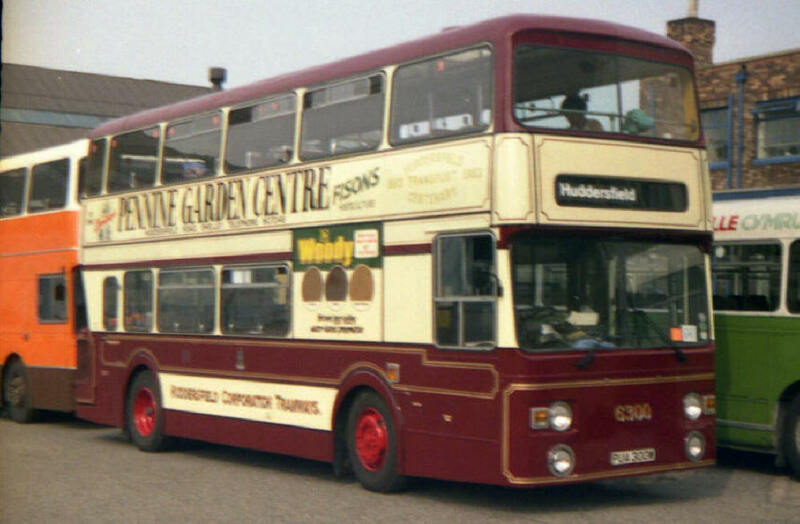 Originally owned by Huddersfield Joint Omnibus Committee (Corporation). 4125 (RCX125G) Daimler Fleetline CRG6LX63222 with C.H.Roe GO6672 H43/32F body built 2/1969, Ex Huddersfield Corporation 125 on 1 4 1974. Originally owned by Huddersfield Joint Omnibus Committee (Railway/State). 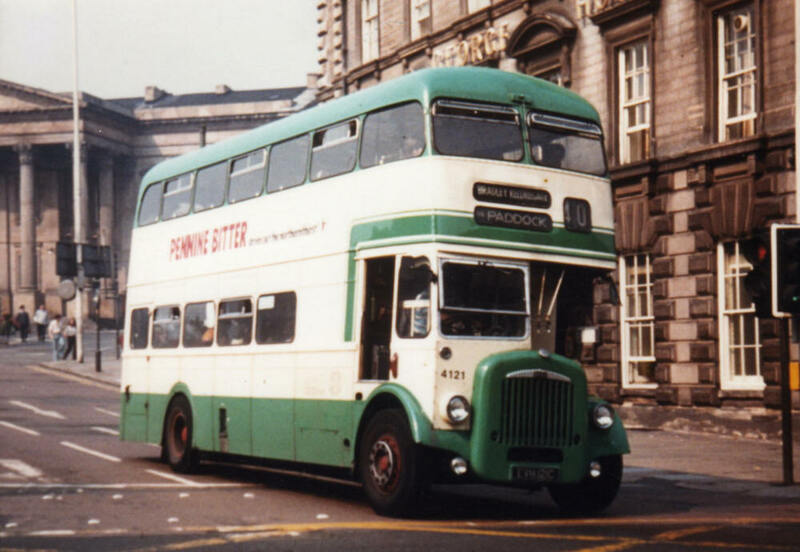 4126 (RCX126G) Daimler Fleetline CRG6LX63223 with C.H.Roe GO6673 H43/32F body built 2/1969, Ex Huddersfield Corporation 126 on 1 4 1974. 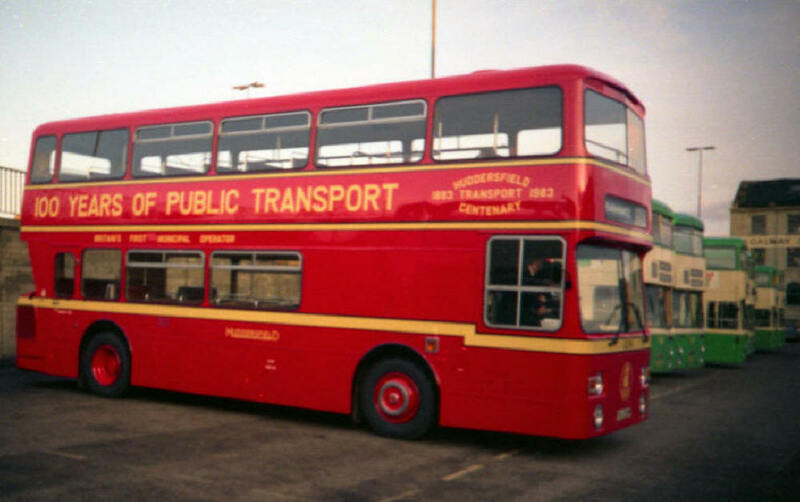 Originally owned by Huddersfield Joint Omnibus Committee (Corporation). 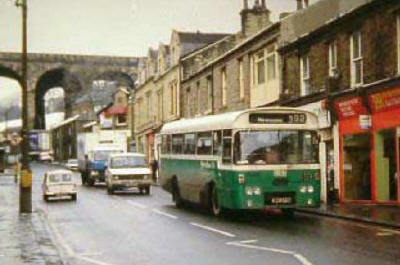 20 Newsome South - Huddersfield - Rastrick - Brighouse - Bailiff Bridge. Seen at Huddersfield Market Street. 4127 (RCX127G) Daimler Fleetline CRG6LX63224 with C.H.Roe GO6674 H43/32F body built 2/1969, Ex Huddersfield Corporation 127 on 1 4 1974. 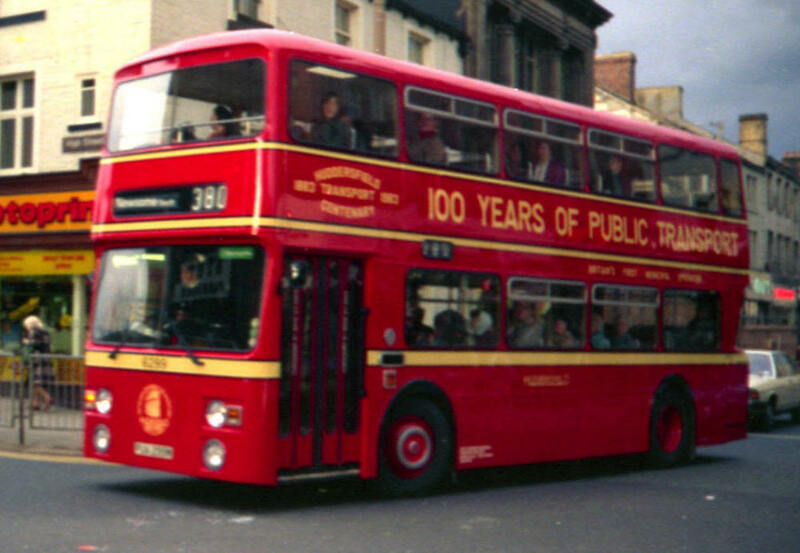 Originally owned by Huddersfield Joint Omnibus Committee (Railway/State). 66 Bradley Sanatorium - Huddersfield - Milnsbridge - Helme - Meltham. Seen at Huddersfield New Street. 4128 (RCX128G) Daimler Fleetline CRG6LX63225 with C.H.Roe GO6675 H43/32F body built 2/1969, Ex Huddersfield Corporation 128 on 1 4 1974. 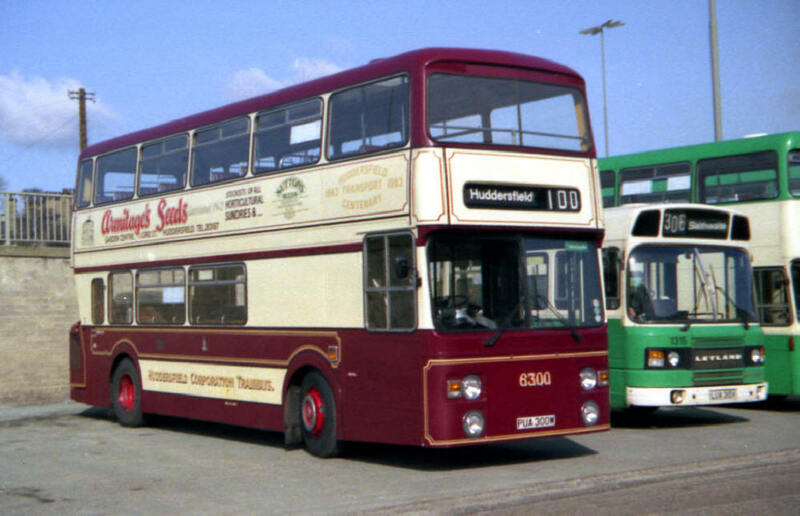 Originally owned by Huddersfield Joint Omnibus Committee (Corporation). 4129 (UCX129H) Daimler Fleetline CRG6LX63821 with C.H.Roe GO6852 H45/29D body built 1970, Ex Huddersfield Corporation 129 on 1 4 1974. 57 Huddersfield - Lepton. Seen in Huddersfield Bus Station. 357 Huddersfield - Grosvenor Road - Kirkheaton. Seen at St. Georges Square. 4131 (UCX131H) Daimler Fleetline CRG6LX63823 with C.H.Roe GO6856 H45/29D body built 1970, Ex Huddersfield Corporation 131 on 1 4 1974. 4132 (UCX132H) Daimler Fleetline CRG6LX63824 with C.H.Roe GO6855 H45/29D body built 1970, Ex Huddersfield Corporation 132 on 1 4 1974. 4133 (UCX133H) Daimler Fleetline CRG6LX63825 with C.H.Roe GO6854 H45/29D body built 1970, Ex Huddersfield Corporation 133 on 1 4 1974. 4134 (UCX134H) Daimler Fleetline CRG6LX63826 with C.H.Roe GO6853 H45/29D body built 1970, Ex Huddersfield Corporation 134 on 1 4 1974. 4135 (YVH535K) Daimler Fleetline CRG6LX64764 with C.H.Roe GO7075 H45/29D body built 1971, Ex Huddersfield Corporation 135 on 1 4 1974. 4136 (YVH536K) Daimler Fleetline CRG6LX64765 with C.H.Roe GO7074 H45/29D body built 1971, Ex Huddersfield Corporation 136 on 1 4 1974. 4137 (YVH537K) Daimler Fleetline CRG6LX64766 with C.H.Roe GO7072 H45/29D body built 1971, Ex Huddersfield Corporation 137 on 1 4 1974. 4138 (YVH538K) Daimler Fleetline CRG6LX64767 with C.H.Roe GO7073 H45/29D body built 1971, Ex Huddersfield Corporation 138 on 1 4 1974. 30 Huddersfield - Almondbury. Seen at Huddersfield Westgate. 4139 (YVH539K) Daimler Fleetline CRG6LX64768 with C.H.Roe GO7077 H45/29D body built 1971, Ex Huddersfield Corporation 139 on 1 4 1974. 4140 (YVH540K) Daimler Fleetline CRG6LX64769 with C.H.Roe GO7076 H45/29D body built 1971, Ex Huddersfield Corporation 140 on 1 4 1974. 4141 (GVH141L) Daimler Fleetline CRG6LX66808 with C.H.Roe GO7322 H45/29D body built 1973, Ex Huddersfield Corporation 141 on 1 4 1974. 4142 (GVH142L) Daimler Fleetline CRG6LX66809 with C.H.Roe GO7321 H45/29D body built 1973, Ex Huddersfield Corporation 142 on 1 4 1974. 4143 (GVH143L) Daimler Fleetline CRG6LX66810 with C.H.Roe GO7320 H45/29D body built 1973, Ex Huddersfield Corporation 143 on 1 4 1974. 2 Huddersfield - Milnsbridge - Golcar. Seen at Huddersfield Bus Station. 4144 (GVH144L) Daimler Fleetline CRG6LX66811 with C.H.Roe GO7316 H45/29D body built 1973, Ex Huddersfield Corporation 144 on 1 4 1974. 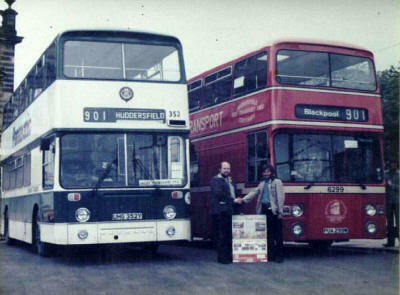 30 Huddersfield - Almondbury. Seen at Huddersfield Bus Station. 4145 (GVH145L) Daimler Fleetline CRG6LX66812 with C.H.Roe GO7314 H45/29D body built 1973, Ex Huddersfield Corporation 145 on 1 4 1974. 4146 (GVH146L) Daimler Fleetline CRG6LX66813 with C.H.Roe GO7315 H45/29D body built 1973, Ex Huddersfield Corporation 146 on 1 4 1974. Became Huddersfield Children's Centre Play Bus. Childrens Centre Bus with preserved Huddersfield 472 at First Fieldhouse Lane Depot. 4147 (GVH147L) Daimler Fleetline CRG6LX66814 with C.H.Roe GO7313 H45/29D body built 1973, Ex Huddersfield Corporation 147 on 1 4 1974. 4148 (GVH148L) Daimler Fleetline CRG6LX66815 with C.H.Roe GO7319 H45/29D body built 1973, Ex Huddersfield Corporation 148 on 1 4 1974. 4149 (GVH149L) Daimler Fleetline CRG6LX66816 with C.H.Roe GO7317 H45/29D body built 1973, Ex Huddersfield Corporation 149 on 1 4 1974. 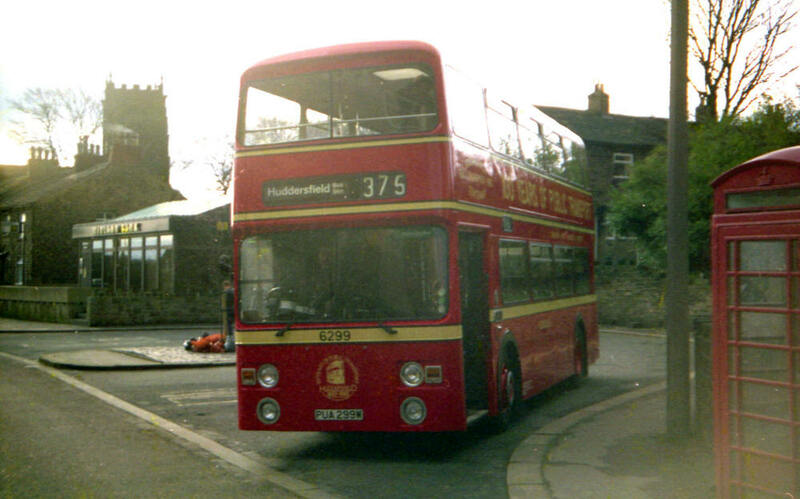 370 Rawthorpe - Huddersfield - Crosland Road. 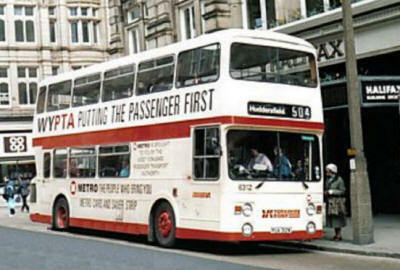 Seen at Huddersfield Westgate. 356 Huddersfield - Grosvenor Road - Kirkheaton. Seen at Huddersfield Bus Station. 4150 (GVH150L) Daimler Fleetline CRG6LX66817 with C.H.Roe GO7318 H45/29D body built 1973, Ex Huddersfield Corporation 140 on 1 4 1974. 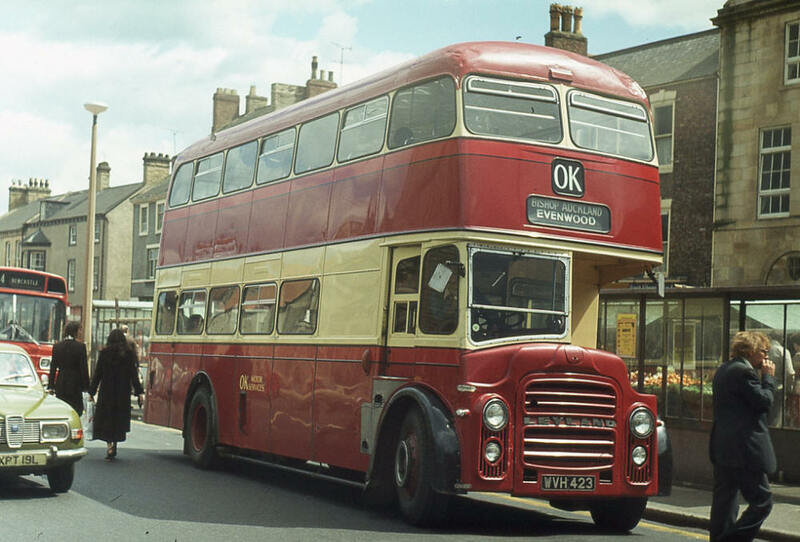 4176 (JVH376) AEC Regent lll 9613E4924 with East Lancashire 5105 H33/28R body built 7/1955, Ex Huddersfield Corporation 176 on 1 4 1974 not used. 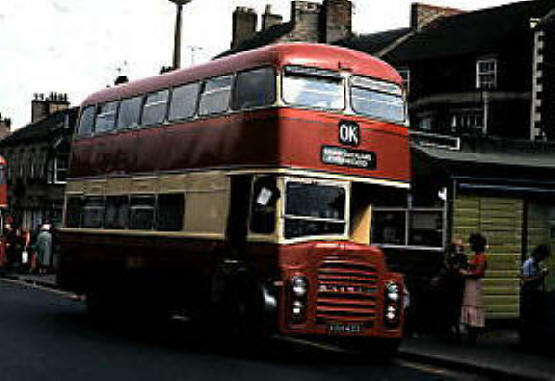 Originally owned by Huddersfield Joint Omnibus Committee (Corporation). On Training Duty. 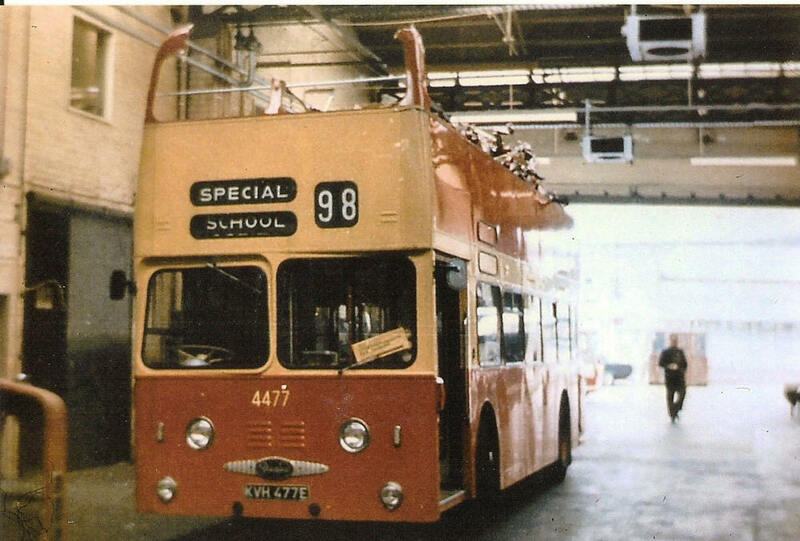 Seen at Bradford Depot. 4182 (NCX682) AEC Regent V D2RA437 with C.H.Roe GO4645 H37/28R body built 1958, Ex Huddersfield Corporation 182 on 1 4 1974 on loan to Bradford Corporation. Transferred to Bradford District. 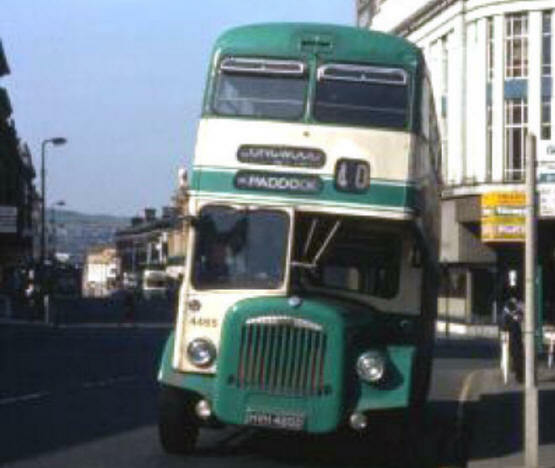 Originally owned by Huddersfield Joint Omnibus Committee (Corporation). 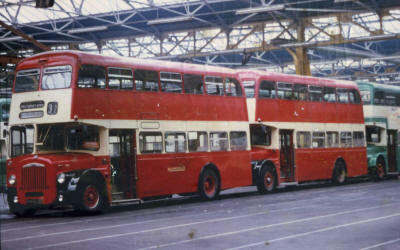 4183 (NCX683) AEC Regent V D2RA438 with C.H.Roe GO4646 H37/28R body built 1958, Ex Huddersfield Corporation 183 on 1 4 1974. 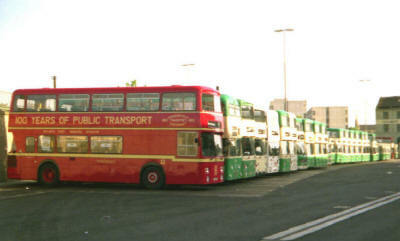 Transferred to Bradford District. Originally owned by Huddersfield Joint Omnibus Committee (Railway/State). 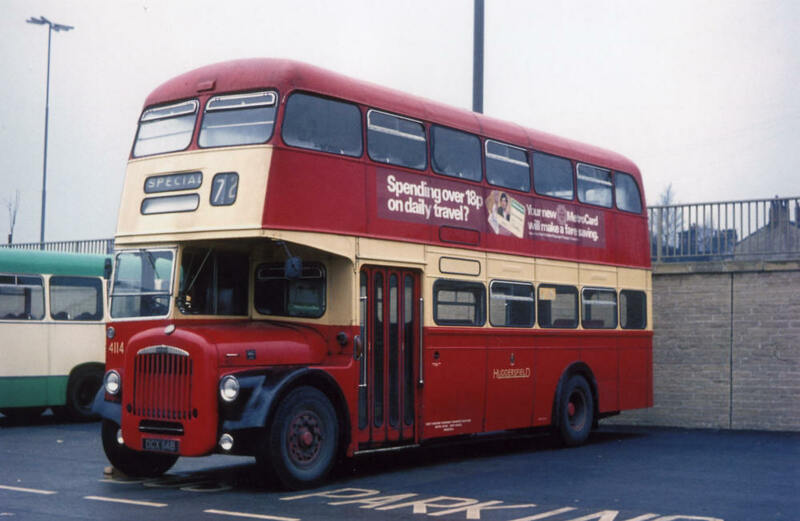 4184 (NCX684) AEC Regent V D2RA439 with C.H.Roe GO4647 H37/28R body built 1958, Ex Huddersfield Corporation 184 on 1 4 1974. 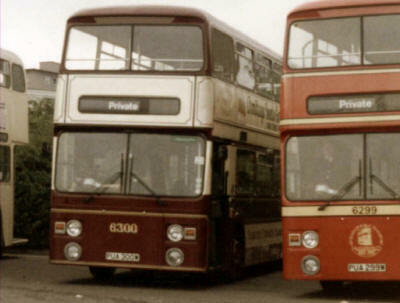 Transferred to Bradford District. 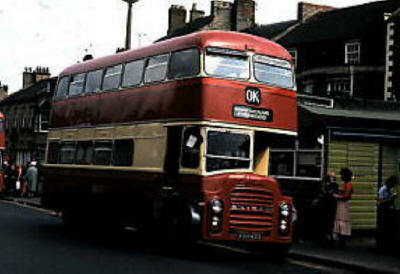 Originally owned by Huddersfield Joint Omnibus Committee (Corporation). 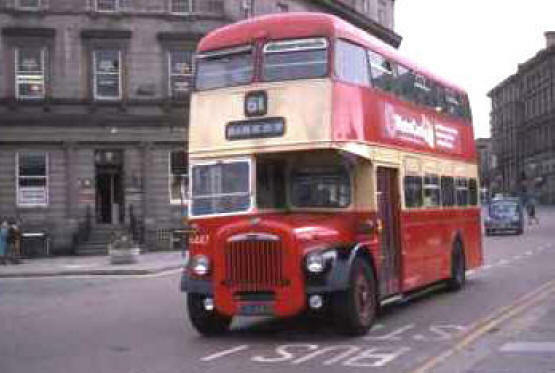 Seen in Bradford bound for St Enochs Rd Top. 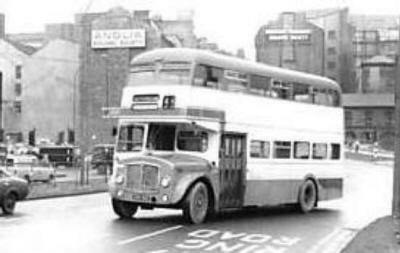 Seen in Bradford bound for Saltaire. 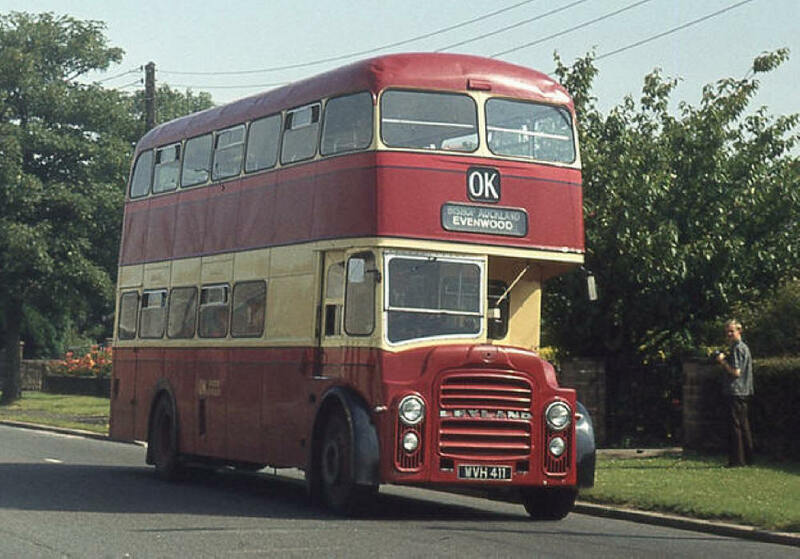 4187 (NCX687) AEC Regent V D2RA442 with C.H.Roe GO4650 H37/28R body built 1958, Ex Huddersfield Corporation 187 on 1 4 1974. 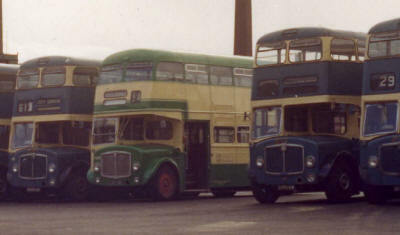 Transferred to Bradford District. 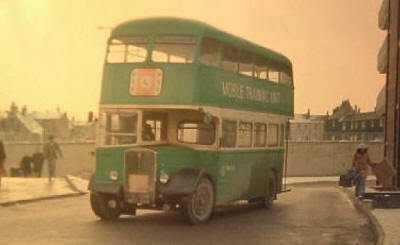 Originally owned by Huddersfield Joint Omnibus Committee (Railway/State). 4188 (NCX688) AEC Regent V D2RA443 with C.H.Roe GO4643 H37/28R body built 1958, Ex Huddersfield Corporation 188 on 1 4 1974. 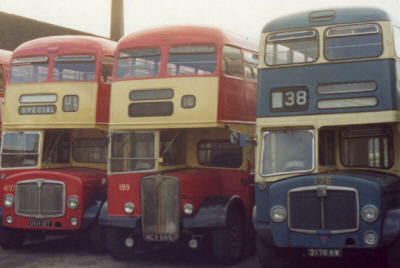 Transferred to Bradford District. 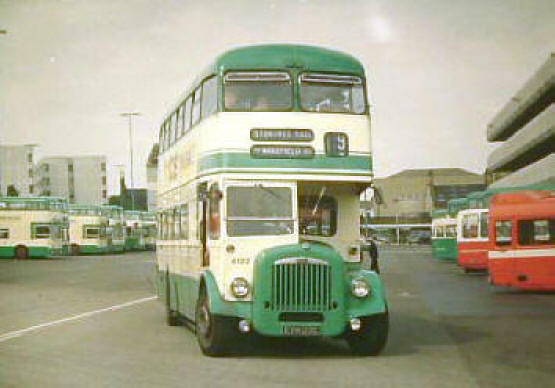 Originally owned by Huddersfield Joint Omnibus Committee (Corporation). 4189 (NCX889) AEC Regent V D2RA444 with C.H.Roe H37/28R body built 1958, Ex Huddersfield Corporation 189 on 1 4 1974 on loan to Bradford Corporation. 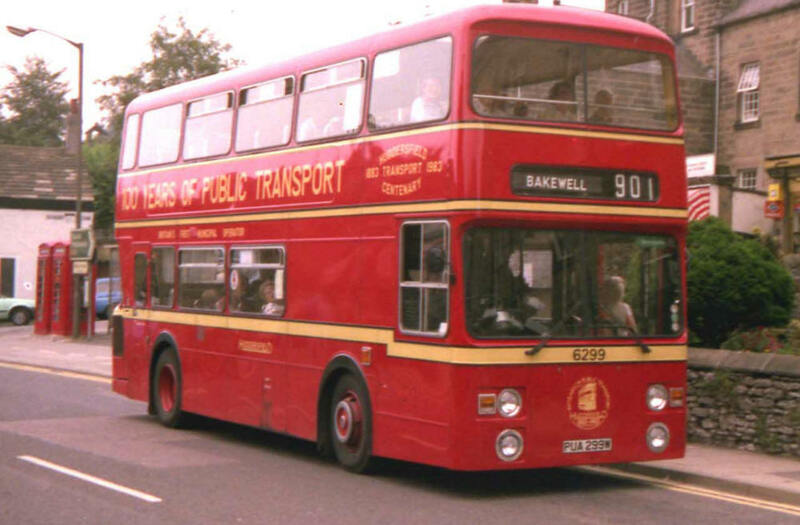 Transferred to Bradford District. 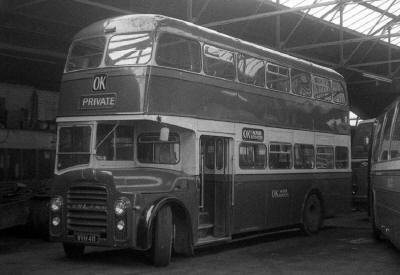 Originally owned by Huddersfield Joint Omnibus Committee (Railway/State). 4190 (PVH990) Guy Arab FD74319 with East Lancashire 5611 H37/28R body built 1959, Ex Huddersfield Corporation 190 on 1 4 1974. 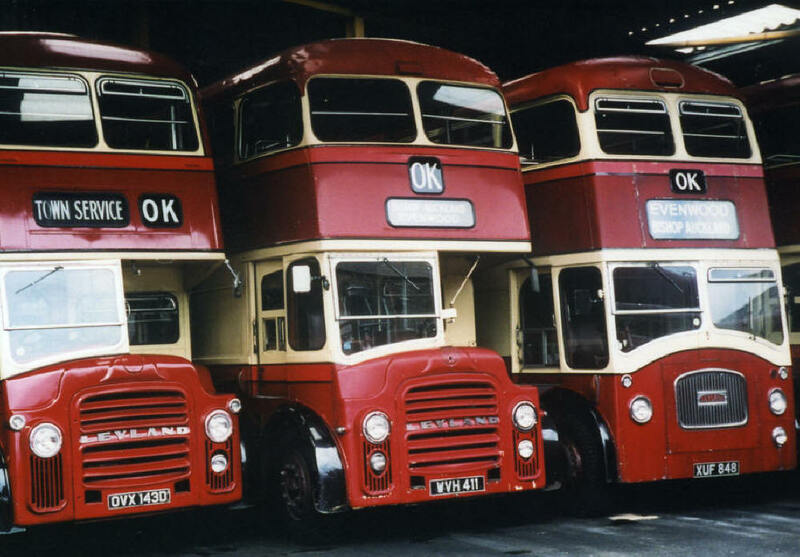 Originally owned by Huddersfield Joint Omnibus Committee (Corporation). 4191 (PVH991) Guy Arab FD74341 with East Lancashire 5612 H37/28R body built 1959, Ex Huddersfield Corporation 191 on 1 4 1974. Originally owned by Huddersfield Joint Omnibus Committee (Railway/State). Was Preserved. 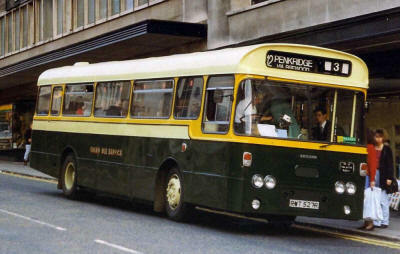 4192 (PVH992) AEC Regent V 2D2RA725 with East Lancashire 5613 H37/28R body built 1960, Ex Huddersfield Corporation 192 on 1 4 1974. 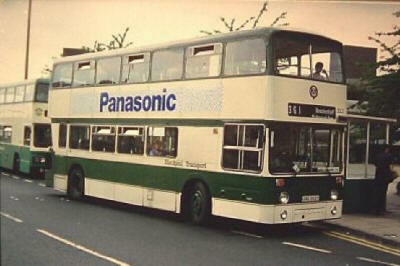 Originally owned by Huddersfield Joint Omnibus Committee (Corporation). 4193 (PVH993) AEC Regent V 2D2RA726 with East Lancashire 5614 H37/28R body built 1960, Ex Huddersfield Corporation 193 on 1 4 1974. Originally owned by Huddersfield Joint Omnibus Committee (Railway/State). 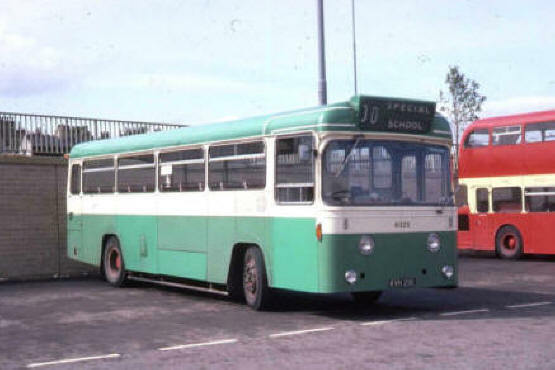 4196 (UVH196) AEC Regent V 2D2RA1035 with C.H.Roe GO5381 H39/31F body built 1962, Ex Huddersfield Corporation 196 on 1 4 1974. Originally owned by Huddersfield Joint Omnibus Committee (Corporation). 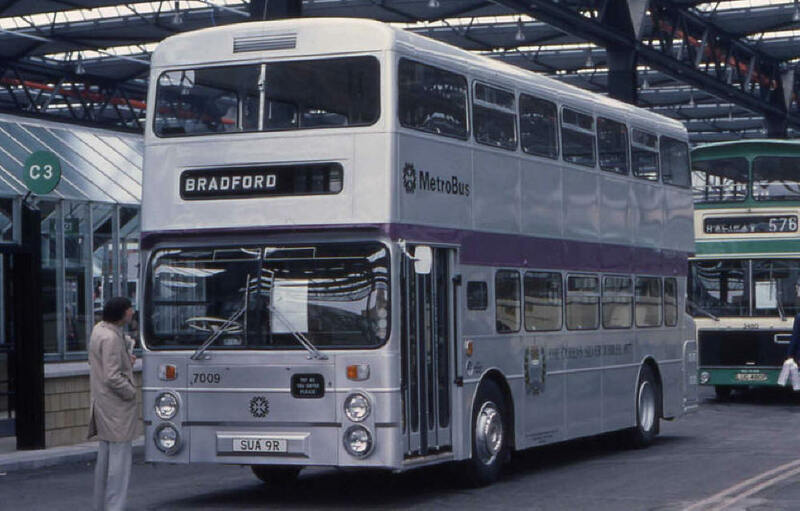 Transferred to Bradford District. 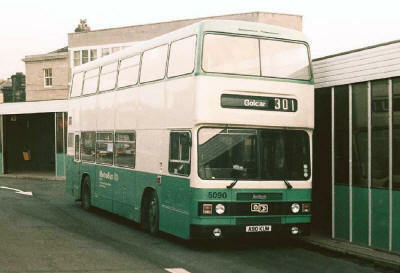 30 Bradford Tyersal At Bradford Centre. 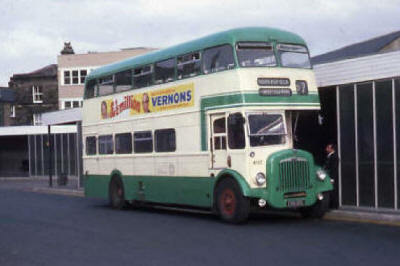 4197 (UVH197) AEC Regent V 2D2RA1036 with C.H.Roe GO5382 H39/31F body built 1962, Ex Huddersfield Corporation 197 on 1 4 1974. 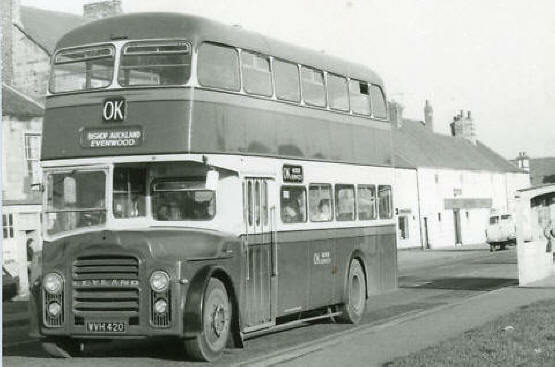 Originally owned by Huddersfield Joint Omnibus Committee (Railway/State). Transferred to Bradford District. 4198 (UVH198) AEC Regent V 2D2RA1037 with C.H.Roe GO5380 H39/31F body built 1962, Ex Huddersfield Corporation 198 on 1 4 1974. 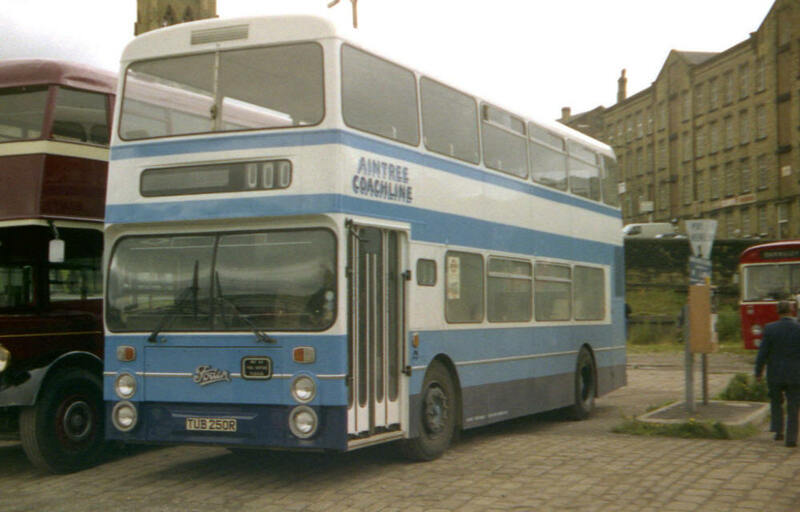 Originally owned by Huddersfield Joint Omnibus Committee (Corporation). Transferred to Bradford District. 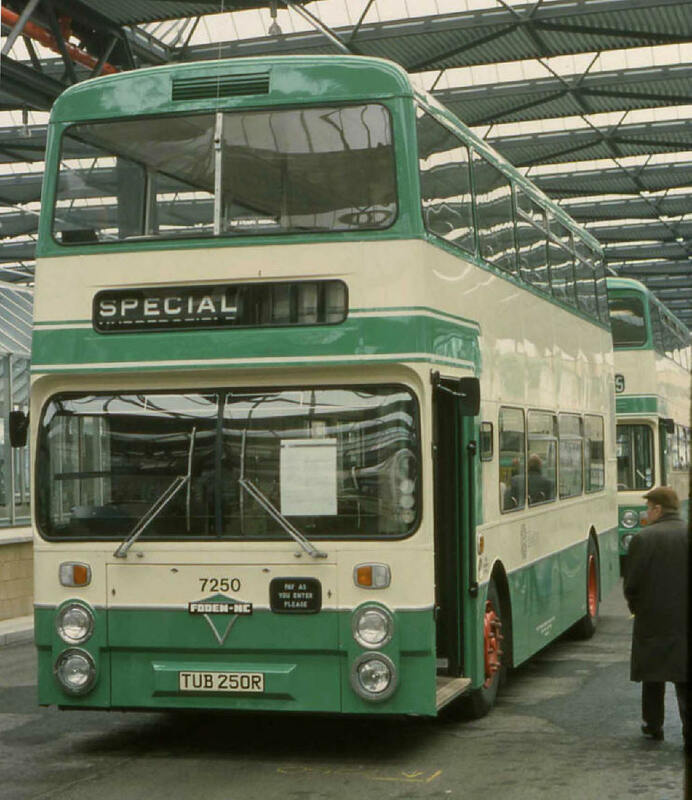 4199 (UVH199) AEC Regent V 2D2RA1038 with C.H.Roe GO5383 H39/31F body built 1962, Ex Huddersfield Corporation 199 on 1 4 1974. 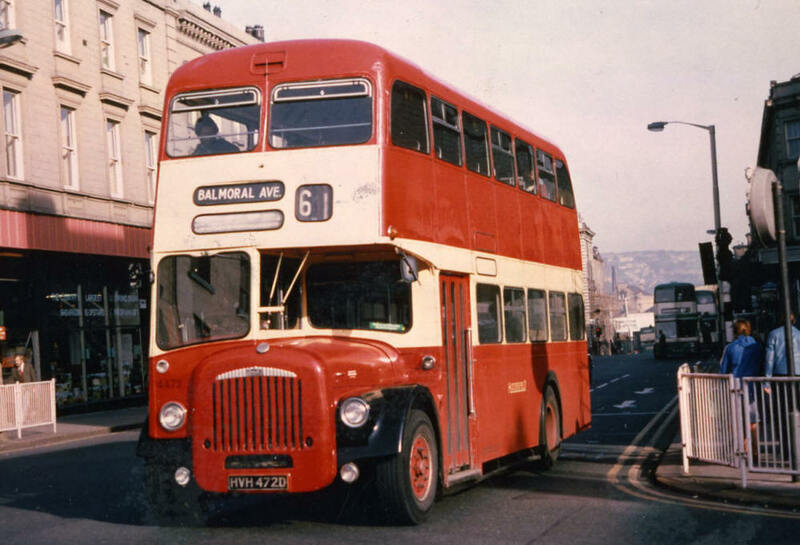 Originally owned by Huddersfield Joint Omnibus Committee (Corporation). Transferred to Bradford District. 4200 (UVH200) AEC Regent V 2D2RA1039 with C.H.Roe GO5384 H39/31F body built 1962, Ex Huddersfield Corporation 200 on 1 4 1974. 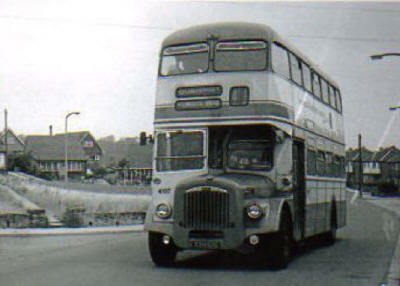 Originally owned by Huddersfield Joint Omnibus Committee (Corporation). Transferred to Bradford District. 4201 (UVH201) AEC Regent V 2D2RA1040 with C.H.Roe GO5385 H39/31F body built 1962, Ex Huddersfield Corporation 201 on 1 4 1974. 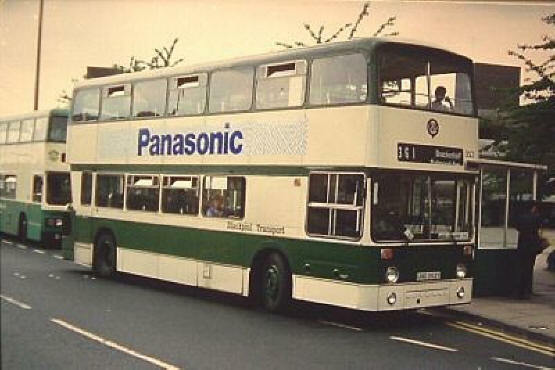 Originally owned by Huddersfield Joint Omnibus Committee (Corporation). Transferred to Bradford District. 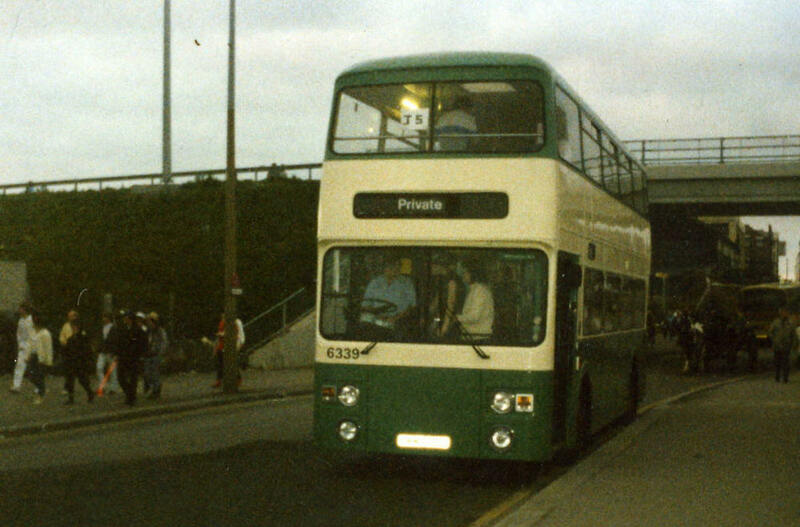 34 Bradford - Wibsey. At Bradford Centre. 4401 (UCX401) Leyland Titan PD3A/2 611410 with C.H.Roe GO5373 H39/31F body built 11/1961, Ex Huddersfield Corporation 401 on 1 4 1974. 61 Balmoral Avenue - Huddersfield - Birkby. Seen at Huddersfield St. Georges Square. 4402 (UCX402) Leyland Titan PD3A/2 611411 with C.H.Roe GO5374 H39/31F body built 11/1961, Ex Huddersfield Corporation 402 on 1 4 1974. 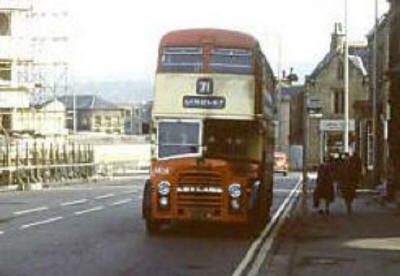 73 Outlane - Huddersfield - Waterloo. Seen at St. Georges Square. 4403 (UCX403) Leyland Titan PD3A/2 611412 with C.H.Roe GO5372 H39/31F body built 11/1961, Ex Huddersfield Corporation 403 on 1 4 1974. 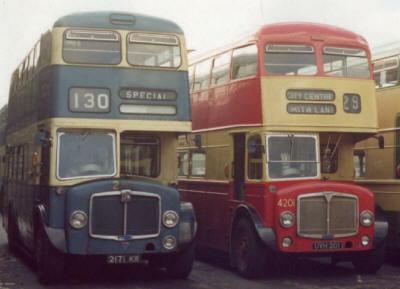 41 Bradley - Huddersfield - Quarmby. Seen on New Street. 4404 (UCX404) Leyland Titan PD3A/2 611420 with C.H.Roe GO5375 H39/31F body built 11/1961, Ex Huddersfield Corporation 404 on 1 4 1974. 71 Dalton - Huddersfield - Lindley. Seen on Trinity Street. 4405 (UCX405) Leyland Titan PD3A/2 611421 with C.H.Roe GO5377 H39/31F body built 11/1961, Ex Huddersfield Corporation 405 on 1 4 1974. 4406 (UCX406) Leyland Titan PD3A/2 611422 with C.H.Roe GO5378 H39/31F body built 11/1961, Ex Huddersfield Corporation 406 on 1 4 1974. Seen on John William Street. 4407 (UCX407) Leyland Titan PD3A/2 611423 with C.H.Roe GO5376 H39/31F body built 11/1961, Ex Huddersfield Corporation 407 on 1 4 1974. 4408 (UCX408) Leyland Titan PD3A/2 611451 with C.H.Roe GO5379 H39/31F body built 11/1961, Ex Huddersfield Corporation 408 on 1 4 1974. 4409 (WVH409) Leyland Titan PD3A/2 622040 with C.H.Roe GO5514 H39/31F body built 10/1962, Ex Huddersfield Corporation 409 on 1 4 1974. 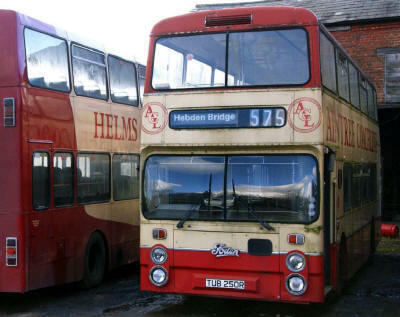 42 Haifax - Elland - Huddersfield. 4411 (WVH411) Leyland Titan PD3A/2 622052 with C.H.Roe GO5515 H39/31F body built 10/1962, Ex Huddersfield Corporation 411 on 1 4 1974. Loaned to Sheffield Corporation in 1973 (Oct-Nov) Sold to O.K. Motor Services, Bishop Auckland. 60 Birkby - Huddersfield - Crosland Hill. Seen in High Street. Seen with OK Motor Services, Bishop Auckland. 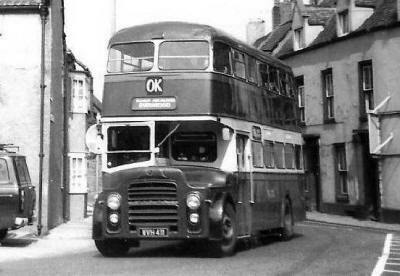 Seen with OK Motor Services, Bishop Auckland. Seen at Bishop Auckland Depot. 76 Bradford - Halifax. Seen in Bradford. 77 Bradford - Halifax. Seen in Halifax Bus Station. 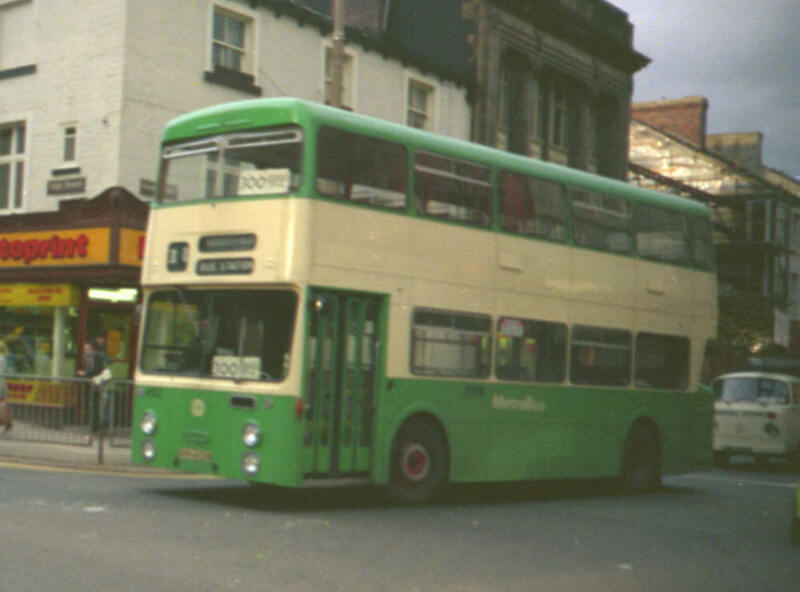 77 Bradford - Halifax. Seen in Bradford Bus Station. 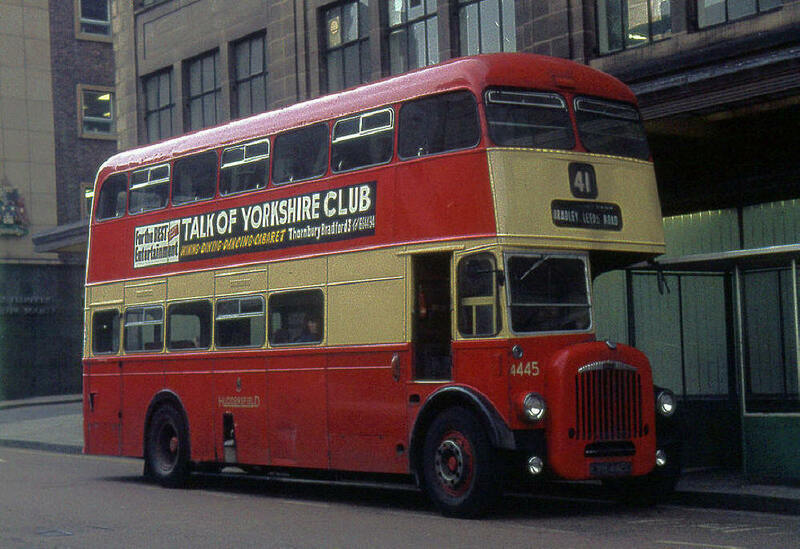 4414 (WVH414) Leyland Titan PD3A/2 622071 with C.H.Roe GO5518 H39/31F body built 10/1962, Ex Huddersfield Corporation 414 on 1 4 1974 on loan to Bradford Corporation. 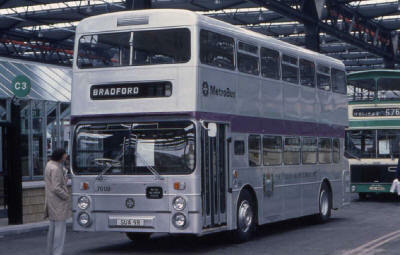 Transferred to Bradford District. Seen in Halifax by the Bus Station. 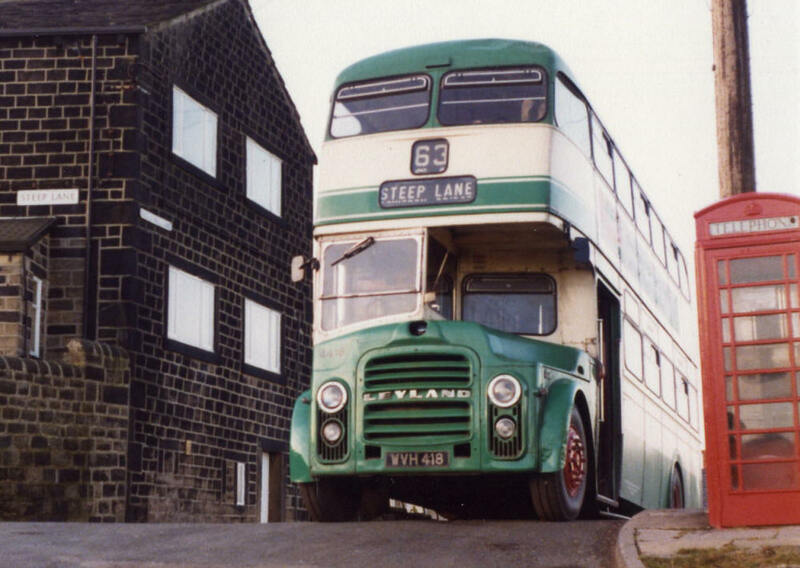 4416 (WVH416) Leyland Titan PD3A/2 622105 with C.H.Roe GO5521 H39/31F body built 1/1963, Ex Huddersfield Corporation 416 on 1 4 1974. 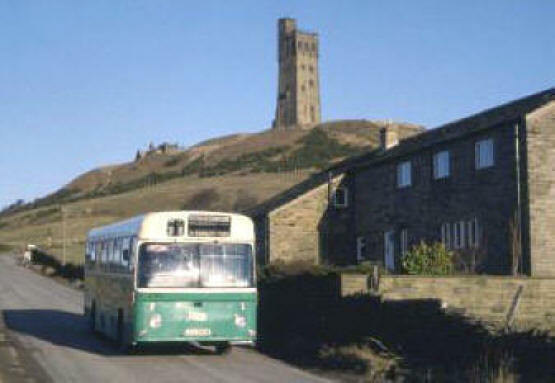 63 Halifax - Steep Lane. 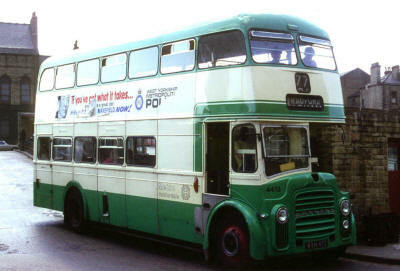 4420 (WVH420) Leyland Titan PD3A/2 623355 with C.H.Roe GO5599 H39/31F body built 1/1963, Ex Huddersfield Corporation 420 on 1 4 1974. 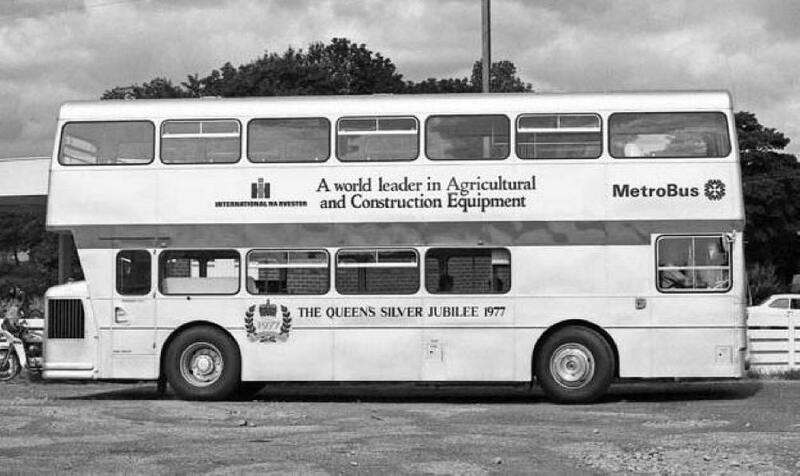 Loaned to Sheffield Corporation in 1973 (Sep-Nov) Sold to O.K. Motor Services, Bishop Auckland. 4421 (WVH421) Leyland Titan PD3A/2 623356 with C.H.Roe GO5601 H39/31F body built 1/1963, Ex Huddersfield Corporation 421 on 1 4 1974. 4423 (WVH423) Leyland Titan PD3A/2 623370 with C.H.Roe GO5602 H39/31F body built 1/1963, Ex Huddersfield Corporation 423 on 1 4 1974. Re engined with a Leyland O680 engine. Sold to O.K. Motor Services, Bishop Auckland. 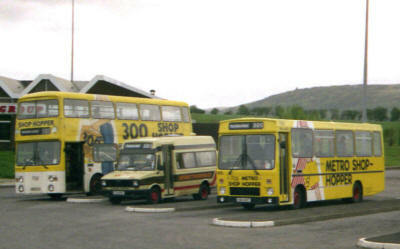 Seen in Halifax Bus Depot. 4425 (AVH425B) Daimler CVG6LX30DD30233 with C.H.Roe GO5790 H39/31F body built 1/1964, Ex Huddersfield Corporation 425 on 1 4 1974. 4426 (AVH426B) Daimler CVG6LX30DD30234 with C.H.Roe GO5791 H39/31F body built 1/1964, Ex Huddersfield Corporation 426 on 1 4 1974. 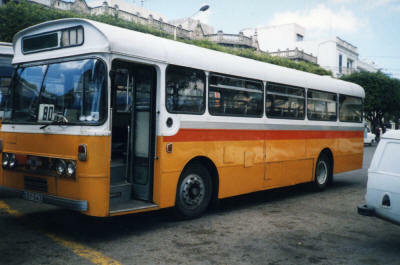 72 Huddersfield - Dalton. Seen in on Kirkgate. 11 Brackenhall - Huddersfield - Holmfirth - Holmbridge. Seen in High Street. 4427 (AVH427B) Daimler CVG6LX30DD30235 with C.H.Roe GO5793 H39/31F body built 1/1964, Ex Huddersfield Corporation 427 on 1 4 1974. 4428 (AVH428B) Daimler CVG6LX30DD30236 with C.H.Roe GO5788 H39/31F body built 1/1964, Ex Huddersfield Corporation 428 on 1 4 1974. 4429 (AVH429B) Daimler CVG6LX30DD30237 with C.H.Roe GO5792 H39/31F body built 1/1964, Ex Huddersfield Corporation 429 on 1 4 1974. 41 Quarmby - Huddersfield - Bradley. 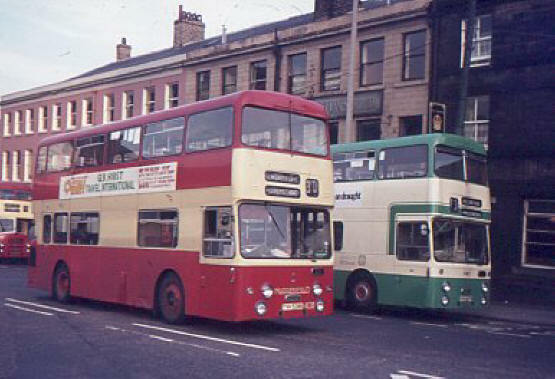 Seen on Leeds Road. 4430 (AVH430B) Daimler CVG6LX30DD30238 with C.H.Roe GO5787 H39/31F body built 1/1964, Ex Huddersfield Corporation 430 on 1 4 1974. 4431 (AVH431B) Daimler CVG6LX30DD30239 with C.H.Roe GO5794 H39/31F body built 1/1964, Ex Huddersfield Corporation 431 on 1 4 1974. 4432 (AVH432B) Daimler CVG6LX30DD30240 with C.H.Roe GO5786 H39/31F body built 1/1964, Ex Huddersfield Corporation 432 on 1 4 1974. 4433 (AVH433B) Daimler CVG6LX30DD30241 with C.H.Roe GO5789 H39/31F body built 1/1964, Ex Huddersfield Corporation 433 on 1 4 1974. 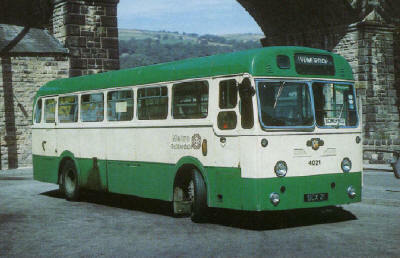 4434 (AVH434B) Daimler CVG6LX30DD30242 with C.H.Roe GO5785 H39/31F body built 1/1964, Ex Huddersfield Corporation 434 on 1 4 1974. 4435 (CCX435B) Daimler CVG6LX30DD30252 with East Lancashire 6206 H39/31F body built 1964, Ex Huddersfield Corporation 435 on 1 4 1974. Destinations rebuilt to J.O.C. style. 4436 (CCX436B) Daimler CVG6LX30DD30249 with East Lancashire 6204 H39/31F body built 1964, Ex Huddersfield Corporation 436 on 1 4 1974. Destinations rebuilt to J.O.C. style. 4437 (CCX437B) Daimler CVG6LX30DD30253 with East Lancashire 6207 H39/31F body built 1964, Ex Huddersfield Corporation 437 on 1 4 1974. 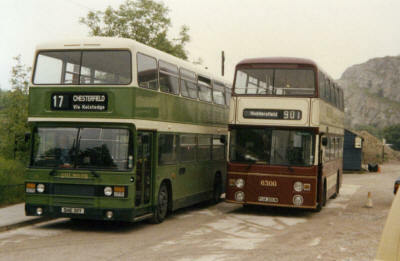 Destinations rebuilt to J.O.C. style. 4438 (CCX438B) Daimler CVG6LX30DD30250 with East Lancashire 6203 H39/31F body built 1964, Ex Huddersfield Corporation 438 on 1 4 1974. 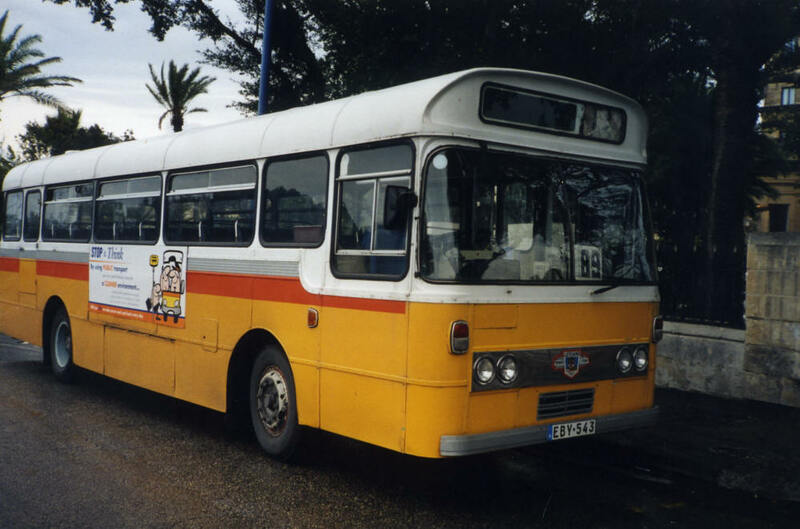 Destinations rebuilt to J.O.C. style. 4439 (CCX439B) Daimler CVG6LX30DD30254 with East Lancashire 6205 H39/31F body built 1964, Ex Huddersfield Corporation 439 on 1 4 1974. Destinations rebuilt to J.O.C. style. 4440 (CCX440B) Daimler CVG6LX30DD30251 with East Lancashire 6208 H39/31F body built 1964, Ex Huddersfield Corporation 440 on 1 4 1974. Destinations rebuilt to J.O.C. style. 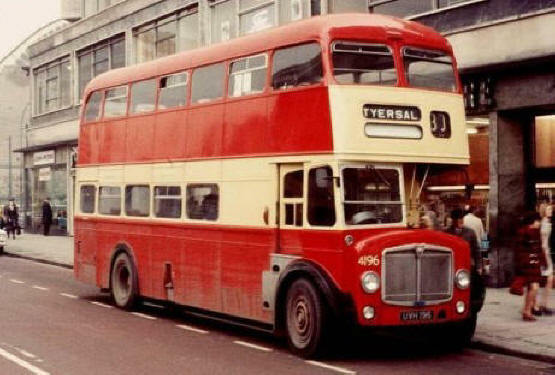 4441 (EVH441C) Daimler CVG6LX30DD30305 with C.H.Roe GO6052 H39/31F body built 6/1965, Ex Huddersfield Corporation 441 on 1 4 1974. 4442 (EVH442C) Daimler CVG6LX30DD30306 with C.H.Roe GO6053 H39/31F body built 6/1965, Ex Huddersfield Corporation 442 on 1 4 1974. 4443 (EVH443C) Daimler CVG6LX30DD30307 with C.H.Roe GO6051 H39/31F body built 6/1965, Ex Huddersfield Corporation 443 on 1 4 1974. 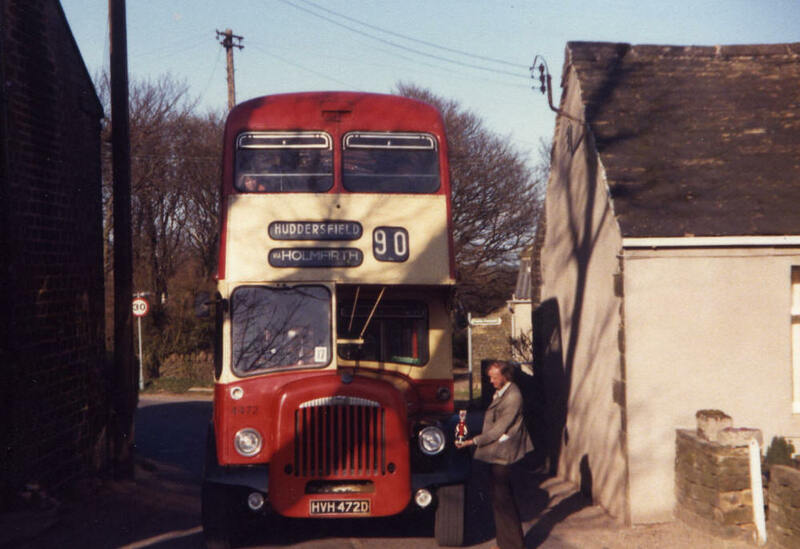 4444 (EVH444C) Daimler CVG6LX30DD30308 with C.H.Roe GO6050 H39/31F body built 6/1965, Ex Huddersfield Corporation 444 on 1 4 1974. 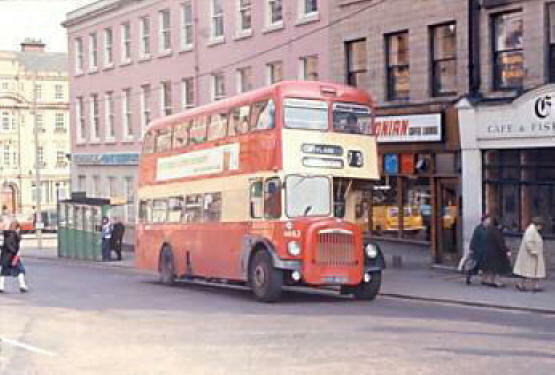 4445 (EVH445C) Daimler CVG6LX30DD30309 with C.H.Roe GO6054 H39/31F body built 6/1965, Ex Huddersfield Corporation 445 on 1 4 1974. 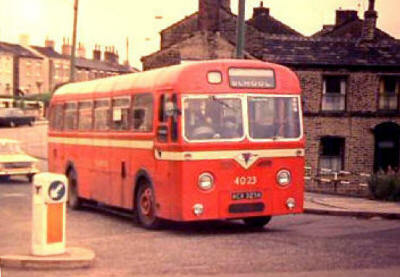 41 Quarmby - Huddersfield - Bradley. Seen on Market Street. 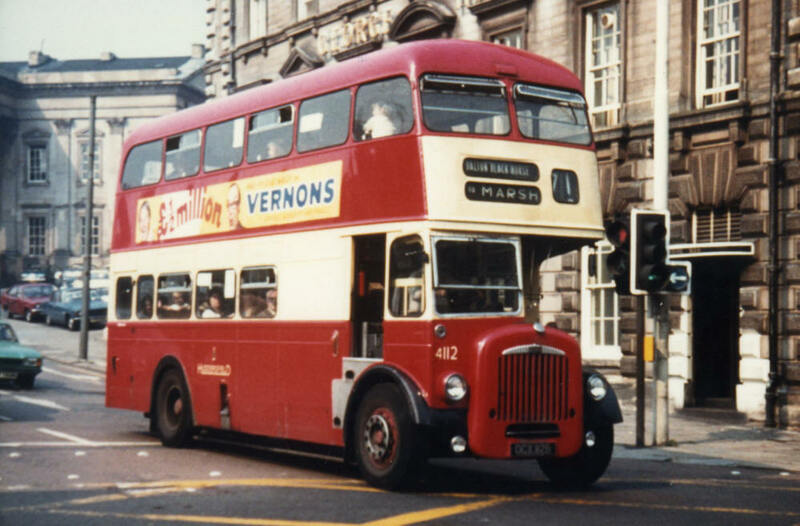 4446 (EVH446C) Daimler CVG6LX30DD30310 with C.H.Roe GO6055 H39/31F body built 6/1965, Ex Huddersfield Corporation 446 on 1 4 1974. 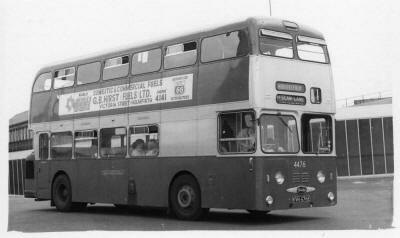 4447 (EVH447C) Daimler CVG6LX30DD30311 with C.H.Roe GO6056 H39/31F body built 6/1965, Ex Huddersfield Corporation 447 on 1 4 1974. 61 Balmoral Avenue - Huddersfield - Birkby. 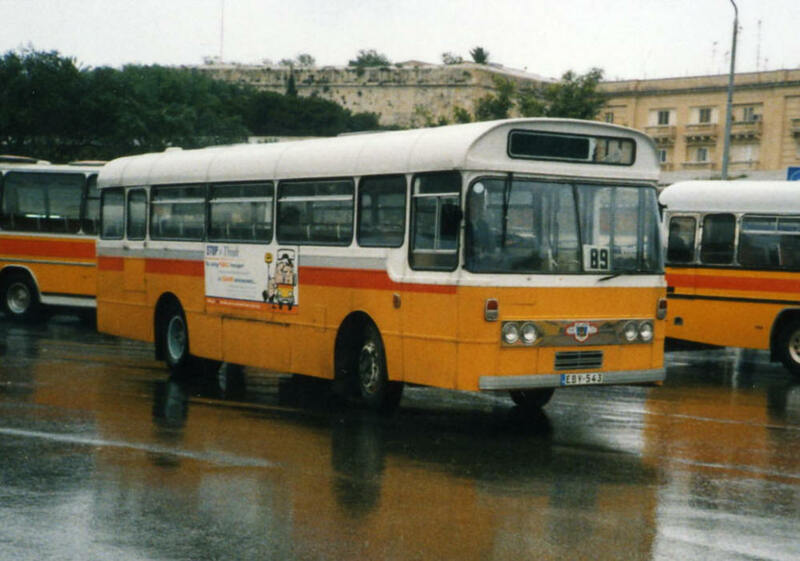 Seen in St. Georges Square. 4448 (EVH448C) Daimler CVG6LX30DD30312 with C.H.Roe GO6057 H39/31F body built 6/1965, Ex Huddersfield Corporation 448 on 1 4 1974. Sold to Reyelles. 4449 (EVH449C) Daimler CVG6LX30DD30313 with C.H.Roe GO6058 H39/31F body built 6/1965, Ex Huddersfield Corporation 449 on 1 4 1974. 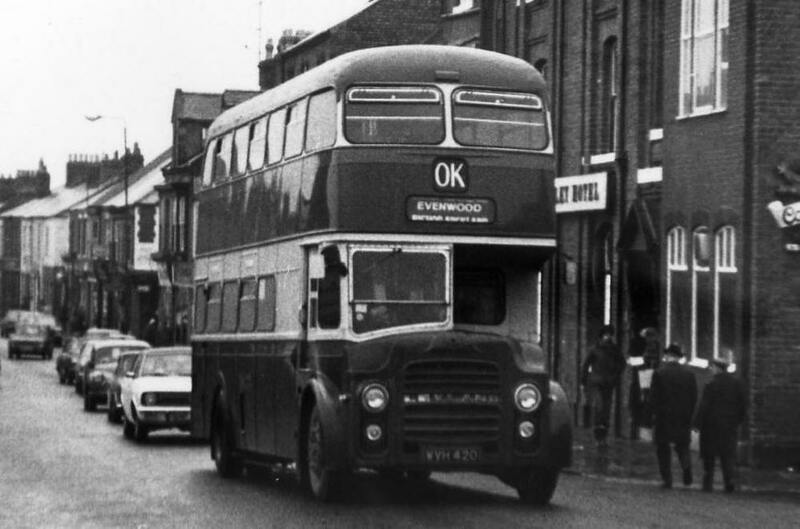 4450 (EVH450C) Daimler CVG6LX30DD30314 with C.H.Roe GO6059 H39/31F body built 6/1965, Ex Huddersfield Corporation 450 on 1 4 1974. 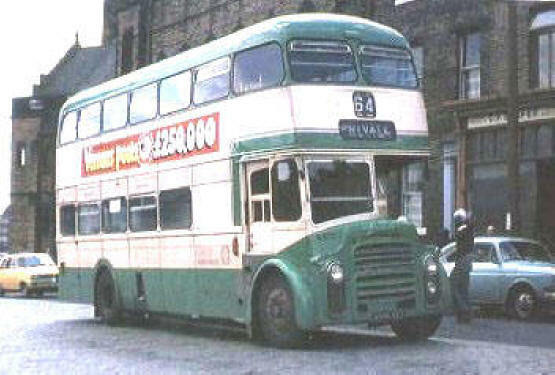 4451 (EVH451C) Daimler CVG6LX30DD30315 with C.H.Roe GO6060 H39/31F body built 6/1965, Ex Huddersfield Corporation 451 on 1 4 1974. 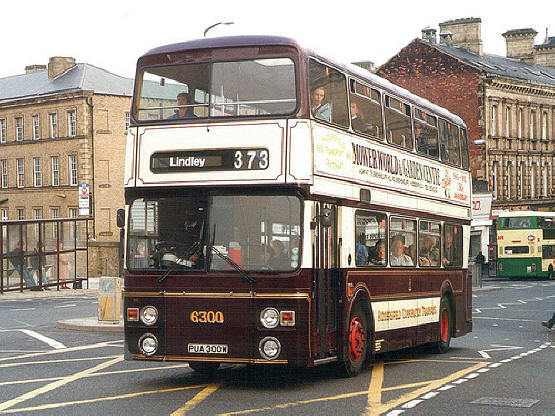 71 Dalton - Huddersfield - Lindley. Seen in Westgate. 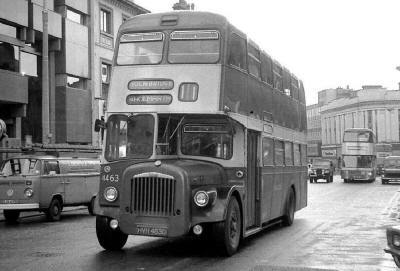 4452 (EVH452C) Daimler CVG6LX30DD30316 with C.H.Roe GO6061 H39/31F body built 6/1965, Ex Huddersfield Corporation 452 on 1 4 1974. 4453 (EVH453C) Daimler CVG6LX30DD30317 with C.H.Roe GO6046 H40/30F body built 6/1965, Ex Huddersfield Corporation 453 on 1 4 1974. 4454 (EVH454C) Daimler CVG6LX30DD30318 with C.H.Roe GO6047 H39/31F body built 6/1965, Ex Huddersfield Corporation 454 on 1 4 1974. 4455 (EVH455C) Daimler CVG6LX30DD30319 with C.H.Roe GO6048 H39/31F body built 6/1965, Ex Huddersfield Corporation 455 on 1 4 1974. 4456 (EVH456C) Daimler CVG6LX30DD30320 with C.H.Roe GO6049 H39/31F body built 6/1965, Ex Huddersfield Corporation 456 on 1 4 1974. 4457 (HVH457D) Daimler CVG6LX30DD30396 with Neepsend Coachworks H41/29F body built 1966, Ex Huddersfield Corporation 457 on 1 4 1974. 4458 (HVH458D) Daimler CVG6LX30DD30397 with East Lancashire 6385 H41/29F body built 1966, Ex Huddersfield Corporation 458 on 1 4 1974. 50 Huddersfield - Marsden Hard End. Seen in High Street. Seen in Leeds Bus Station. 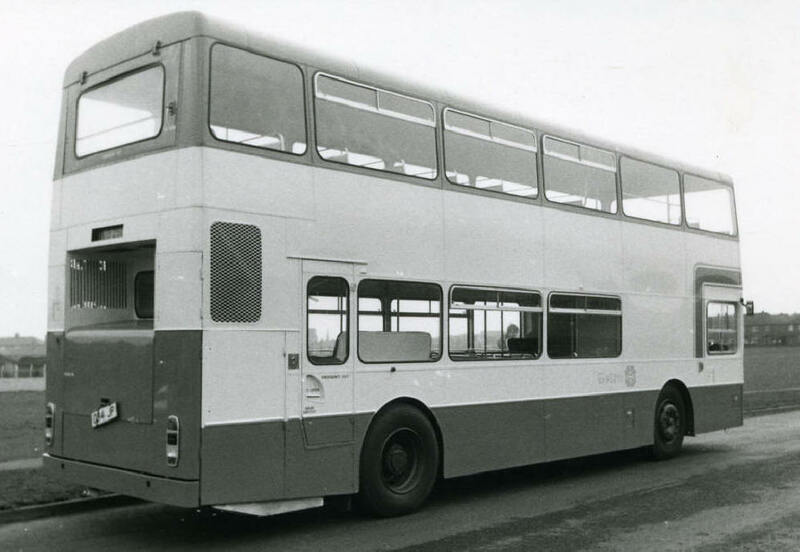 4460 (HVH460D) Daimler CVG6LX30DD30399 with Neepsend Coachworks H41/29F body built 1966, Ex Huddersfield Corporation 460 on 1 4 1974. cab rebuilt for one man operation, not used. 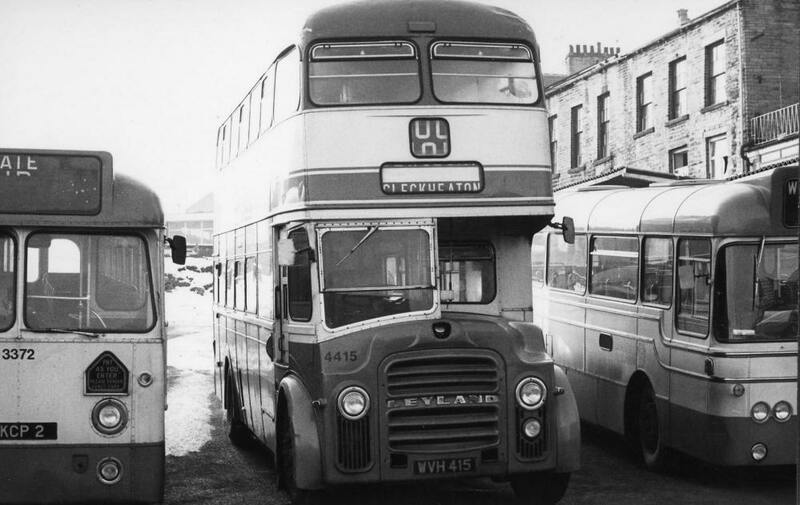 4461 (HVH461D) Daimler CVG6LX30DD30400 with Neepsend Coachworks H41/29F body built 1966, Ex Huddersfield Corporation 461 on 1 4 1974. 41 Quarmby - Huddersfield - Bradley. 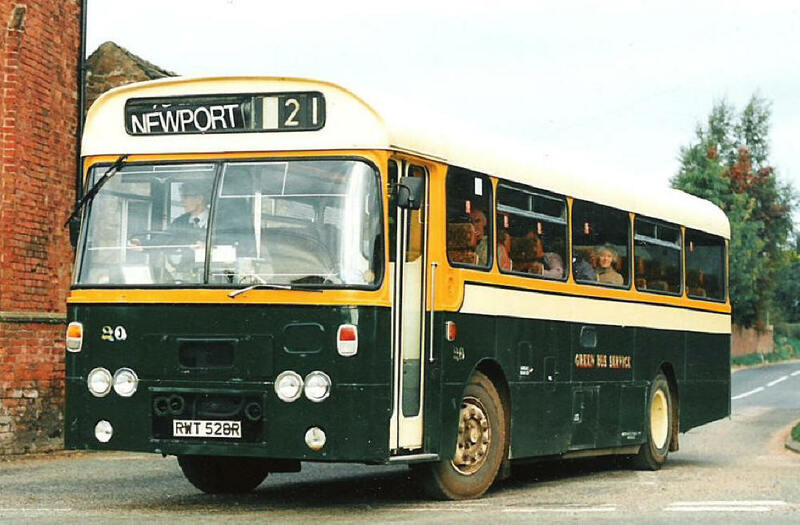 Seen at Sandtoft Trollybus Museum. 4462 (HVH462D) Daimler CVG6LX30DD30401 with Neepsend Coachworks H41/29F body built 1966, Ex Huddersfield Corporation 462 on 1 4 1974. 4463 (HVH463D) Daimler CVG6LX30DD30402 with East Lancashire 6378 H41/29F body built 1966, Ex Huddersfield Corporation 463 on 1 4 1974. 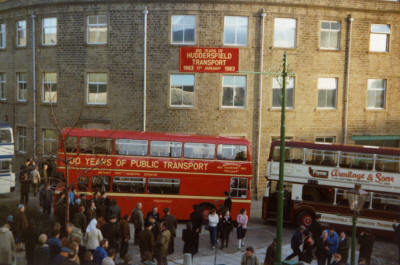 11 Brackenhall - Huddersfield - Holmfirth - Holmbrigde. Seen on New Street. 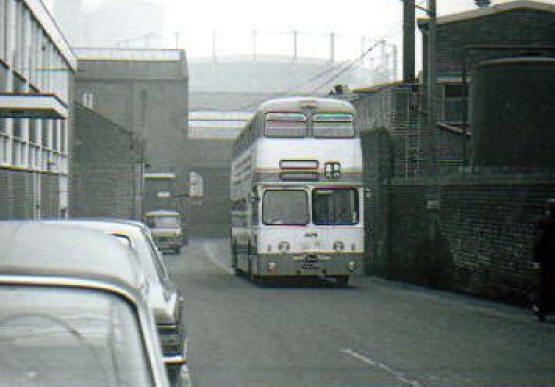 73 Waterloo - Huddersfield - Outlane. Seen in Westgate. 4464 (HVH464D) Daimler CVG6LX30DD30403 with East Lancashire 6379 H41/29F body built 1966, Ex Huddersfield Corporation 464 on 1 4 1974. 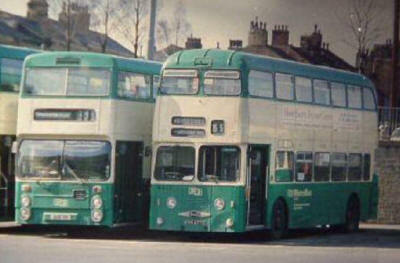 71 Lindley - Huddersfield - Dalton. Seen in Westgate. 4465 (HVH465D) Daimler CVG6LX30DD6383 with East Lancashire 6383 H41/29F body built 1966, Ex Huddersfield Corporation 465 on 1 4 1974. 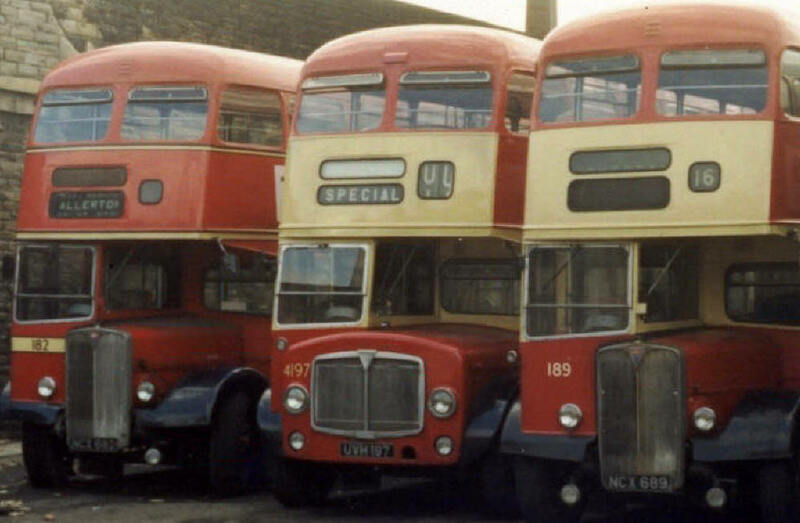 40 Bradley - Huddersfield - Longwood. Seen on New Street. 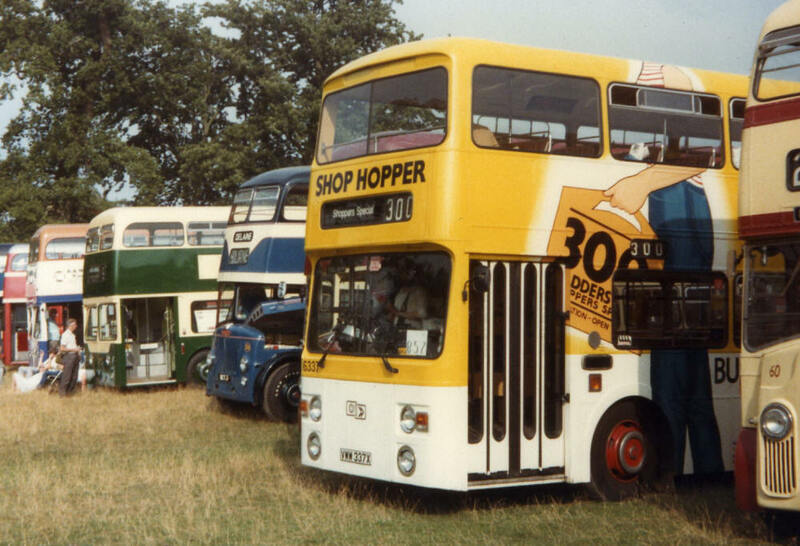 40 Longwood - Huddersfield - Bradley. Seen at Longwood. 4466 (HVH466D) Daimler CVG6LX30DD30405 with Neepsend Coachworks H41/29F body built 1966, Ex Huddersfield Corporation 466 on 1 4 1974. 4467 (HVH467D) Daimler CVG6LX30DD30406 with East Lancashire 6380 H41/29F body built 1966, Ex Huddersfield Corporation 467 on 1 4 1974. 4468 (HVH468D) Daimler CVG6LX30DD30407 with Neepsend Coachworks H41/29F body built 1966, Ex Huddersfield Corporation 468 on 1 4 1974. 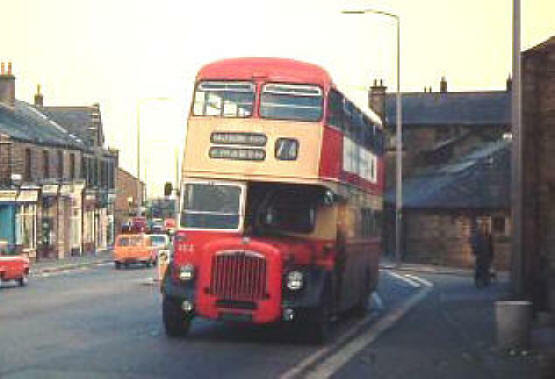 Last half cab bus in service at Huddersfield. 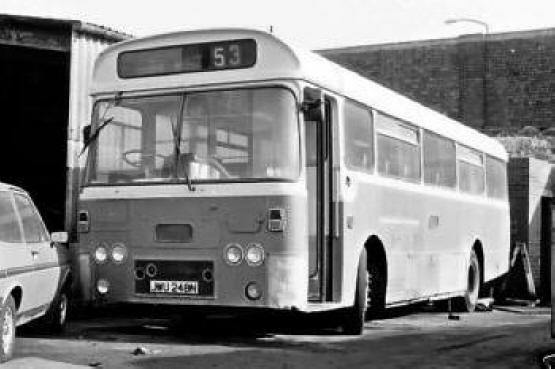 4469 (HVH469D) Daimler CVG6LX30DD30408 with Neepsend Coachworks H41/29F body built 1966, Ex Huddersfield Corporation 469 on 1 4 1974. 4470 (HVH470D) Daimler CVG6LX30DD30409 with East Lancashire 6384 H41/29F body built 1966, Ex Huddersfield Corporation 470 on 1 4 1974. 4471 (HVH471D) Daimler CVG6LX30DD30410 with East Lancashire 6382 H41/29F body built 1966, Ex Huddersfield Corporation 471 on 1 4 1974. 4472 (HVH472D) Daimler CVG6LX30DD30411 with East Lancashire 6381 H41/29F body built 1966, Ex Huddersfield Corporation 472 on 1 4 1974. Preserved by Huddersfield Passenger Transport Group, Sold for further Preservation. 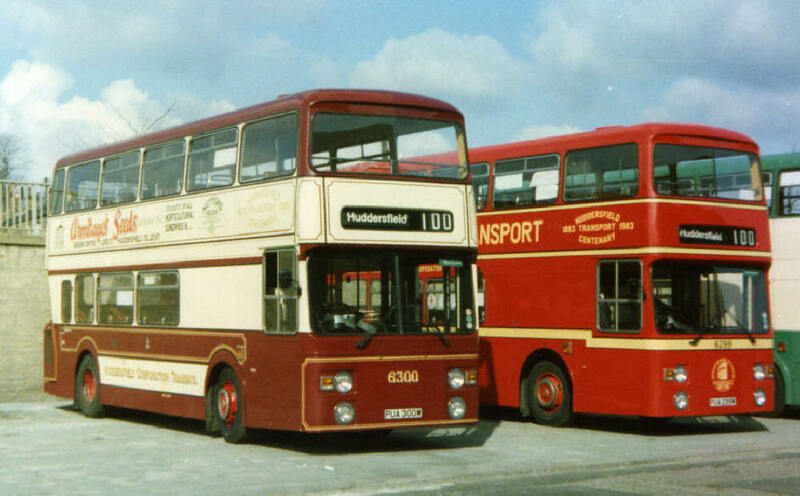 10 Brackenhall - Huddersfield - Holmfirth - Holme. Seen Holmbridge. 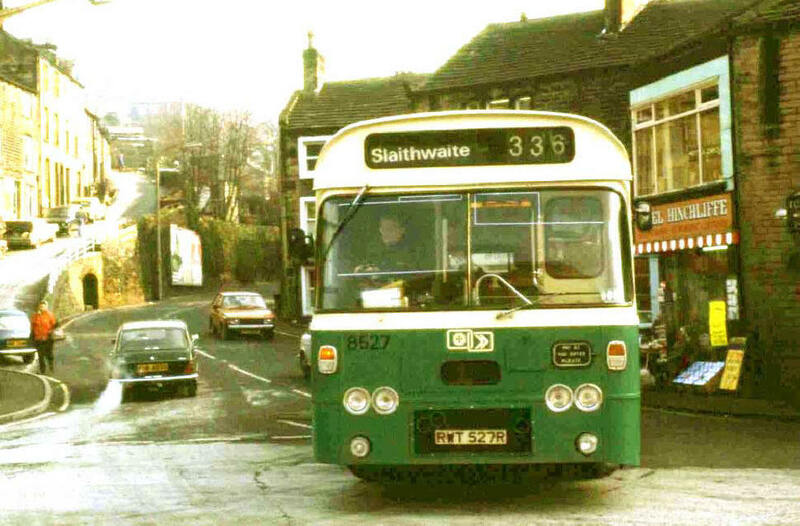 53 Huddersfield - Slaithwaite. Seen at Slaithwaite Reverser. Seen at Yorkshire Traction Depot, Barnsley. Seen at Stanhope Arms, Dunford Bridge. 61 Brackenhall - Huddersfield - Balmoral Avenue. Seen on John William Street. 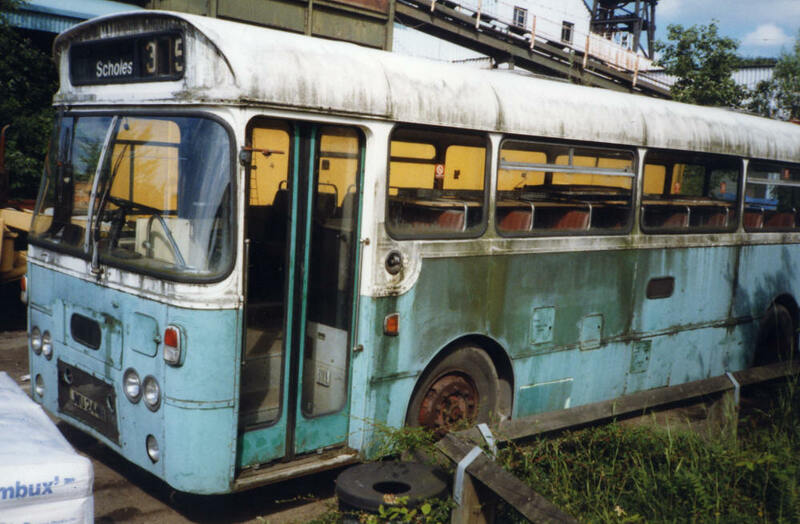 Seen at Sandtoft Trollybus Museum. 4473 (KVH473E) Daimler CRG6LX62222 with C.H.Roe GO6396 H43/32F body built 7/1967, Ex Huddersfield Corporation 473 on 1 4 1974. 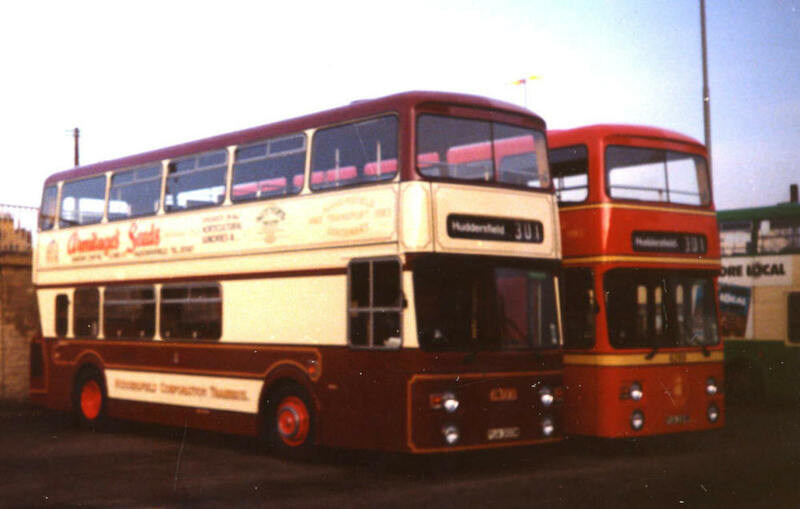 4474 (KVH474E) Daimler CRG6LX62223 with C.H.Roe GO6397 H43/32F body built 7/1967, Ex Huddersfield Corporation 474 on 1 4 1974. 4475 (KVH475E) Daimler CRG6LX62224 with C.H.Roe GO6398 H43/32F body built 7/1967, Ex Huddersfield Corporation 475 on 1 4 1974. 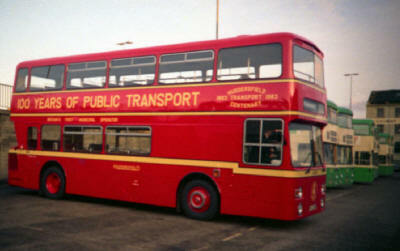 4476 (KVH476E) Daimler CRG6LX62225 with C.H.Roe GO6399 H43/32F body built 7/1967, Ex Huddersfield Corporation 476 on 1 4 1974. 1 Huddersfield - Milnsbridge - Golcar. 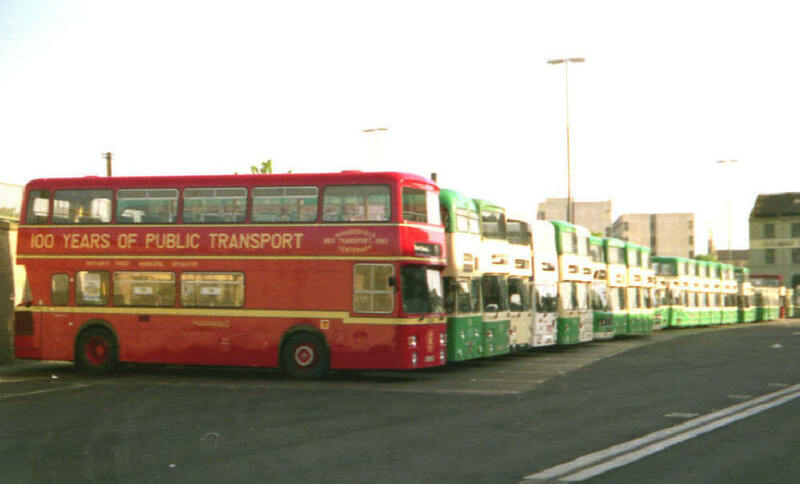 Seen at Huddersfield Bus Station. 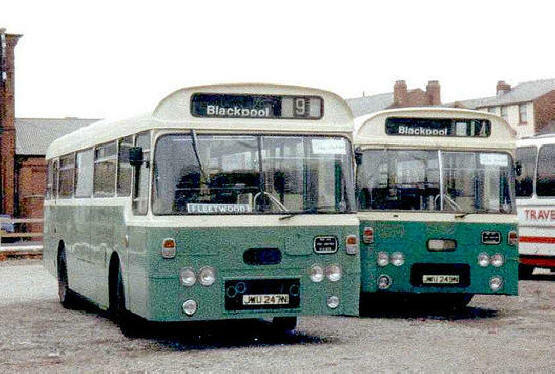 Seen at Blundell Street, Blackpool. 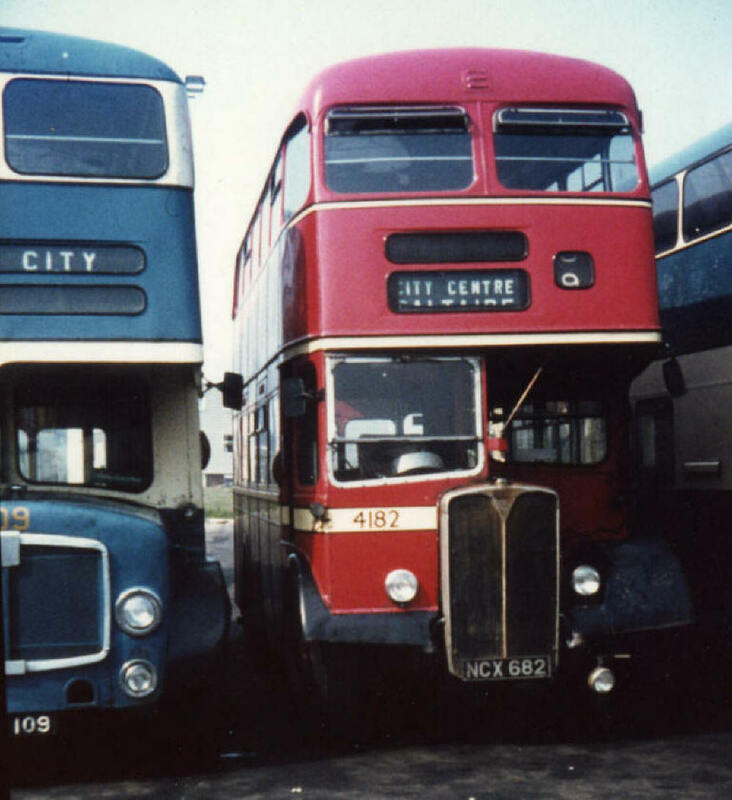 4477 (KVH477E) Daimler CRG6LX62226 with C.H.Roe GO6400/Willowbrook H43/32F body built 7/1967, Ex Huddersfield Corporation 477 on 1 4 1974. 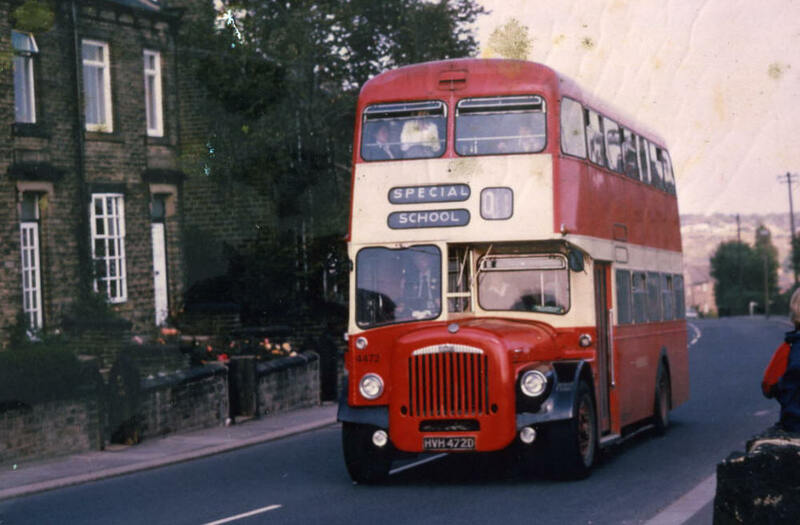 98 Crosland Moor - St. Josephs School. Seen at Huddersfield Depot. 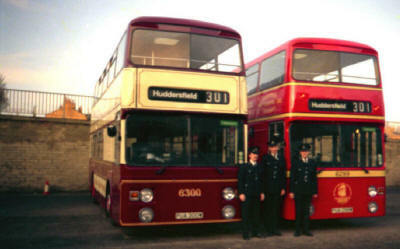 3 Huddersfield - Scapegoathill. 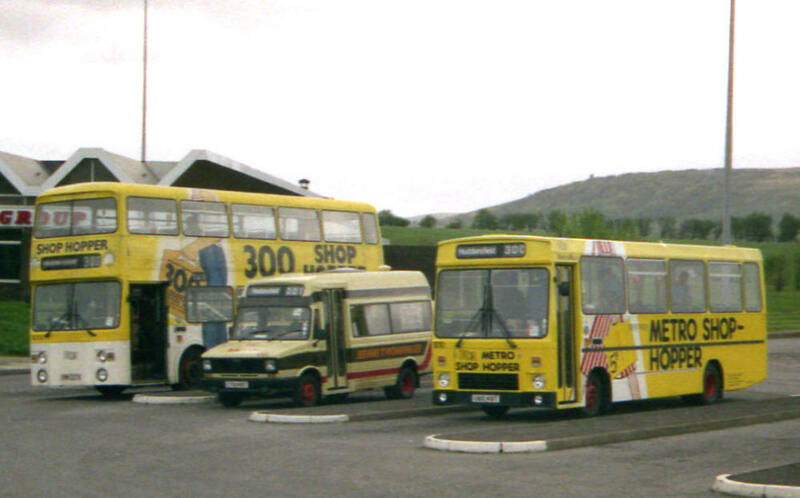 Seen at Bolster Moor. 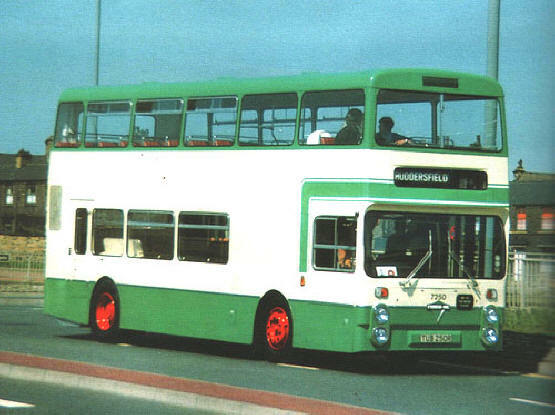 22 Deighton - Huddersfield. Seen on John William Street. 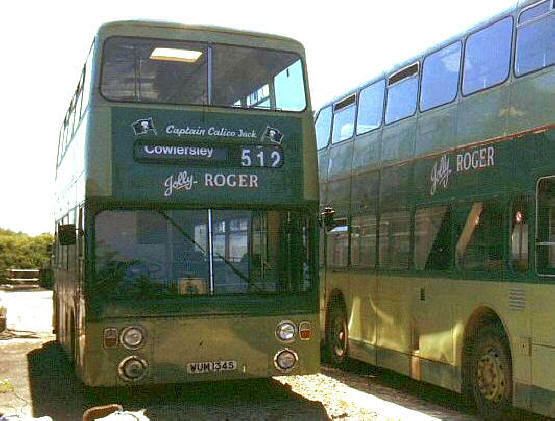 4478 (KVH478E) Daimler CRG6LX62227 with C.H.Roe GO6401 H43/32F body built 7/1967, Ex Huddersfield Corporation 478 on 1 4 1974. 382 Brighouse - Rastrick - Huddersfield - Newsome South. Seen on John William Street. 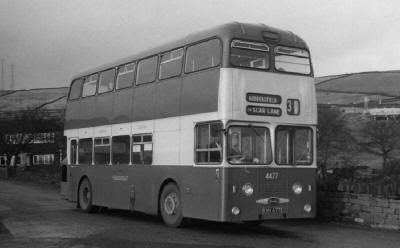 4479 (KVH479E) Daimler CRG6LX62228 with C.H.Roe GO6402 H43/32F body built 7/1967, Ex Huddersfield Corporation 479 on 1 4 1974. 4480 (KVH480E) Daimler CRG6LX62229 with C.H.Roe GO6403 H43/32F body built 7/1967, Ex Huddersfield Corporation 480 on 1 4 1974. 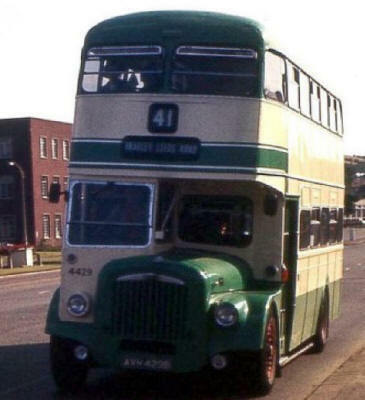 4481 (KVH481E) Daimler CRG6LX62230 with C.H.Roe GO6404H43/32F body built 7/1967, Ex Huddersfield Corporation 481 on 1 4 1974. 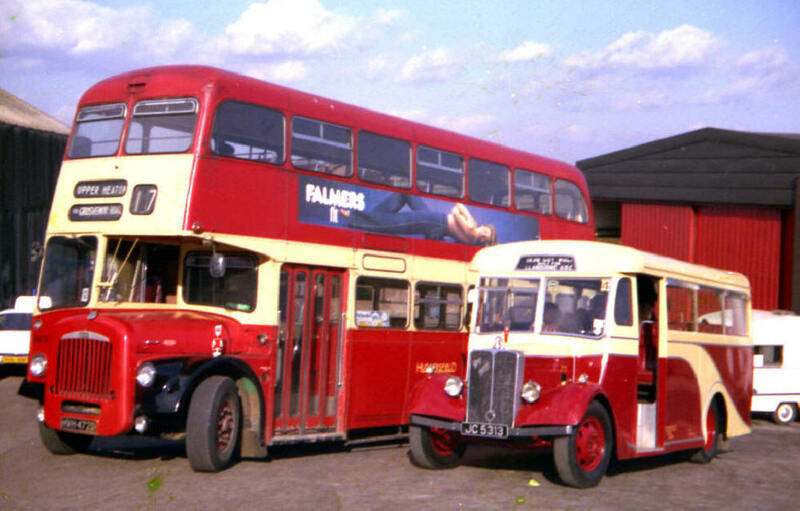 4482 (KVH482E) Daimler CRG6LX62231 with C.H.Roe GO6405 H43/32F body built 7/1967, Ex Huddersfield Corporation 482 on 1 4 1974. 4483 (KVH483E) Daimler CRG6LX62232 with C.H.Roe GO6406H43/32F body built 7/1967, Ex Huddersfield Corporation 483 on 1 4 1974. 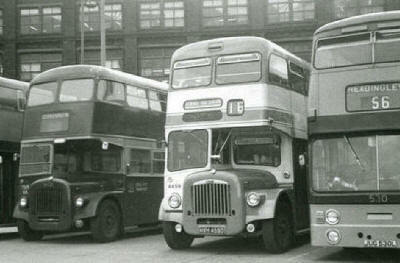 4484 (KVH484E) Daimler CRG6LX62233 with C.H.Roe GO6407 H43/32F body built 7/1967, Ex Huddersfield Corporation 484 on 1 4 1974. 4485 (KVH485E) Daimler CRG6LX62234 with C.H.Roe GO6408 H43/32F body built 7/1967, Ex Huddersfield Corporation 485 on 1 4 1974. 4486 (KVH486E) Daimler CRG6LX62235 with C.H.Roe GO6409 H43/32F body built 7/1967, Ex Huddersfield Corporation 486 on 1 4 1974. 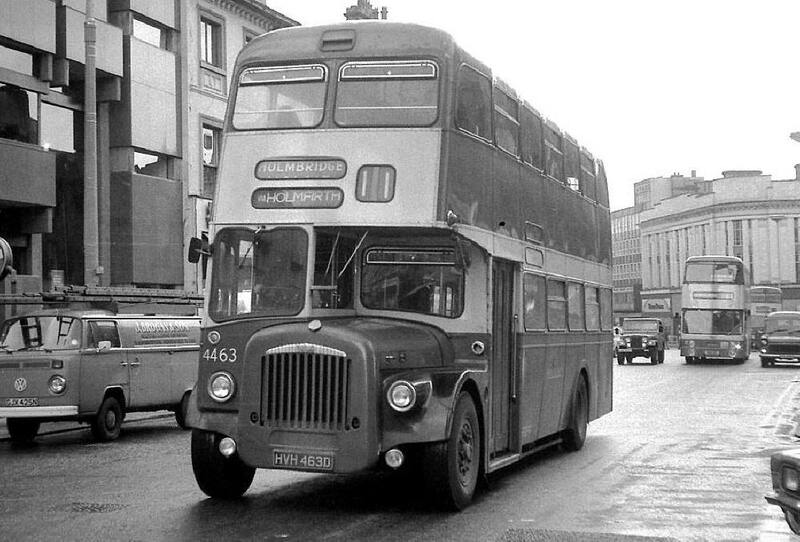 4487 (KVH487E) Daimler CRG6LX62236 with C.H.Roe GO6410 H43/32F body built 7/1967, Ex Huddersfield Corporation 487 on 1 4 1974. 4488 (KVH488E) Daimler CRG6LX62237 with C.H.Roe GO6411 H43/32F body built 7/1967, Ex Huddersfield Corporation 488 on 1 4 1974. 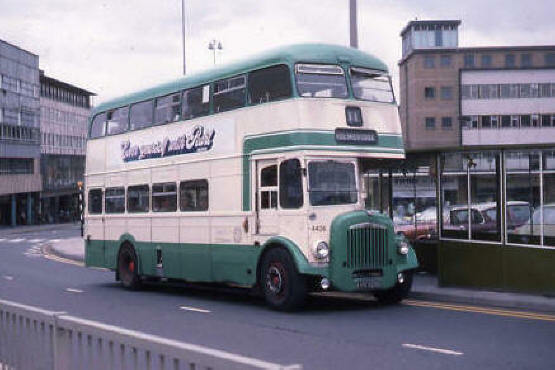 4489 (OCX489F) Daimler CRG6LX62746 with C.H.Roe GO6584 H43/32F body built 6/1968, Ex Huddersfield Corporation 489 on 1 4 1974. 4490 (OCX490F) Daimler CRG6LX62747 with C.H.Roe GO6585 H43/32F body built 6/1968, Ex Huddersfield Corporation 490 on 1 4 1974. 4491 (OCX491F) Daimler CRG6LX62748 with C.H.Roe GO6586 H43/32F body built 6/1968, Ex Huddersfield Corporation 491 on 1 4 1974. 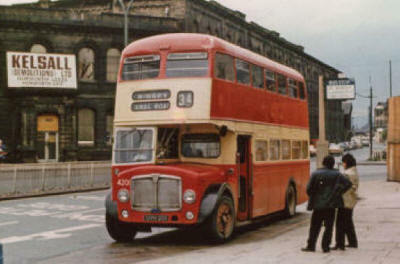 4492 (OCX492F) Daimler CRG6LX62749 with C.H.Roe GO6587 H43/32F body built 6/1968, Ex Huddersfield Corporation 492 on 1 4 1974. 4493 (OCX493F) Daimler CRG6LX62750 with C.H.Roe GO6588 H43/32F body built 6/1968, Ex Huddersfield Corporation 493 on 1 4 1974. 4494 (OCX494F) Daimler CRG6LX62751 with C.H.Roe GO6589 H43/32F body built 6/1968, Ex Huddersfield Corporation 494 on 1 4 1974. 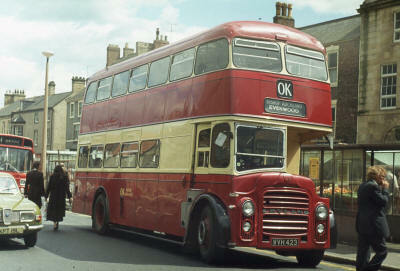 4495 (OCX495F) Daimler CRG6LX62752 with C.H.Roe GO6590 H43/32F body built 6/1968, Ex Huddersfield Corporation 495 on 1 4 1974. 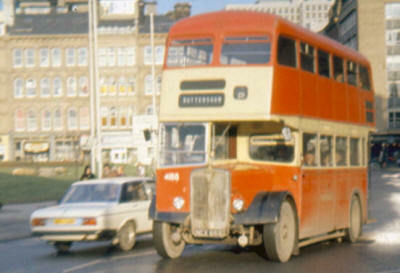 4496 (OCX496F) Daimler CRG6LX62753 with C.H.Roe GO6591 H43/32F body built 6/1968, Ex Huddersfield Corporation 496 on 1 4 1974. 4497 (OCX497F) Daimler CRG6LX62754 with C.H.Roe GO6592 H43/32F body built 6/1968, Ex Huddersfield Corporation 497 on 1 4 1974. 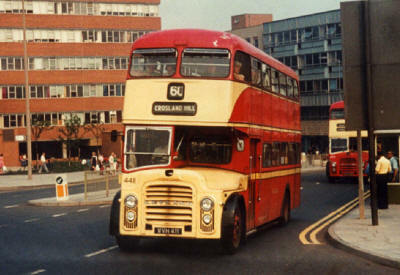 4498 (OCX498F) Daimler CRG6LX62755 with C.H.Roe GO6593 H43/32F body built 6/1968, Ex Huddersfield Corporation 498 on 1 4 1974. 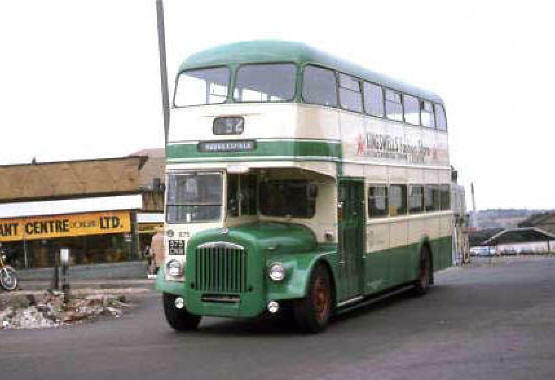 4499 (OCX499F) Daimler CRG6LX62756 with C.H.Roe GO6594 H43/32F body built 6/1968, Ex Huddersfield Corporation 499 on 1 4 1974. 4500 (OCX500F) Daimler CRG6LX62757 with C.H.Roe GO6595 H43/32F body built 6/1968, Ex Huddersfield Corporation 500 on 1 4 1974. 4501 (OCX501F) Daimler CRG6LX62758 with C.H.Roe GO6596 H43/32F body built 6/1968, Ex Huddersfield Corporation 501 on 1 4 1974. 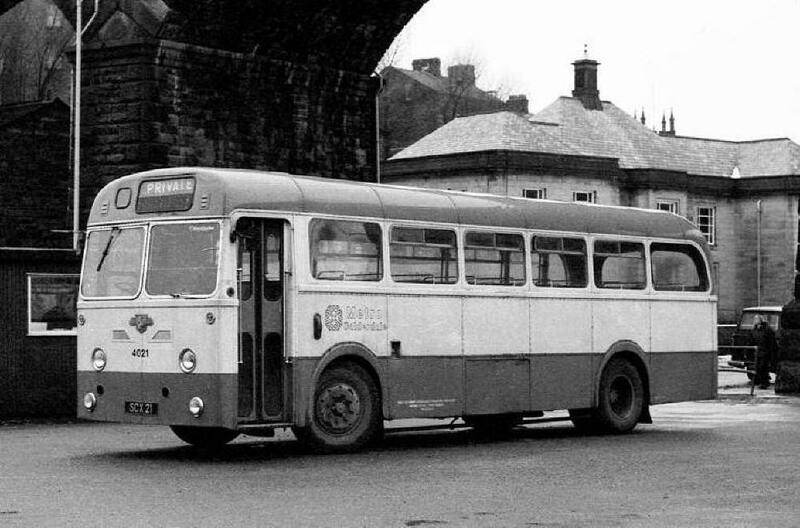 4502 (OCX502F) Daimler CRG6LX62759 with C.H.Roe GO6597 H43/32F body built 6/1968, Ex Huddersfield Corporation 502 on 1 4 1974. 4503 (OCX503F) Daimler CRG6LX62760 with C.H.Roe GO6598 H43/32F body built 6/1968, Ex Huddersfield Corporation 503 on 1 4 1974. 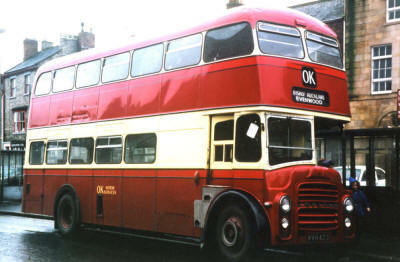 4504 (OCX504F) Daimler CRG6LX62760 with C.H.Roe GO6599 H43/32F body built 6/1968, Ex Huddersfield Corporation 504 on 1 4 1974. 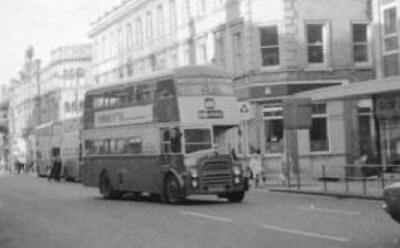 4005 (MJX315J) Seddon RU 46516 with Plaxton 719546 DP45F body built 10/1970 Ex Calderdale Joint Omnibus Services 315 on 1 4 1974. 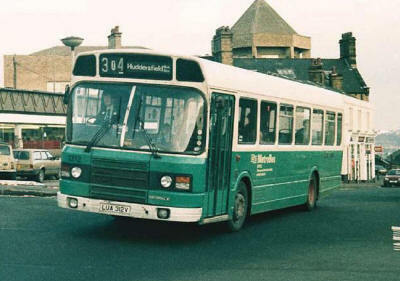 Later renumbered 3315 Originally Halifax Joint Omnibus Services 315 (1970-1971). 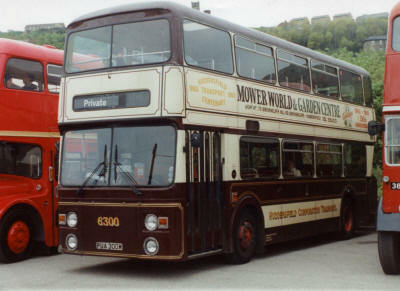 Quite often loaned to Baddeley Bros., Holmfirth. 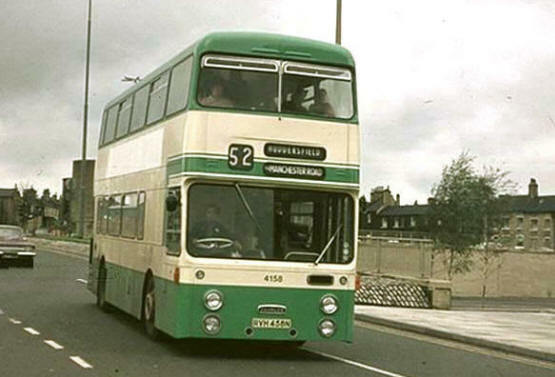 56 Huddersfield - Yews Hill - Hoyle House - Blackmoorfoot. Seen at Blackmoorfoot. 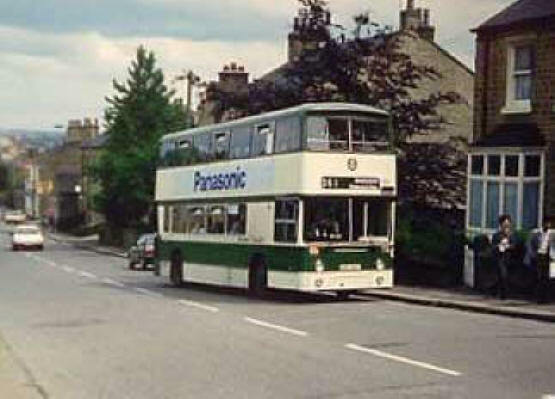 4 Huddersfield - Parkwood - Scapegoat Hill. Seen at Huddersfield Bus Station. 4006 (MJX316J) Seddon RU 46517 with Plaxton 19547 DP45F body built 11/1970 Ex Calderdale Joint Omnibus Services 316 on 1 4 1974 Later renumbered 3316. 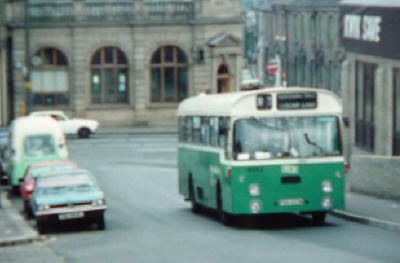 Originally Halifax Joint Omnibus Services 316 (1970-1971). Quite often loaned to Baddeley Bros., Holmfirth. 4007 (MJX317J) Seddon RU 46518 with Plaxton 19548 DP45F body built 11/1970 Ex Calderdale Joint Omnibus Services 317 on 1 4 1974. 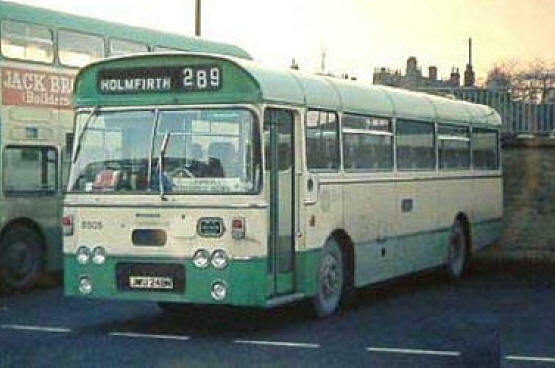 Later renumbered 3317 Originally Halifax Joint Omnibus Services 317 (1970-1971). Quite often loaned to Baddeley Bros., Holmfirth. 162 (UNW162H) Daimler Fleetline CRG6LXB63484 with C.H.Roe GO6747 H45/33D body built 9/1969 Ex Leeds City Transport 162 on 1 4 1974. 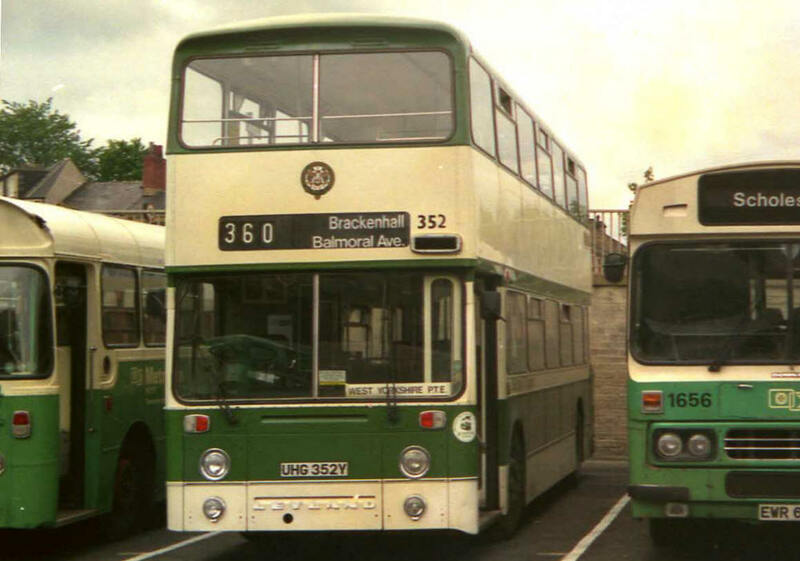 361 Brackenhall - Birkby - Huddersfield - Balmoral Avenue. Seen on John William Street. 163 (UNW163H) Daimler Fleetline CRG6LXB63485 with C.H.Roe GO6748 H45/33D body built 9/1969 Ex Leeds City Transport 163 on 1 4 1974. 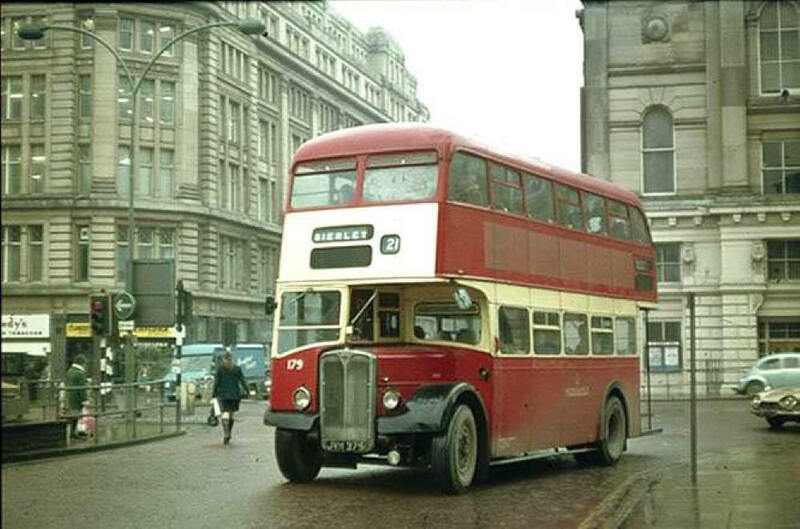 4202 (572CNW) Daimler CVG6LX30DD30141 with C.H.Roe GO5500 H39/31F body built 5/1962 Ex Leeds City Transport 572 on 1 4 1974. 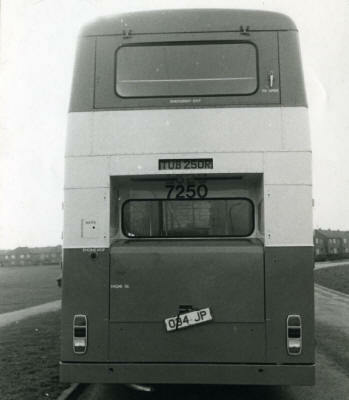 Later renumbered 872 Transferred to Bradford District, Transferred to Calderdale. 4203 (573CNW) Daimler CVG6LX30DD30142 with C.H.Roe GO5499 H39/31F body built 5/1962 Ex Leeds City Transport 573 on 1 4 1974. 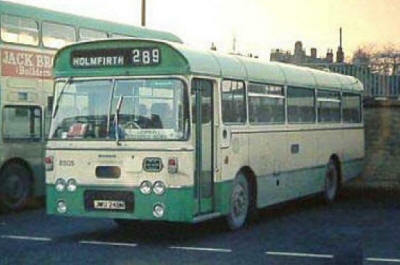 Later renumbered 873 Transferred to Bradford District, Transferred to Calderdale. 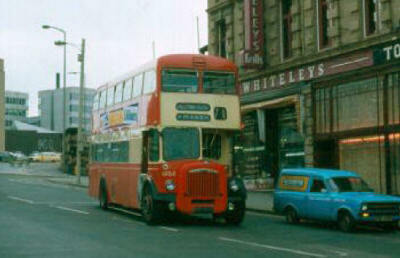 4204 (574CNW) Daimler CVG6LX30DD30143 with C.H.Roe GO5498 H39/31F body built 5/1962 Ex Leeds City Transport 574 on 1 4 1974. 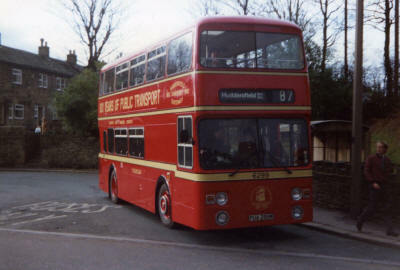 Later renumbered 874 Transferred to Bradford District, Transferred to Calderdale. 77 Bradford - Halifax. Seen in Bradford. Seen at Dean Clough, Halifax. 4205 (575CNW) Daimler CVG6LX30DD30144 with C.H.Roe GO5501 H39/31F body built 5/1962 Ex Leeds City Transport 575 on 1 4 1974. 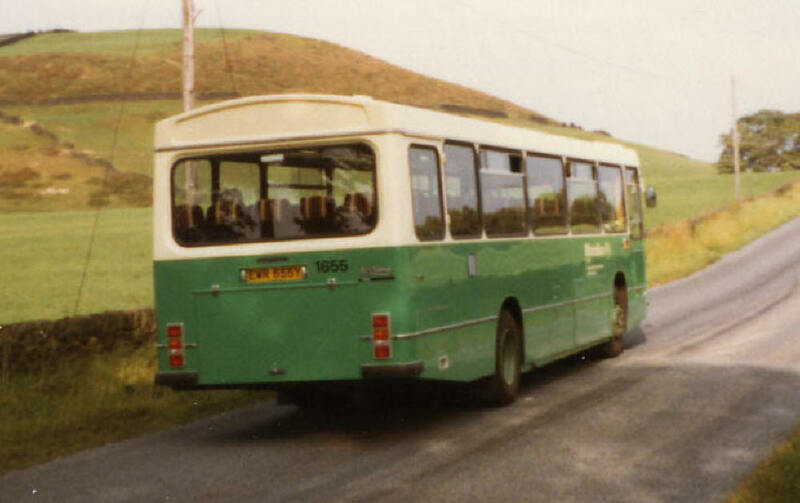 Later renumbered 875 Transferred to Bradford District, Transferred to Calderdale. 52 Huddersfield - Marsden Dirker. Seen at Manchester Street. 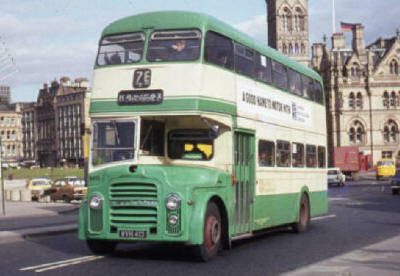 4206 (576CNW) Daimler CVG6LX30DD30145 with C.H.Roe GO5502 H39/31F body built 5/1962 Ex Leeds City Transport 576 on 1 4 1974. 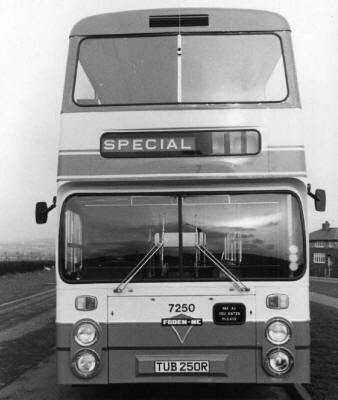 Later renumbered 876 Transferred to Bradford District, Transferred to Calderdale. 2342 (XAK342L) Daimler Fleetline CRL6 65645 with Alexander 4/5370/7 H43/31F body built 8/1972 Ex Bradford City Transport 342 on 1 4 1974. 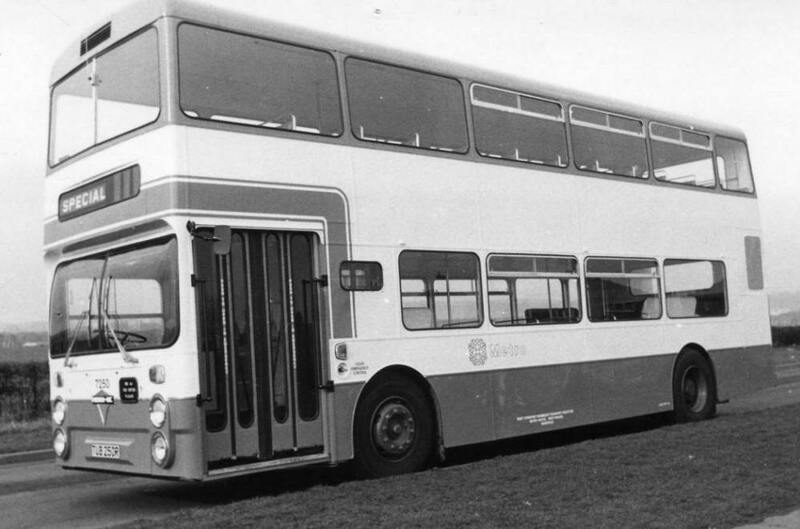 43 (MUA43P) Bristol LH6L LHS-240 with Eastern Coachworks 21583 DP27F body built 6/1976 on loan to Baddeley Bros., Holmfirth. 44 (MUA44P) Bristol LH6L LHS-241 with Eastern Coachworks 25184 DP27F body built 6/1976 on loan to Baddeley Bros., Holmfirth. 304 Huddersfield - Parkwood - Scapegoat Hill. 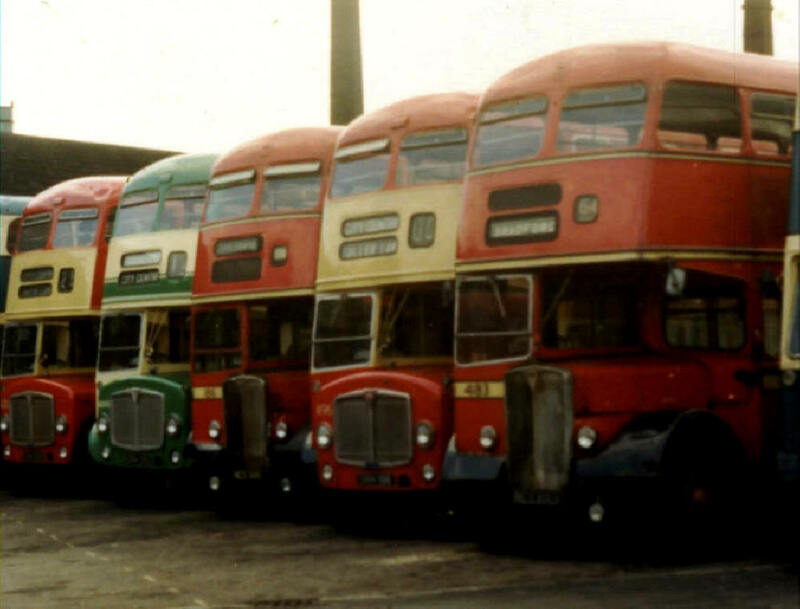 Seen at Huddersfield Bus Station. Seen in Great Northern St. Works. 306 Huddersfield - Milnsbridge - Slaithwaite. Seen at Huddersfield Bus Station. 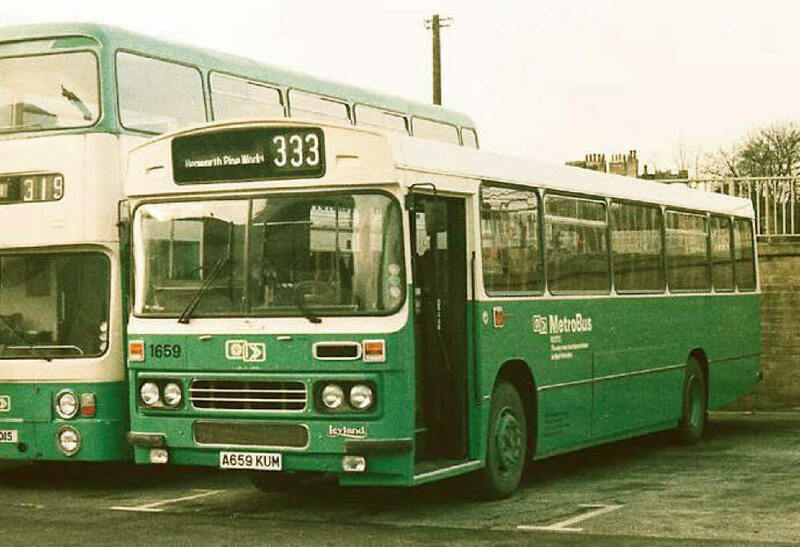 1655 (EWR655Y) Leyland Tiger TRBTL11/2R 8201735 with Duple 339/5632 DP47F body built 1983, Passed to Yorkshire Rider,Transferred to Leeds, Badgerline & First Bus (Brewers). 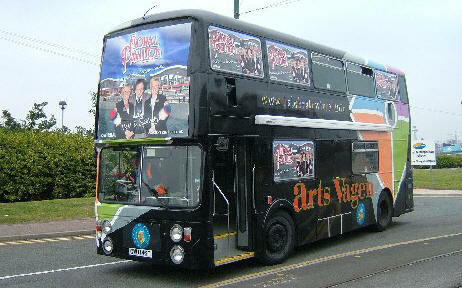 Seen on the Middle Walk, Blackpool. 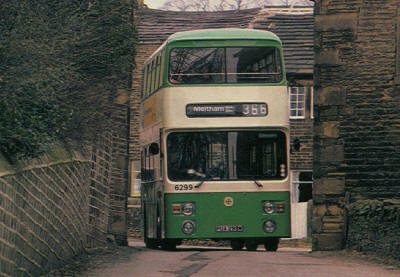 335 Huddersfield -Scholes - Holmfirth - Meltham - Marsden Hard End route at Hard End. 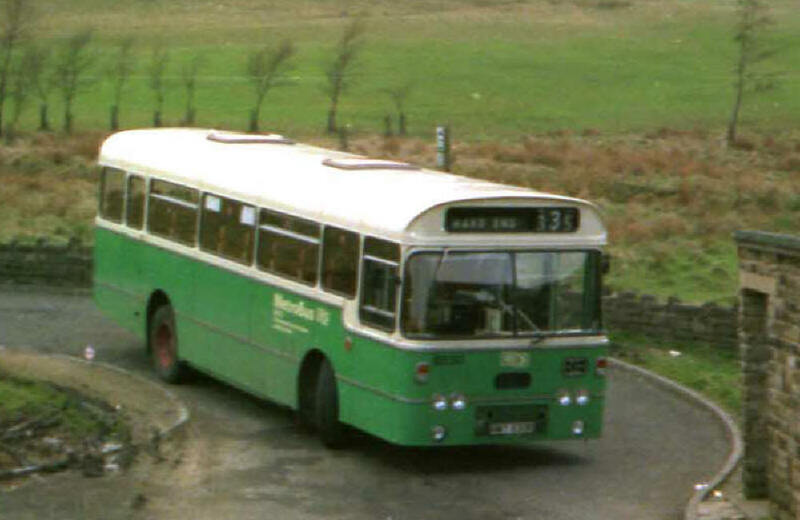 335 Huddersfield -Scholes - Holmfirth - Meltham - Marsden Hard End route at the Bell House, Wilshaw. 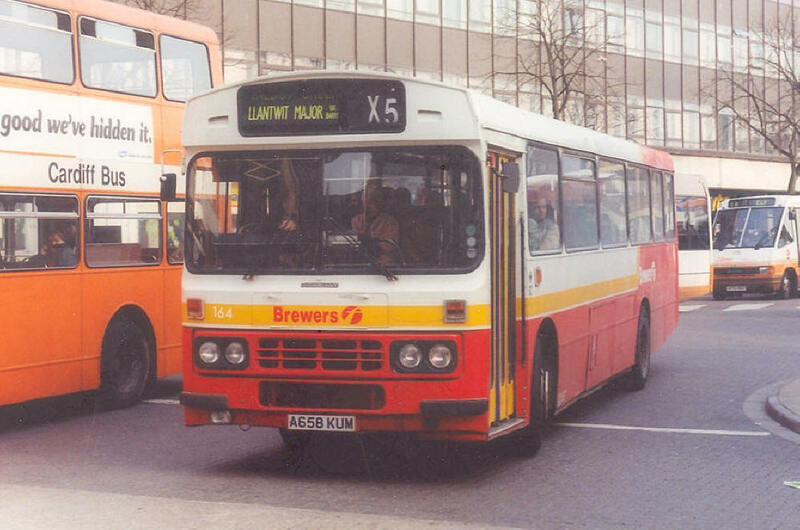 1656 (EWR656Y) Leyland Tiger TRBTL11/2R 8201736 with Duple 339/5633 DP47F body built 1983, Passed to Yorkshire Rider, Transferred to Leeds, Badgerline & First Bus (Brewers). Then Rhondda (Parfitts). 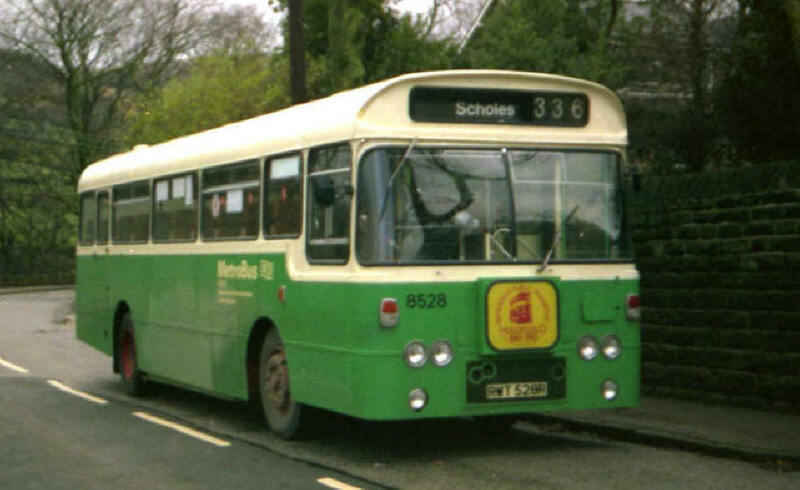 Seen in South Wales with Rhondda. 1657 (EWR657Y) Leyland Tiger TRBTL11/2R 8201737 with Duple DP47F 339/5631 body built 1983, Passed to Yorkshire Rider, Transferred to Leeds, Badgerline & First Bus (Brewers). 1658 (A658KUM) Leyland Tiger TRBTL11/2R 8300915 with Duple 439/5801 DP47F body built 12/1983, Passed to Yorkshire Rider, Transferred to Leeds, Badgerline & First Bus (Brewers). Seen with Brewers, South Wales. 1659 (A659KUM) Leyland Tiger TRBTL11/2R 8300916 with Duple 439/5803 DP47F body built 12/1983, Passed to Yorkshire Rider, Transferred to Leeds, Badgerline & First Bus (Brewers). 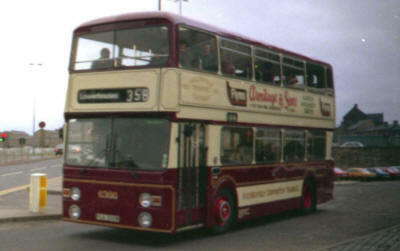 333 Huddersfield - Hepworth Iron Co. Crow Edge - Stocksbridge - Deepcar. Seen in Huddersfield Bus Station. 1660 (A660KUM) Leyland Tiger TRBTL11/2R 8300929 with 439/5804 Duple DP47F body built 12/1983, Passed to Yorkshire Rider, Transferred to Leeds, Badgerline & First Bus (Brewers). 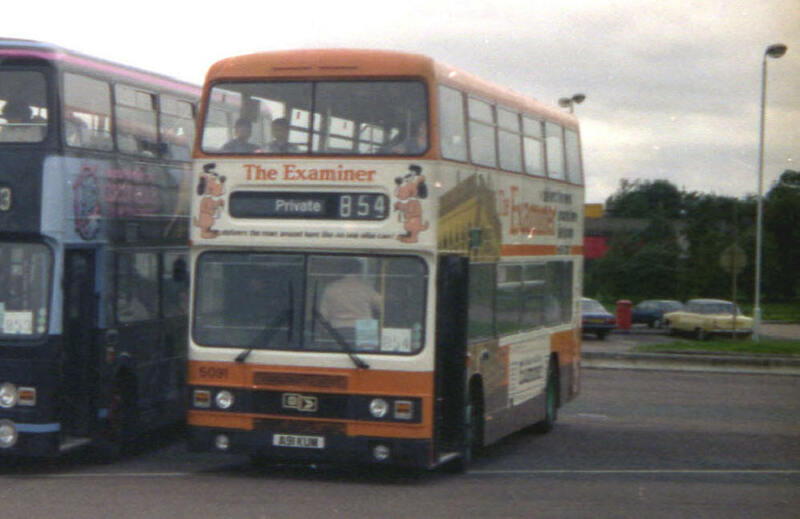 1661 (A661KUM) Leyland Tiger TRBTL11/2R 8300938 with Duple 439/5802 DP47F body built 12/1983, Passed to Yorkshire Rider, Transferred to Leeds, Badgerline & First Bus (Brewers). 1662 (A662KUM) Leyland Tiger TRBTL11/2R 8300957 with Duple 439/5805 DP47F body built 12/1983, Passed to Yorkshire Rider, Transferred to Leeds, Badgerline & First Bus (Brewers). Floating light - Uppermill School. 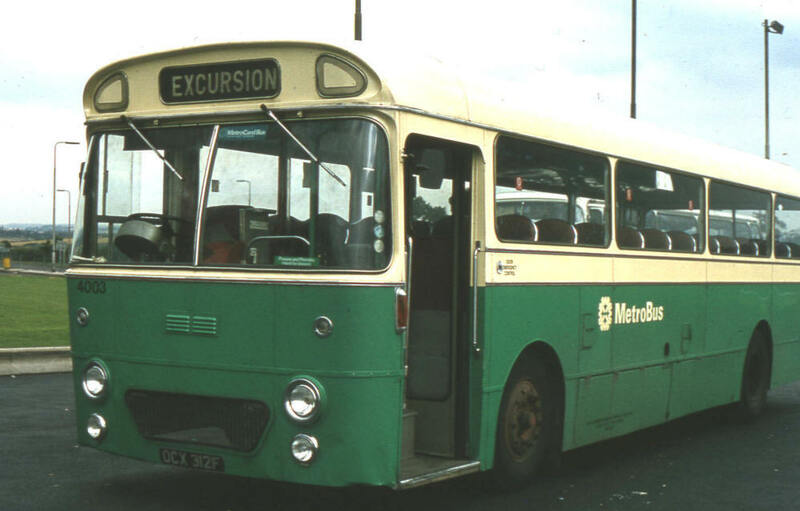 Seen on M61 Services. 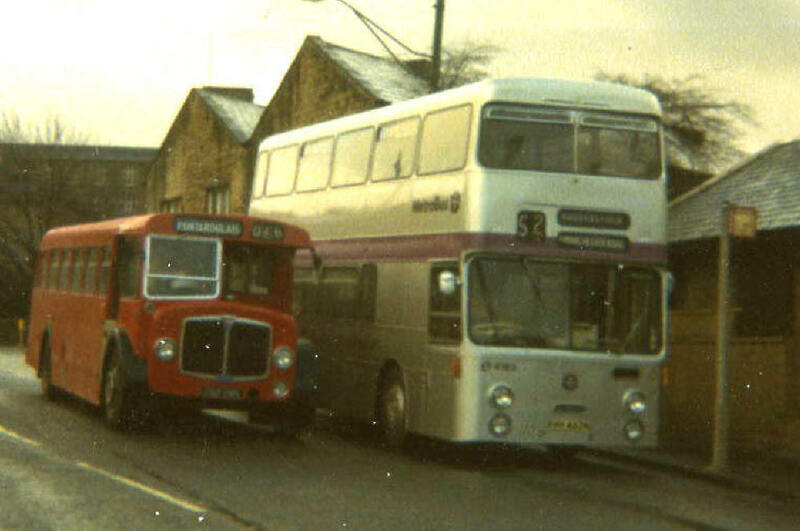 4052 (PVH452M) Seddon Pennine RU 56041 with Plaxton 7410SB001 B44F body built 9/1974, passed to Yorkshire Rider. 396 Huddersfield - Birkby - Weatherhill - Milnsbridge - Newsome - Almondbury. Seen in Huddersfield Bus Station. 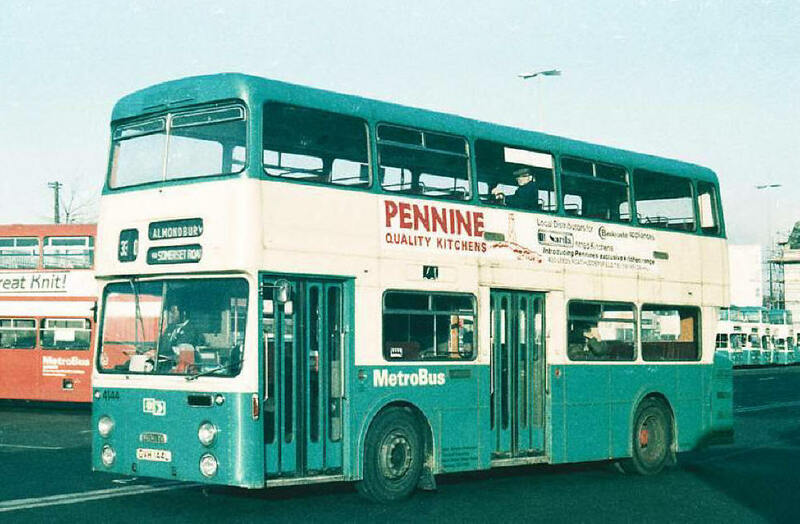 4053 (PVH453M) Seddon Pennine RU 56042 with Plaxton 7410SB002 B44F body built 10/1974, passed to Yorkshire Rider. 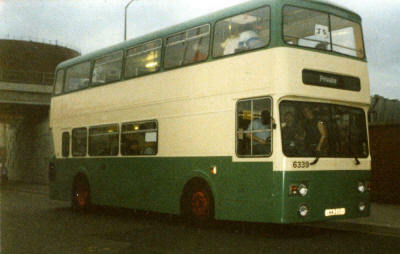 392 Huddersfield - Birkby - Weatherhill - Milnsbridge - Newsome. Seen in Huddersfield Bus Station. 303 Huddersfield - Milnsbridge - Golcar - Scapegoathill. Seen in Scar Lane Milnsbridge. 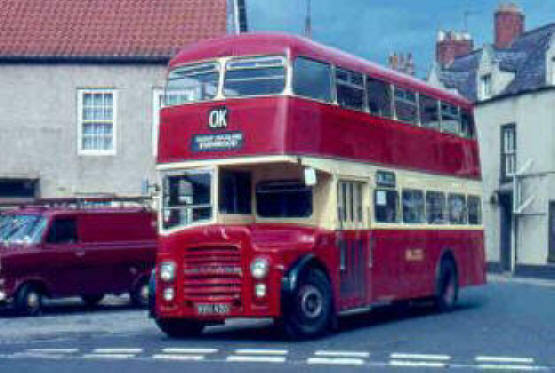 4151 (RVH451N) Daimler Fleetline CRG6LX67670 with C.H.Roe GO7590 H44/31F body built 1974, passed to Yorkshire Rider. 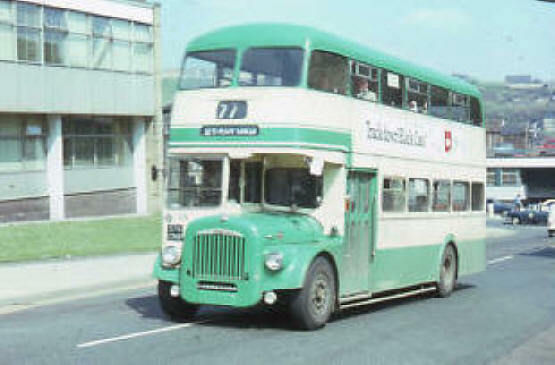 4152 (RVH452N) Daimler Fleetline CRG6LX67671 with C.H.Roe GO7592 H44/31F body built 1974, passed to Yorkshire Rider. 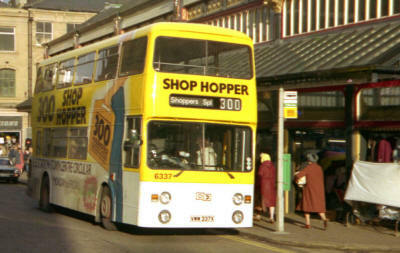 300 Huddersfield Shopper Hopper. Seen on New Street. 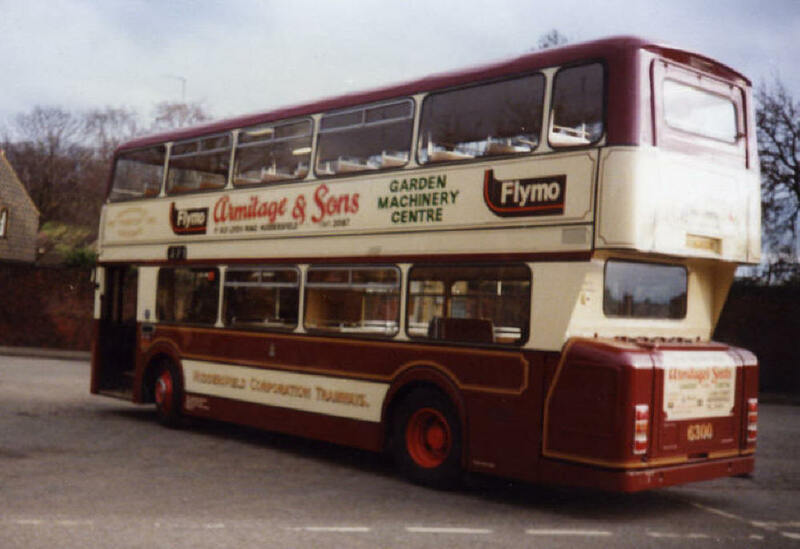 4153 (RVH453N) Daimler Fleetline CRG6LX67672 with C.H.Roe GO7381 H44/31F body built 1974, passed to Yorkshire Rider. 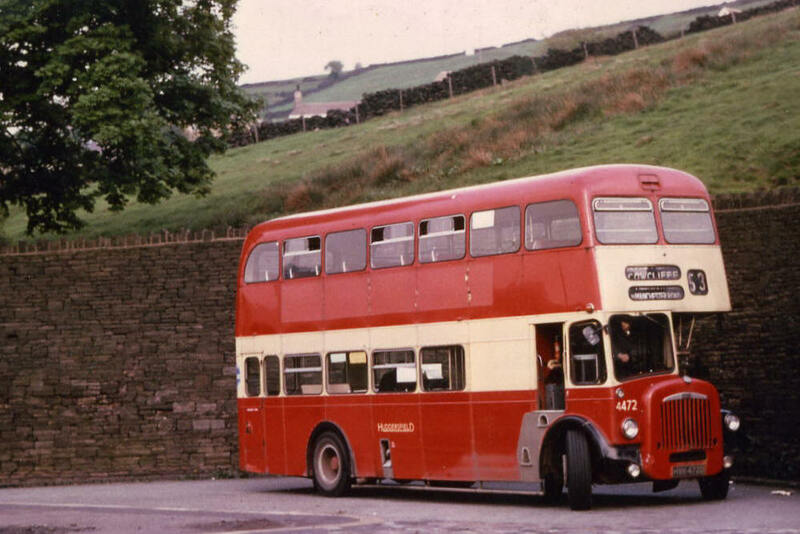 4154 (RVH454N) Daimler Fleetline CRG6LX67673 with C.H.Roe GO7384 H44/31F body built 1974, passed to Yorkshire Rider. 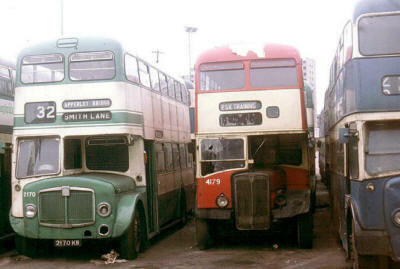 4155 (RVH455N) Daimler Fleetline CRG6LX67674 with C.H.Roe GO7378 H44/31F body built 1974, passed to Yorkshire Rider. 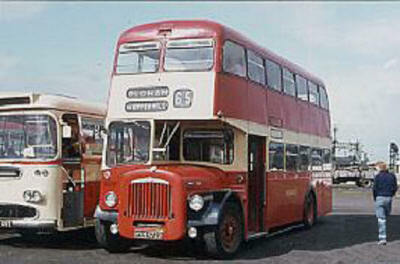 4156 (RVH456N) Daimler Fleetline CRG6LX67675 with C.H.Roe GO7389 H44/31F body built 1974, passed to Yorkshire Rider. 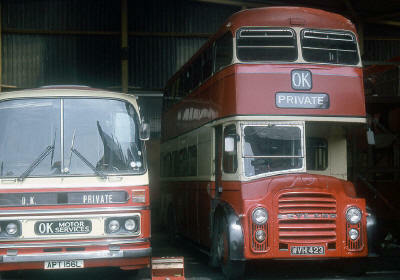 4157 (RVH457N) Daimler Fleetline CRG6LX67676 with C.H.Roe GO7377 H44/31F body built 1974, passed to Yorkshire Rider. 306 Huddersfield - Taylor Hill Circular. Seen at Market Place. 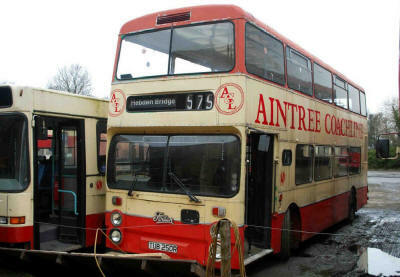 4158 (RVH458N) Daimler Fleetline CRG6LX67677 with C.H.Roe GO7386 H44/31F body built 1974, passed to Yorkshire Rider. 52 Huddersfield - Marsden Dirker. Seen on High Street. 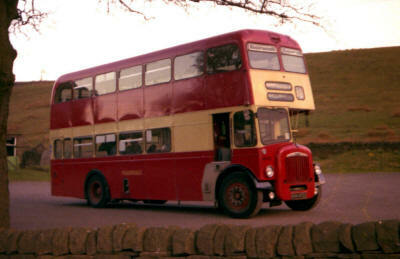 4159 (RVH459N) Daimler Fleetline CRG6LX67678 with C.H.Roe GO7383 H44/31F body built 1974, passed to Yorkshire Rider. 4160 (RVH460N) Daimler Fleetline CRG6LX67679 with C.H.Roe GO7385H44/31F body built 1974, passed to Yorkshire Rider. 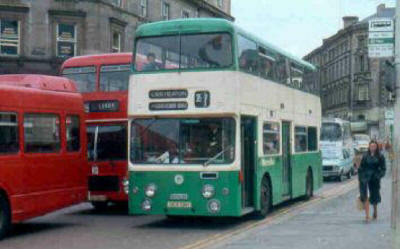 4161 (RVH461N) Daimler Fleetline CRG6LX67680 with C.H.Roe GO7380 H44/31F body built 1974, passed to Yorkshire Rider. 4162 (RVH462N) Daimler Fleetline CRG6LX67681 with C.H.Roe GO7387 H44/31F body built 1974, passed to Yorkshire Rider. 369 Huddersfield - All Saints School. Seen in Huddersfield Bus Station. 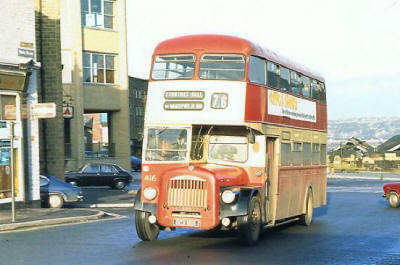 4163 (RVH463N) Daimler Fleetline CRG6LX67682 with C.H.Roe GO7387 H44/31F body built 1974, passed to Yorkshire Rider. 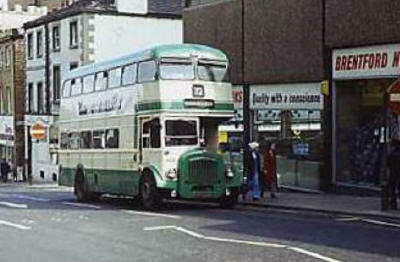 Huddersfield Jubilee bus. 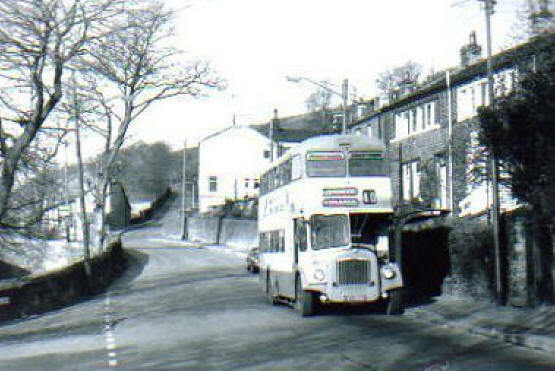 51 Huddersfield - Marsden Fall Lane. Seen at Fall Lane. 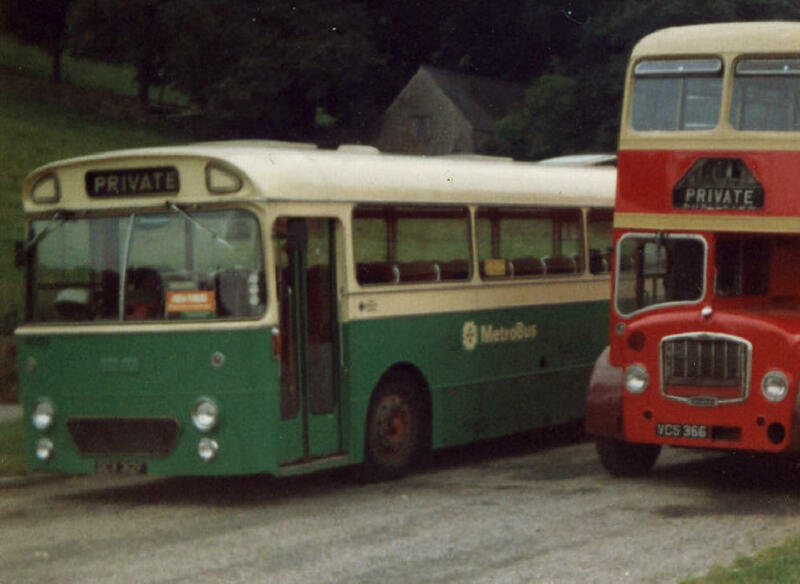 4164 (RVH464N) Daimler Fleetline CRG6LX67683 with C.H.Roe GO7379 NH44/31F body built 1974, passed to Yorkshire Rider. 4165 (RVH465N) Daimler Fleetline CRG6LX67684 with C.H.Roe GO7382 H44/31F body built 1974, passed to Yorkshire Rider. 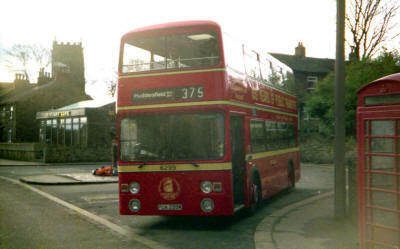 4166 (RVH466N) Daimler Fleetline CRG6LX67685 with C.H.Roe GO7375 H44/31F body built 1974, passed to Yorkshire Rider. 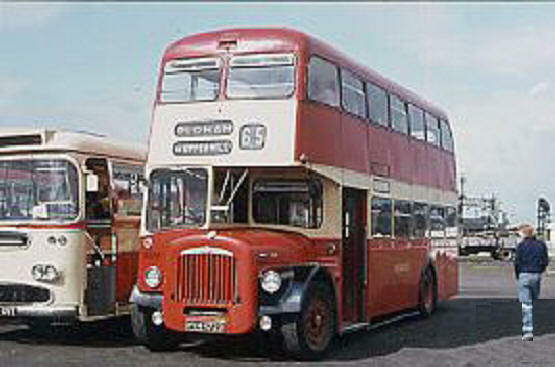 4167 (RVH467N) Daimler Fleetline CRG6LX67686 with C.H.Roe GO7388 H44/31F body built 1974, passed to Yorkshire Rider. 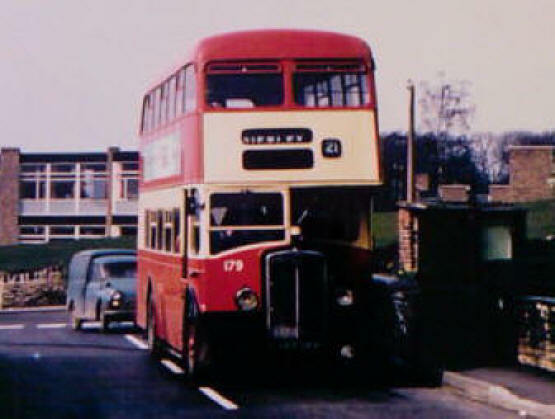 4168 (RVH468N) Daimler Fleetline CRG6LX67687 with C.H.Roe GO7391 H44/31F body built 1974, passed to Yorkshire Rider. 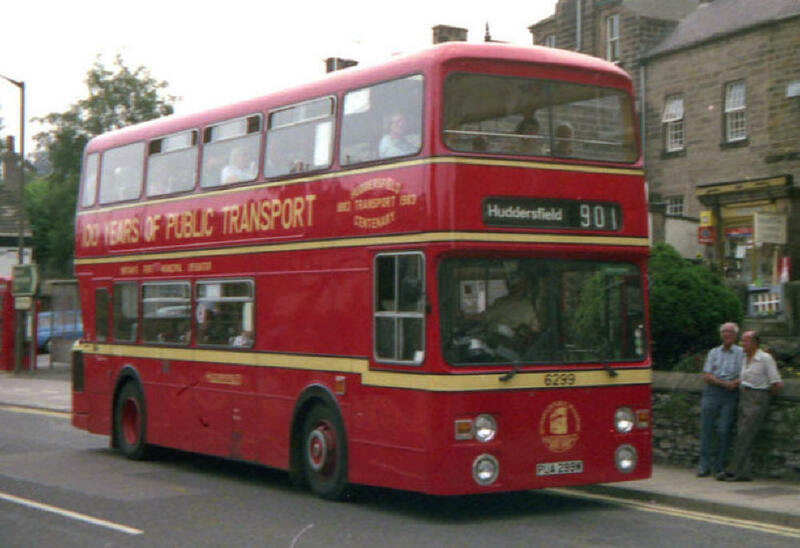 301 Huddersfield - Milnsbridge - Golcar. 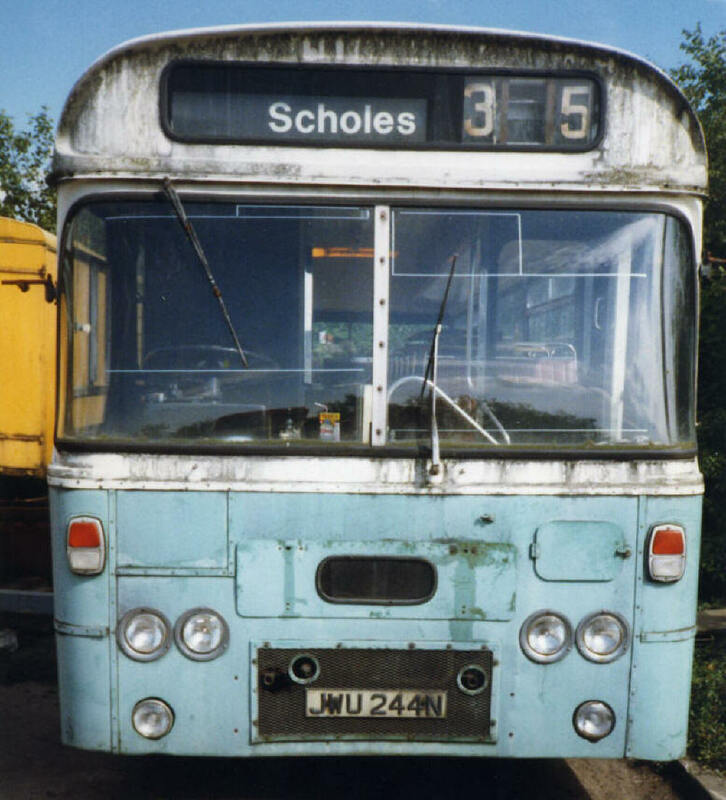 Seen at Huddersfield Bus Station. 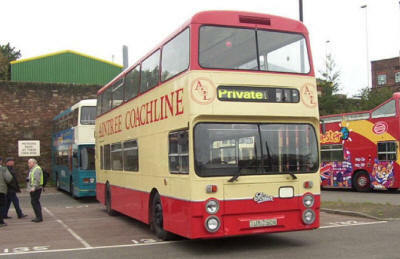 Seen on M1 Services, to Woburn Abbey. 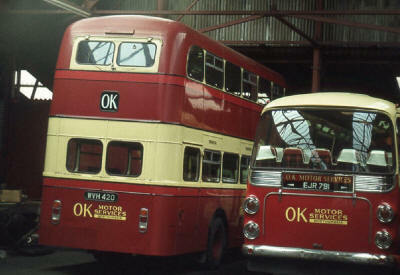 5148 (C148KBT) Leyland Olympian ONLXB/1R1946 with Optare 22 H47/29F body built 1/1986, Transferred to Bradford. 5149 (C149KBT) Leyland Olympian ONLXB/1R1947 with Optare 23 H47/29F body built 1/1986, Transferred to Bradford. 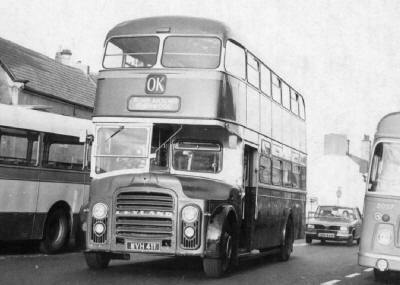 5150 (C150KBT) Leyland Olympian ONLXB/1R1948 with Optare 24 H47/29F body built 1/1986, Transferred to Bradford. 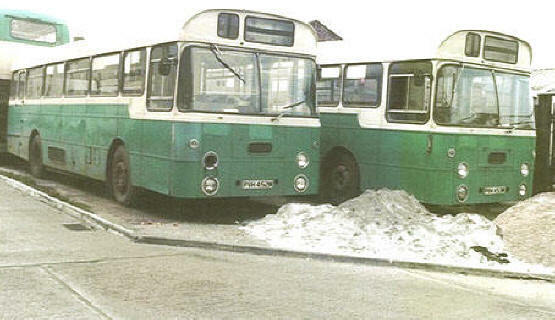 6267 (PUA267W) Leyland Atlantean AN68C/1R8001163 with C.H.Roe GO8347 H43/32F body built 12/1980, Passed to Yorkshire Rider, Badgerline & First Bus. 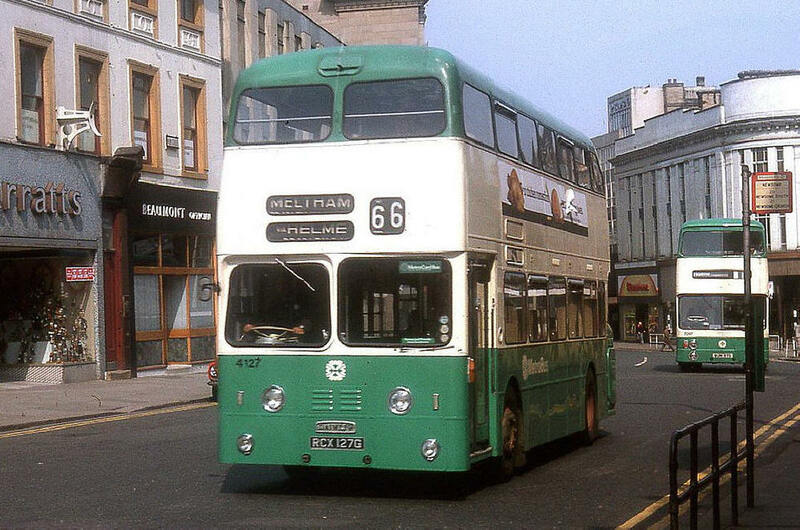 6268 (PUA268W) Leyland Atlantean AN68C/1R8001177 with C.H.Roe GO8348 H43/32F body built 12/1980, Passed to Yorkshire Rider, Badgerline & First Bus. 6269 (PUA269W) Leyland Atlantean AN68C/1R8001190 with C.H.Roe GO8349 H43/32F body built 12/1980, Passed to Yorkshire Rider, Badgerline & First Bus. 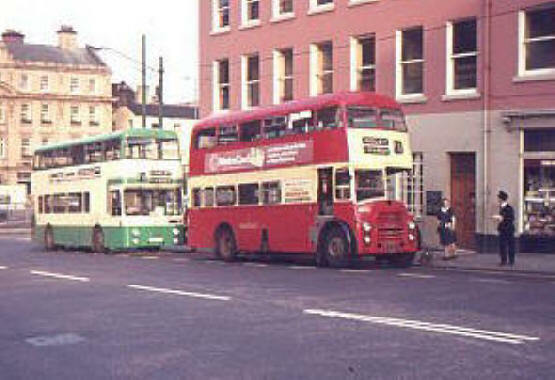 6270 (PUA270W) Leyland Atlantean AN68C/1R8001191 with C.H.Roe GO8350 H43/32F body built 12/1980, Passed to Yorkshire Rider, Badgerline & First Bus. 6271 (PUA271W) Leyland Atlantean AN68C/1R8001206 with C.H.Roe GO8351 H43/32F body built 12/1980, Passed to Yorkshire Rider, Badgerline & First Bus. 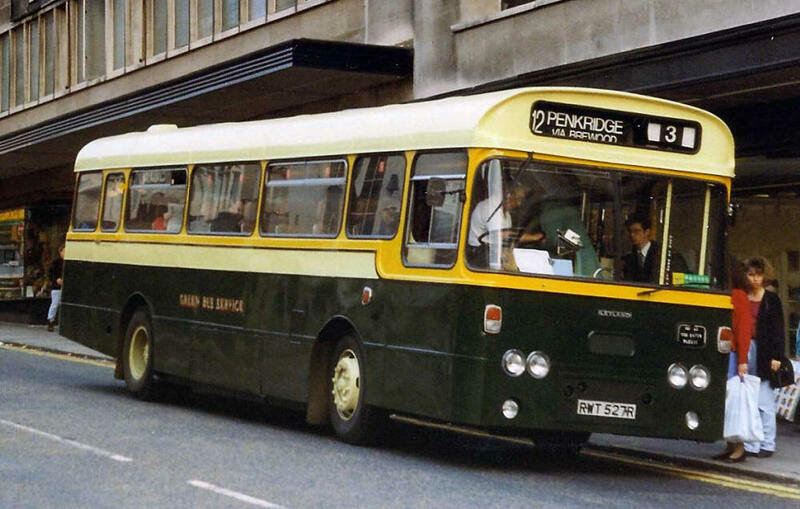 6272 (PUA272W) Leyland Atlantean AN68C/1R8001338 with C.H.Roe GO8352 H43/32F body built 12/1980, Passed to Yorkshire Rider, Badgerline & First Bus. 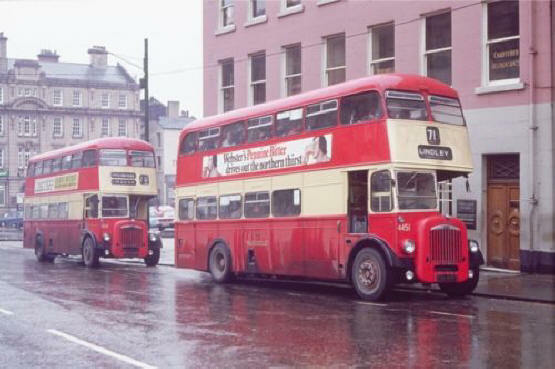 6273 (PUA273W) Leyland Atlantean AN68C/1R8001374 with C.H.Roe GO8353 H43/32F body built 12/1980, Passed to Yorkshire Rider, Badgerline & First Bus. 6294 (PUA294W) Leyland Atlantean AN68C/1R8002016 with C.H.Roe GO8394 H43/32F body built 3/1981, Passed to Yorkshire Rider, Badgerline & First Bus. Now Preserved. 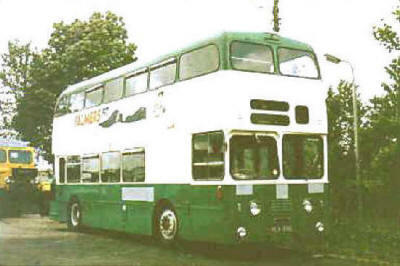 6295 (PUA295W) Leyland Atlantean AN68C/1R8002031 with C.H.Roe GO8395 H43/32F body built 3/1981, Passed to Yorkshire Rider, Badgerline & First Bus. 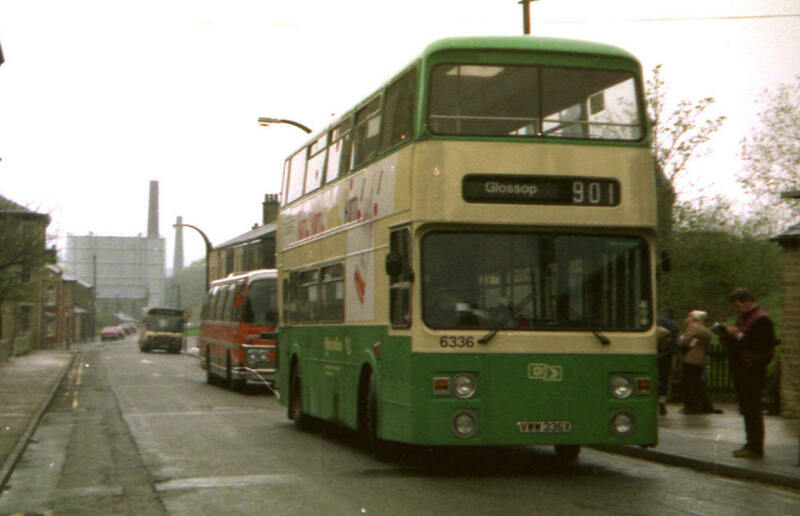 6296 (PUA296W) Leyland Atlantean AN68C/1R8002086 with C.H.Roe GO8396 H43/32F body built 3/1981, Passed to Yorkshire Rider, Badgerline & First Bus. 6297 (PUA297W) Leyland Atlantean AN68C/1R8002090 with C.H.Roe GO8397 H43/32F body built 3/1981, Passed to Yorkshire Rider, Badgerline & First Bus. 6298 (PUA298W) Leyland Atlantean AN68C/1R8002109 with C.H.Roe GO8398 H43/32F body built 3/1981, Passed to Yorkshire Rider, Badgerline & First Bus. 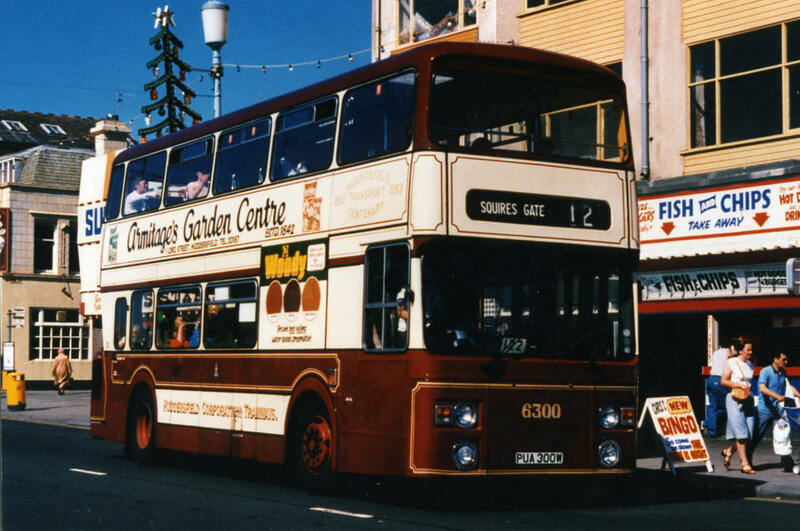 6299 (PUA299W) Leyland Atlantean AN68C/1R8002128 with C.H.Roe GO8399 H43/32F body built 3/1981, Loaned to Blackpool Corporation in 1985, Passed to Yorkshire Rider, Badgerline & First Bus. 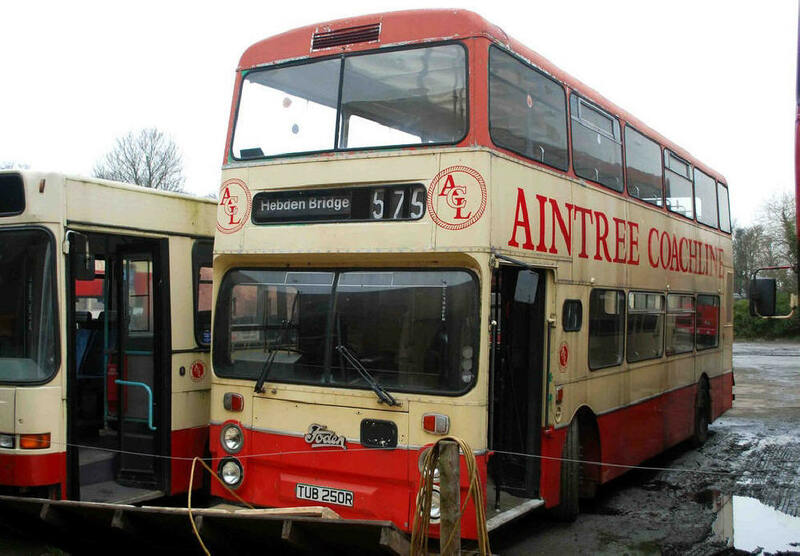 Sold for Preservation to Mel Munday then Gordon Beeby, now sold to become a cafe!. 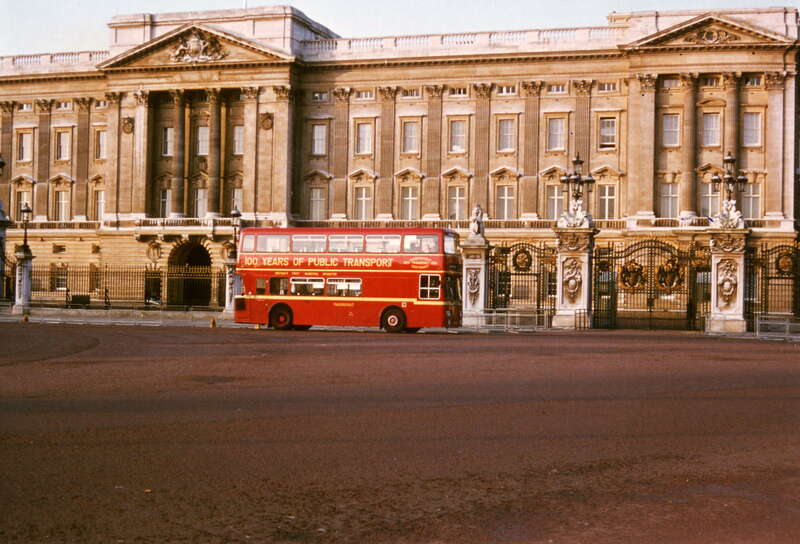 Seen at Buckingham Palace in 1983. 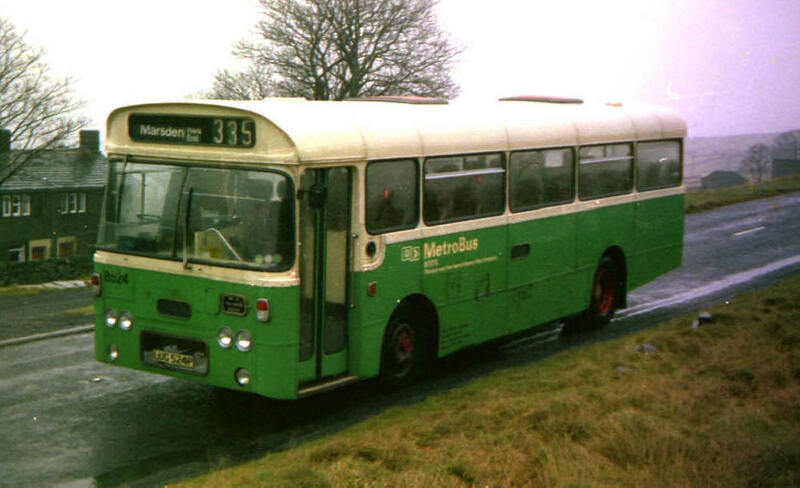 366 Waterloo - Huddersfield - Milnsbridge - Helme - Meltham. 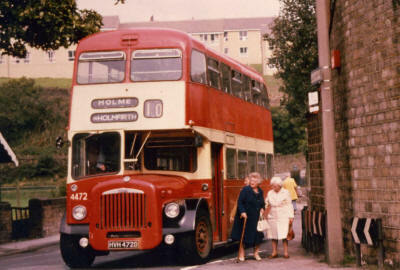 See at Helme when new. 302 Huddersfield - Milnsbridge - Golcar. Seen at Huddersfield Bus Station. 375 Almondbury - Huddersfield - Waterloo - Salendine Nook. Seen at Almondbury. 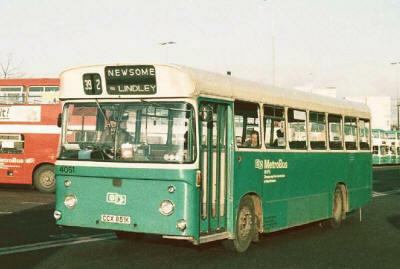 380 Huddersfield - Newsome South. 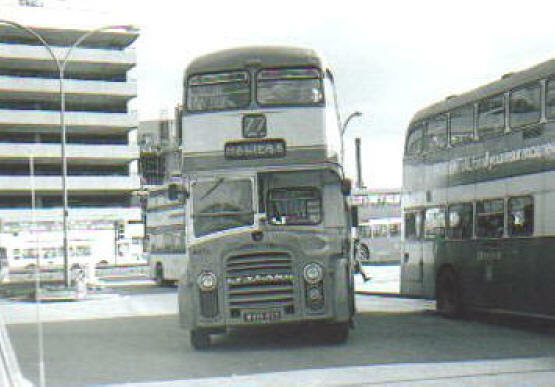 Seen at Huddersfield Bus Station. 380 Huddersfield - Newsome South. Seen at New Street. 380 Huddersfield - Newsome South. Seen at Huddersfield New Street. Seen in Huddersfield Bus Station. 901 Huddersfield - Holme Moss - Glossop - Ladybower - Castleton - Bakewell. Seen in Bakewell. 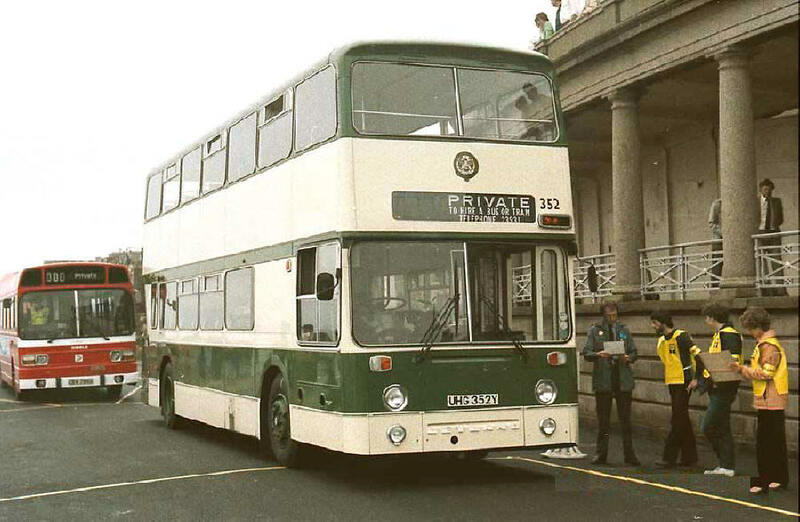 6300 (PUA300W) Leyland Atlantean AN68C/1R8002131 with C.H.Roe GO8400 H43/32F body built 3/1981, Loaned to Blackpool Corporation in 1985, Passed to Yorkshire Rider, Badgerline & First Bus. Sold for Preservation to Mel Munday then Gordon Beeby. 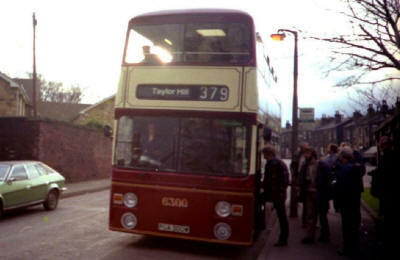 379 Huddersfield - Taylor Hill. Seen at Huddersfield Bus Station. 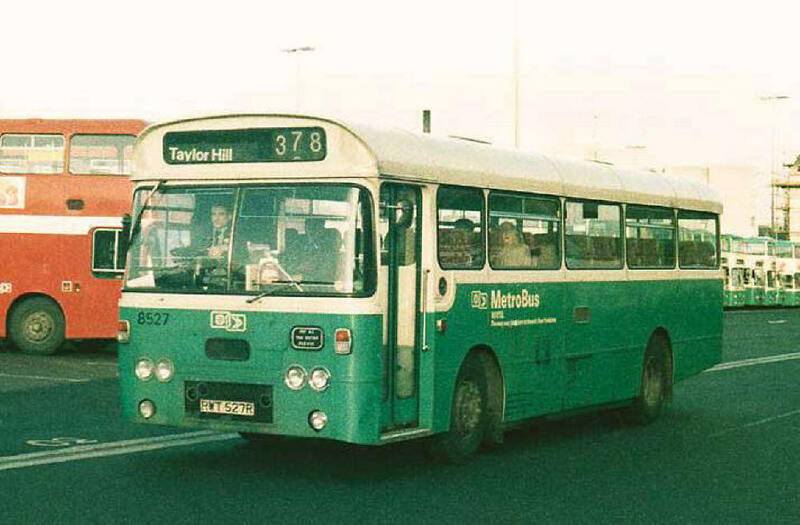 379 Huddersfield - Taylor Hill. Seen at Taylor Hill. 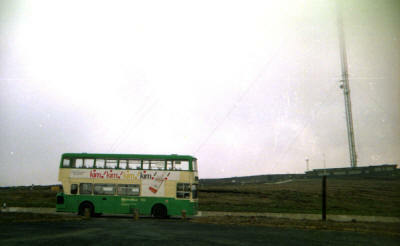 901 Huddersfield - Holme Moss - Glossop - Buxton - Matlock - Crich Tramway Museum. Seen in Crich Quarry. 373 Almondbury - Waterloo - Westgate - Lindley. Seen in Westgate. 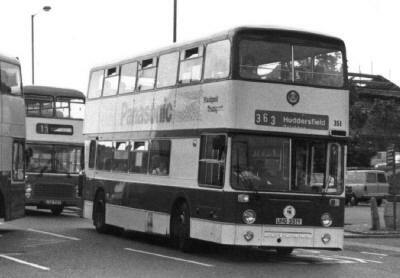 6312 (PUA312W) Leyland Atlantean AN68C/1R8002534 with C.H.Roe GO8412 H43/32F body built 7/1981, Passed to Yorkshire Rider, Badgerline & First Bus. 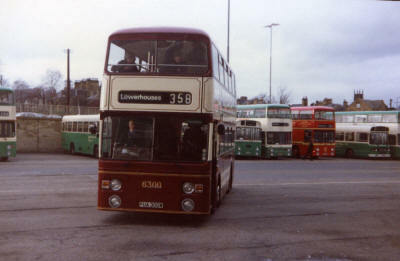 504 Huddersfield - Halifax - Riley Lane. Seen in Halifax. 6313 (PUA313W) Leyland Atlantean AN68C/1R8002734 with C.H.Roe GO8413 H43/32F body built 7/1981, Passed to Yorkshire Rider, Badgerline & First Bus. 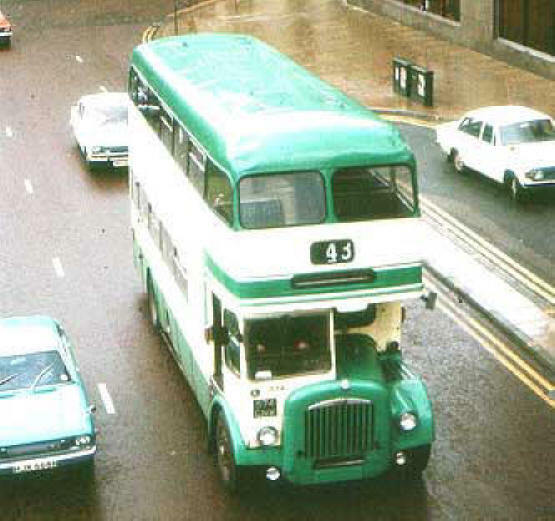 6314 (PUA314W) Leyland Atlantean AN68C/1R8002735 with C.H.Roe GO8414 H43/32F body built 7/1981, Passed to Yorkshire Rider, Badgerline & First Bus. 6315 (PUA315W) Leyland Atlantean AN68C/1R8002737 with C.H.Roe GO8415 H43/32F body built 7/1981, Passed to Yorkshire Rider, Badgerline & First Bus. 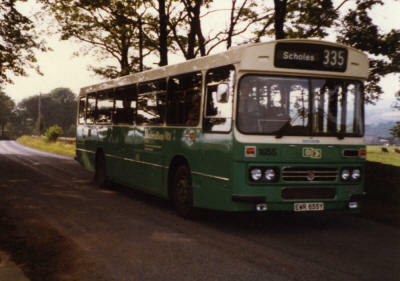 6336 (VWW336X) Leyland Atlantean AN68C/1R8100946 with C.H.Roe GO8510 H43/32F body built 10/1981, Passed to Yorkshire Rider, Badgerline & First Bus. 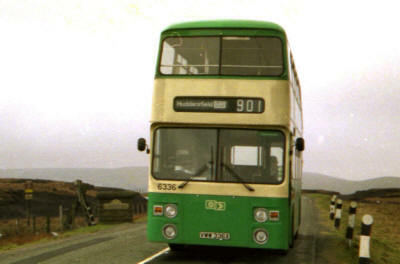 901 Huddersfield - Holme Moss - Glossop. Seen at Glossop. 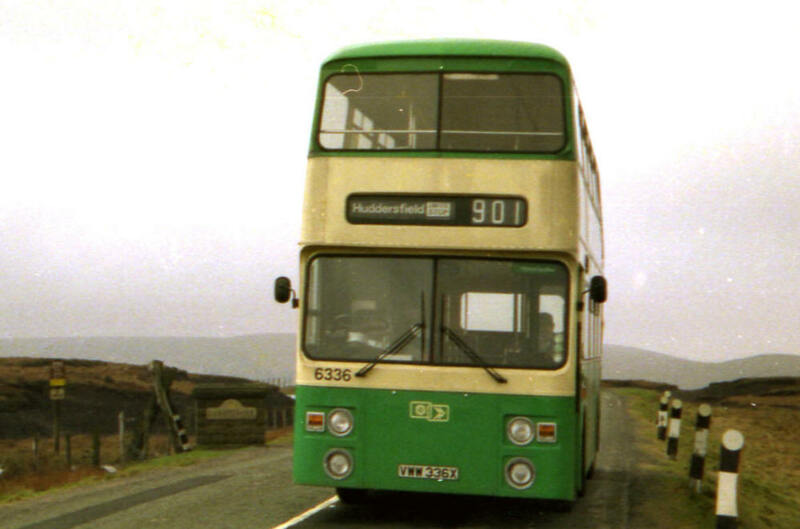 901 Huddersfield - Holme Moss - Glossop. 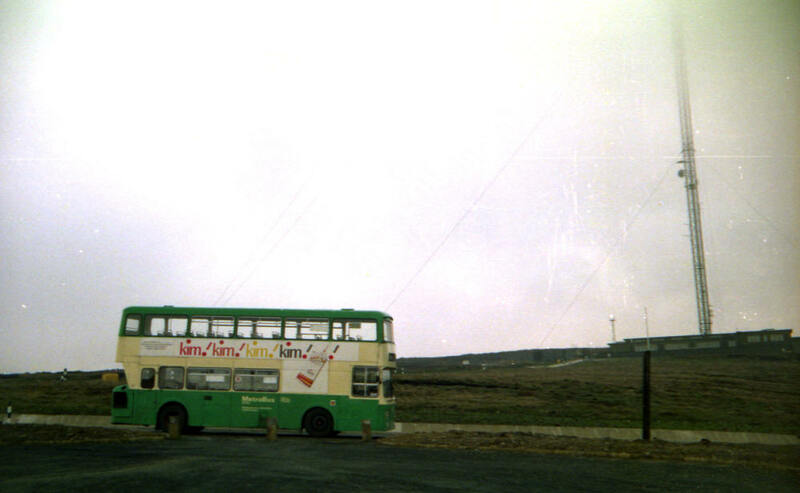 Seen at Holme Moss. 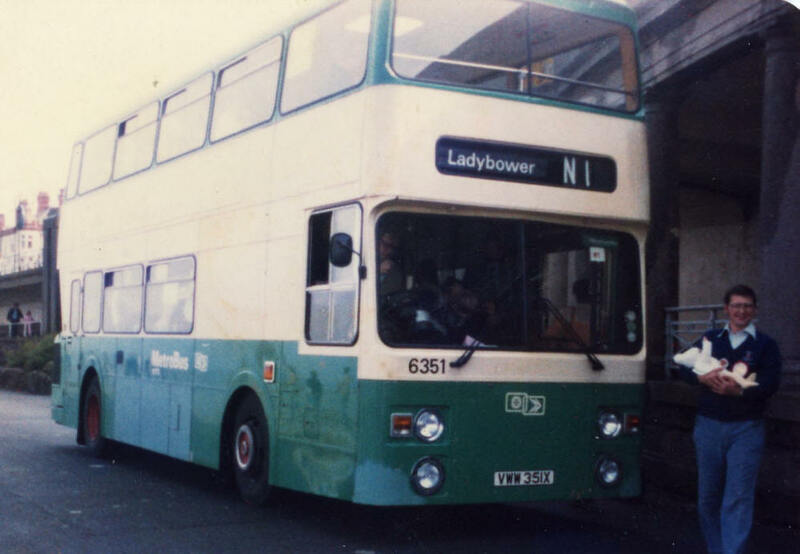 6337 (VWW337X) Leyland Atlantean AN68C/1R8100967 with C.H.Roe GO8511 H43/32F body built 10/1981, Passed to Yorkshire Rider, Badgerline & First Bus. 300 Shop Hopper service. Seen at the Market. 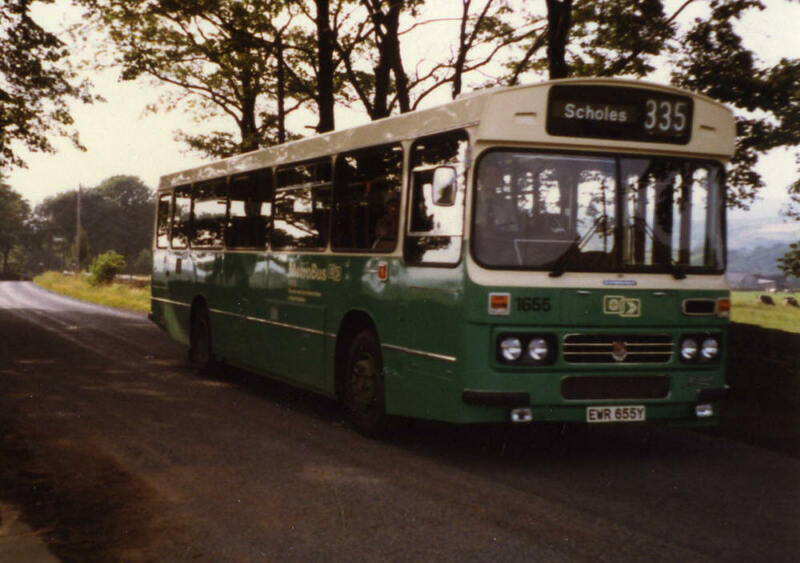 6338 (VWW338X) Leyland Atlantean AN68C/1R8100968 with C.H.Roe GO8512 H43/32F body built 10/1981, Passed to Yorkshire Rider, Badgerline & First Bus. 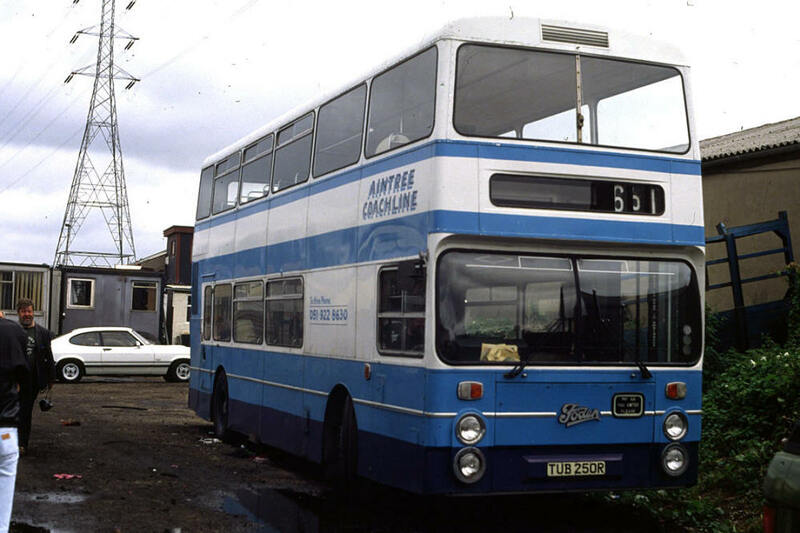 6339 (VWW339X) Leyland Atlantean AN68C/1R8101022 with C.H.Roe GO8513 H43/32F body built 11/1981, Passed to Yorkshire Rider, Badgerline & First Bus. 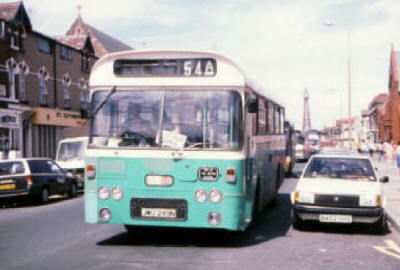 Seen at Rigby Road, Blackpool. 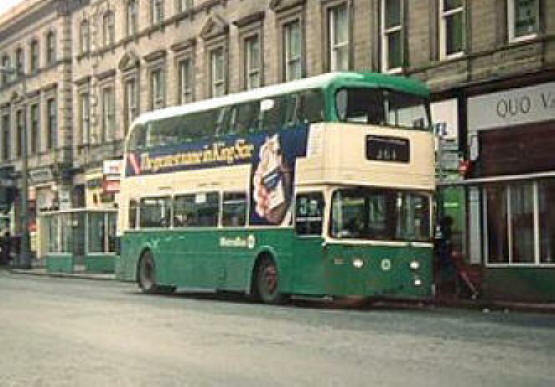 6349 (VWW349X) Leyland Atlantean AN68C/1R8101222 with C.H.Roe GO8523 H43/32F body built 11/1981, Passed to Yorkshire Rider, Badgerline & First Bus. 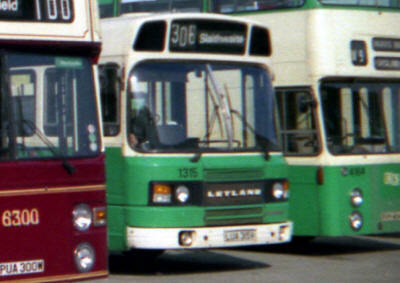 6350 (VWW350X) Leyland Atlantean AN68C/1R8101224 with C.H.Roe GO8524 H43/32F body built 11/1981, Passed to Yorkshire Rider, Badgerline & First Bus. 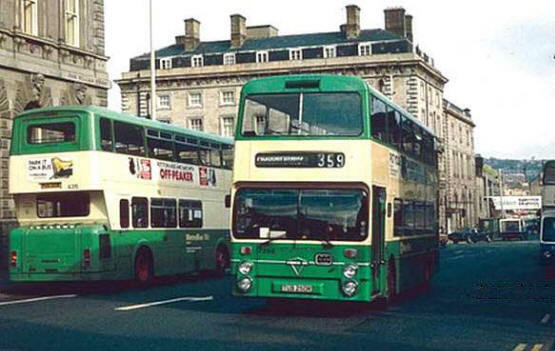 6351 (VWW351X) Leyland Atlantean AN68C/1R8101277 with C.H.Roe GO8525 H43/32F body built 11/1981, Passed to Yorkshire Rider, Badgerline & First Bus. 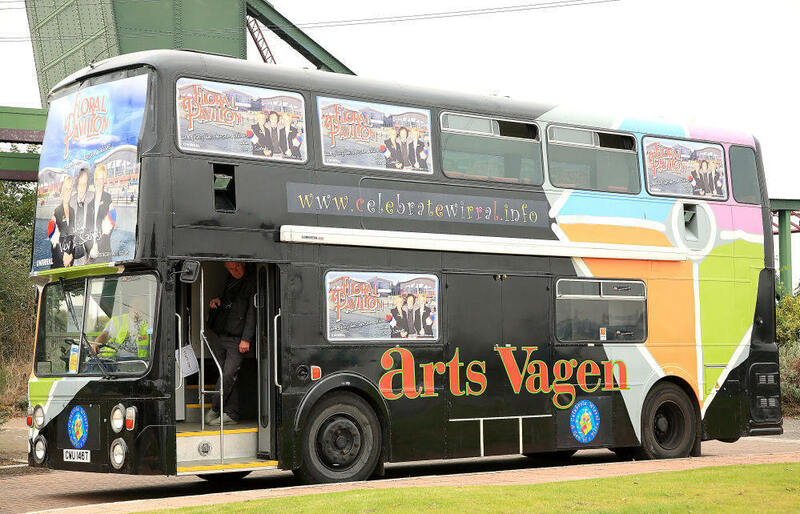 Seen at Middle Walk, Blackpool. 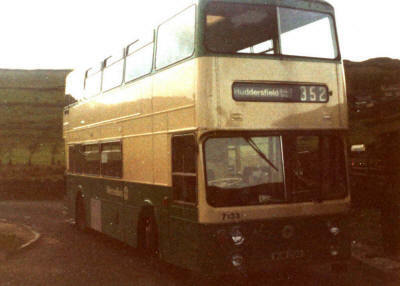 6352 (VWW352X) Leyland Atlantean AN68C/1R8101278 with C.H.Roe GO8526 H43/32F body built 11/1981, Passed to Yorkshire Rider, Badgerline & First Bus. 7011 (MNW11P) Leyland Fleetline FE30GR7504466 with C.H.Roe GO7643 H43/33F body built 3/1976, Passed to Yorkshire Rider & Badgerline. 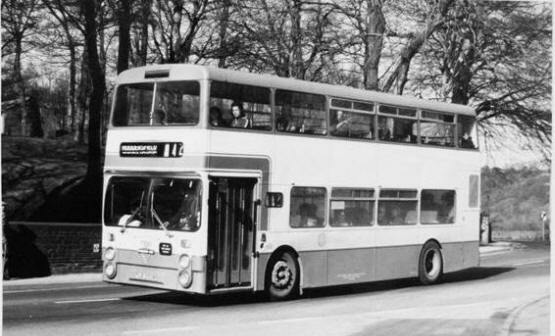 7012 (MNW12P) Leyland Fleetline FE30GR7504467 with C.H.Roe GO7644 H43/33F body built 3/1976, Passed to Yorkshire Rider & Badgerline. 7013 (MNW13P) Leyland Fleetline FE30GR7504468 with C.H.Roe GO7645 H43/33F body built 3/1976, Passed to Yorkshire Rider & Badgerline. 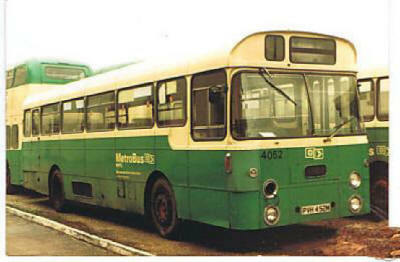 7014 (MNW14P) Leyland Fleetline FE30GR7504469 with C.H.Roe GO7653 H43/33F body built 3/1976, Passed to Yorkshire Rider & Badgerline. 7015 (MNW15P) Leyland Fleetline FE30GR7504848 with C.H.Roe GO7646 H43/33F body built 3/1976, Passed to Yorkshire Rider & Badgerline. 7016 (MNW16P) Leyland Fleetline FE30GR7505035 with C.H.Roe GO7647 H43/33F body built 3/1976, Passed to Yorkshire Rider & Badgerline. 7017 (MNW17P) Leyland Fleetline FE30GR7505102 with C.H.Roe GO7648 H43/33F body built 3/1976, Passed to Yorkshire Rider & Badgerline. 7018 (MNW18P) Leyland Fleetline FE30GR7505103 with C.H.Roe GO7649 H43/33F body built 3/1976, Passed to Yorkshire Rider & Badgerline. 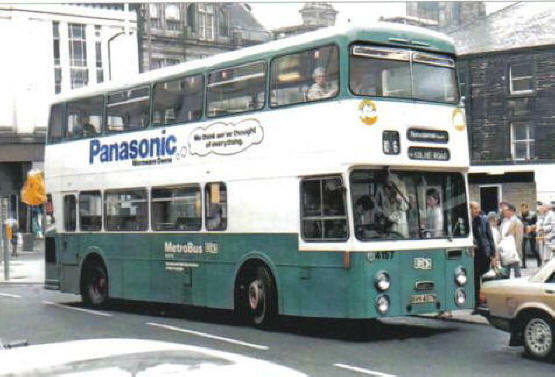 7019 (MNW19P) Leyland Fleetline FE30GR7505105 with C.H.Roe GO7650 H43/33F body built 3/1976, Passed to Yorkshire Rider & Badgerline. 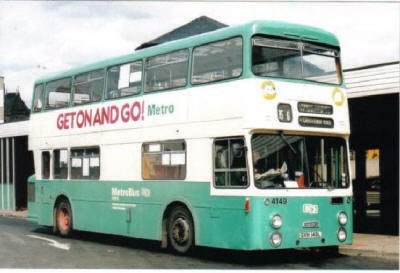 7020 (MNW20P) Leyland Fleetline FE30GR7505268 with C.H.Roe GO7651 H43/33F body built 3/1976, Passed to Yorkshire Rider & Badgerline. 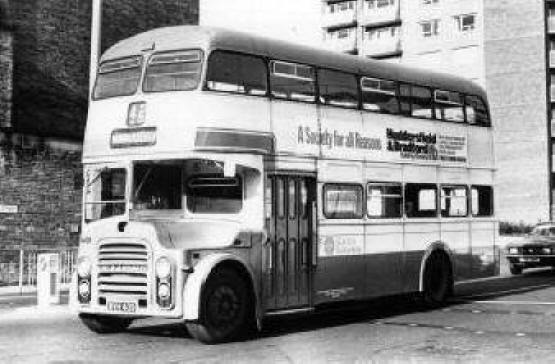 7021 (MNW21P) Leyland Fleetline FE30GR7505270 with C.H.Roe GO7652 H43/33F body built 3/1976, Passed to Yorkshire Rider & Badgerline. 7057 (RWU57R) Leyland Fleetline FE30GR7602256 with C.H.Roe GO7737 H43/33F body built 9/1976, Passed to Yorkshire Rider & Badgerline. 7058 (RWU58R) Leyland Fleetline FE30GR7603032 with C.H.Roe GO7738 H43/33F body built 9/1976, Passed to Yorkshire Rider & Badgerline. 7059 (RWU59R) Leyland Fleetline FE30GR7603058 with C.H.Roe GO7739 H43/33F body built 9/1976, Passed to Yorkshire Rider & Badgerline. 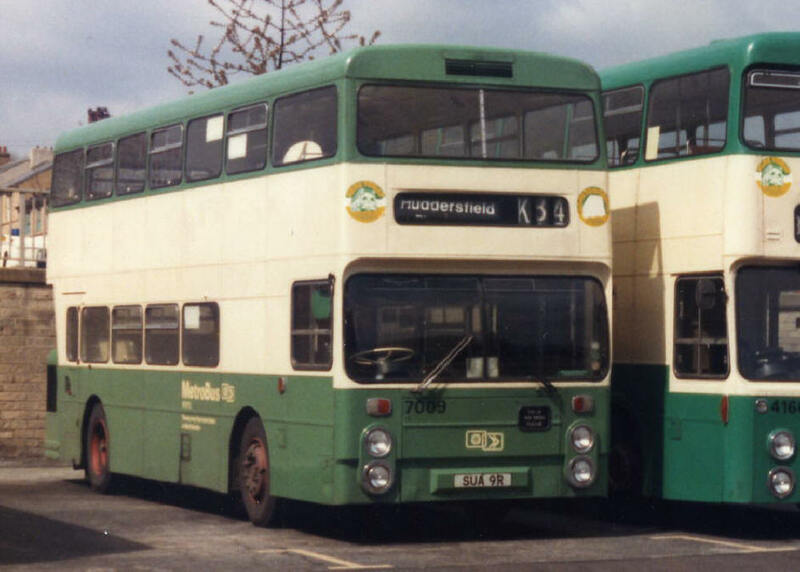 7060 (RWU60R) Leyland Fleetline FE30GR7603355 with C.H.Roe GO7740 H43/33F body built 9/1976, Passed to Yorkshire Rider & Badgerline. 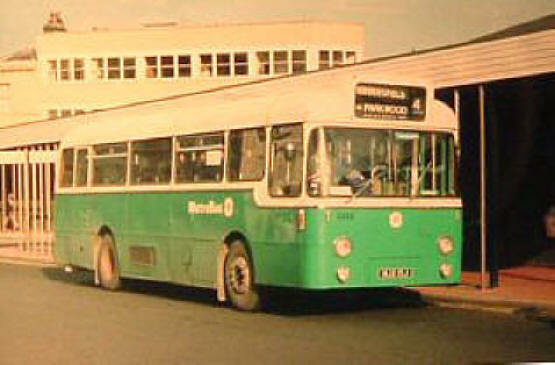 7061 (RWU61R) Leyland Fleetline FE30GR7603377 with C.H.Roe GO7741 H43/33F body built 10/1976, Passed to Yorkshire Rider & Badgerline. 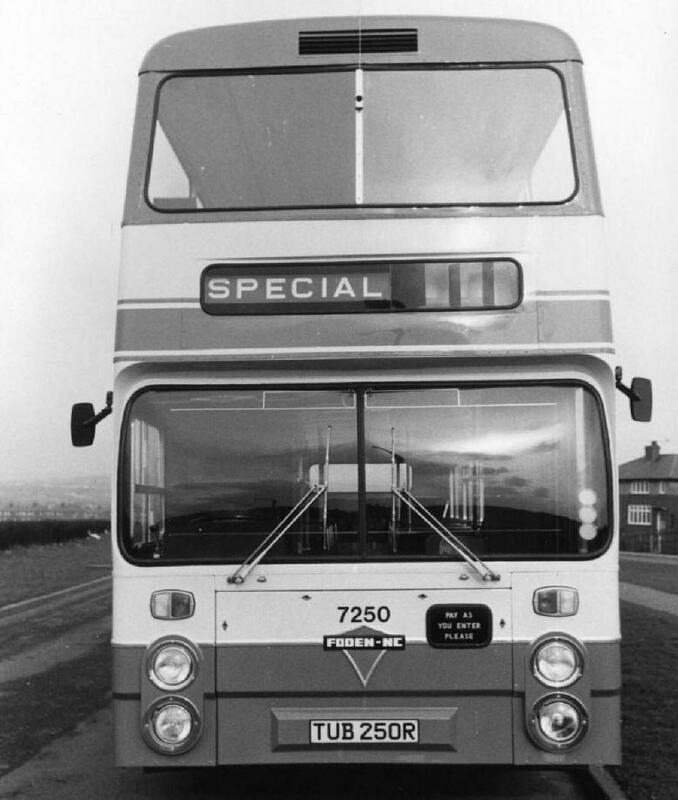 7062 (RWU62R) Leyland Fleetline FE30GR7603788 with C.H.Roe GO7742 H43/33F body built 10/1976, Passed to Yorkshire Rider & Badgerline. 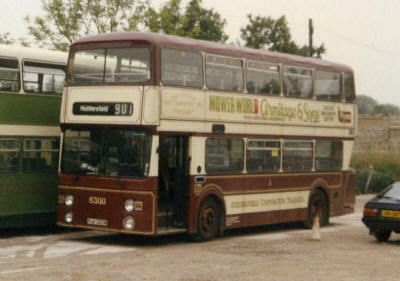 7063 (RWU63R) Leyland Fleetline FE30GR7603801 with C.H.Roe GO7743 H43/33F body built 10/1976, Passed to Yorkshire Rider & Badgerline. 7064 (RWU64R) Leyland Fleetline FE30GR7603802 with C.H.Roe GO7744 H43/33F body built 10/1976, Passed to Yorkshire Rider & Badgerline. 7065 (RWU65R) Leyland Fleetline FE30GR7603827 with C.H.Roe GO7745 H43/33F body built 10/1976, Passed to Yorkshire Rider & Badgerline. 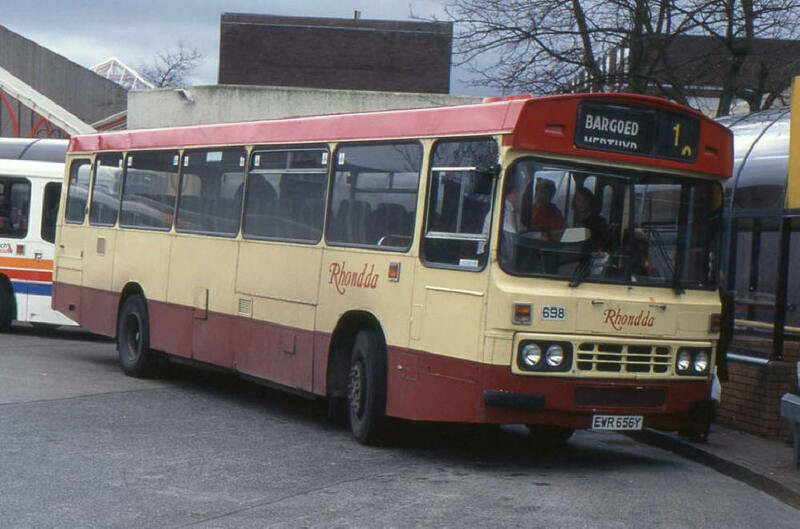 7066 (RWU66R) Leyland Fleetline FE30GR7603828 with C.H.Roe GO7746 H43/33F body built 10/1976, Passed to Yorkshire Rider & Badgerline. 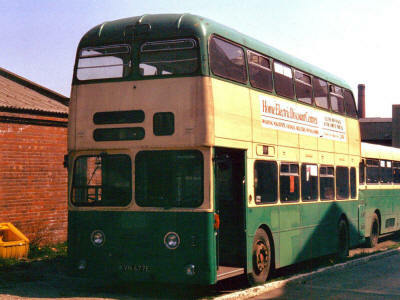 7092 (WUM92S) Leyland Fleetline FE30AGR7703771 with C.H.Roe GO7902 H43/33F body built 12/1977, Passed to Yorkshire Rider & Badgerline. 7093 (WUM92S) Leyland Fleetline FE30AGR7703772 with C.H.Roe GO7903 H43/33F body built 12/1977, Passed to Yorkshire Rider & Badgerline. 7094 (WUM94S) Leyland Fleetline FE30AGR7703691 with C.H.Roe GO7909 H43/33F body built 12/1977, Passed to Yorkshire Rider & Badgerline. 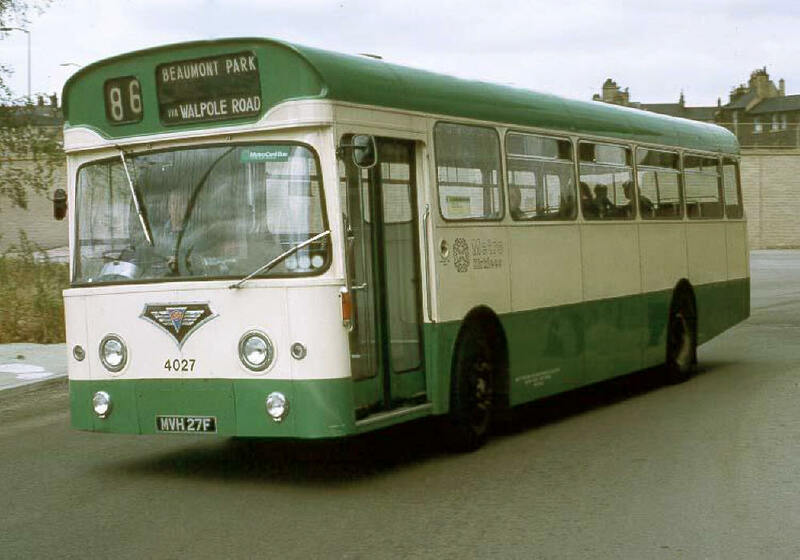 7095 (WUM95S) Leyland Fleetline FE30AGR7703819 with C.H.Roe GO7904 H43/33F body built 12/1977, Passed to Yorkshire Rider & Badgerline. 7096 (WUM96S) Leyland Fleetline FE30AGR7703820 with C.H.Roe GO7905 H43/33F body built 12/1977, Passed to Yorkshire Rider & Badgerline. 7097 (WUM97S) Leyland Fleetline FE30AGR7703998 with C.H.Roe GO7906 H43/33F body built 12/1977, Passed to Yorkshire Rider & Badgerline. 7098 (WUM98S) Leyland Fleetline FE30AGR7704006 with C.H.Roe GO7908 H43/33F body built 1/1978, Passed to Yorkshire Rider & Badgerline. 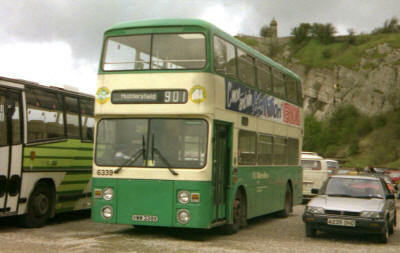 7099 (WUM99S) Leyland Fleetline FE30AGR7704021 with C.H.Roe GO7907 H43/33F body built 1/1978, Passed to Yorkshire Rider & Badgerline. 7100 (WUM100S) Leyland Fleetline FE30AGR7704022 with C.H.Roe GO7910 H43/33F body built 1/1978, Passed to Yorkshire Rider & Badgerline. 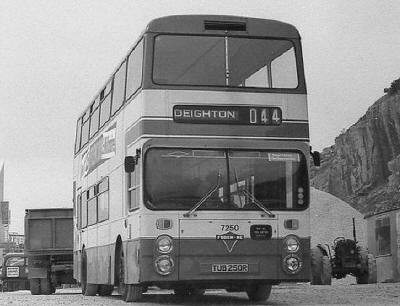 7101 (WUM101S) Leyland Fleetline FE30AGR7704179 with C.H.Roe GO7912 H43/33F body built 2/1978, Passed to Yorkshire Rider & Badgerline. 7102 (WUM102S) Leyland Fleetline FE30AGR7704180 with C.H.Roe GO7913 H43/33F body built 2/1978, Passed to Yorkshire Rider & Badgerline. 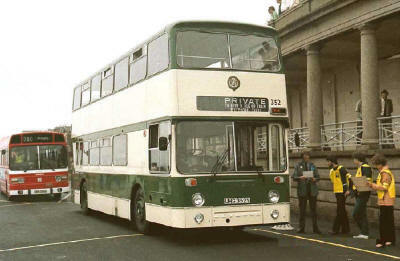 7103 (WUM103S) Leyland Fleetline FE30AGR7704181 with C.H.Roe GO7918 H43/33F body built 2/1978, Passed to Yorkshire Rider & Badgerline. 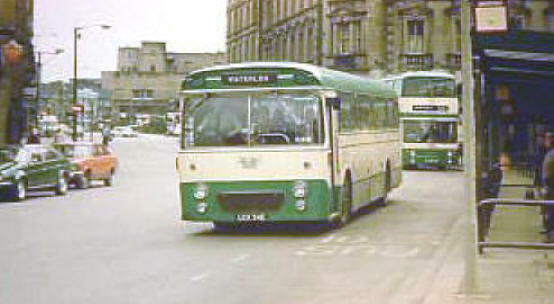 7104 (WUM104S) Leyland Fleetline FE30AGR7704188 with C.H.Roe GO7926 H43/33F body built 3/1978, Passed to Yorkshire Rider & Badgerline. 7110 (WUM110S) Leyland Fleetline FE30AGR7704489 with C.H.Roe GO7911 H43/33F body built 3/1978, Passed to Yorkshire Rider & Badgerline. 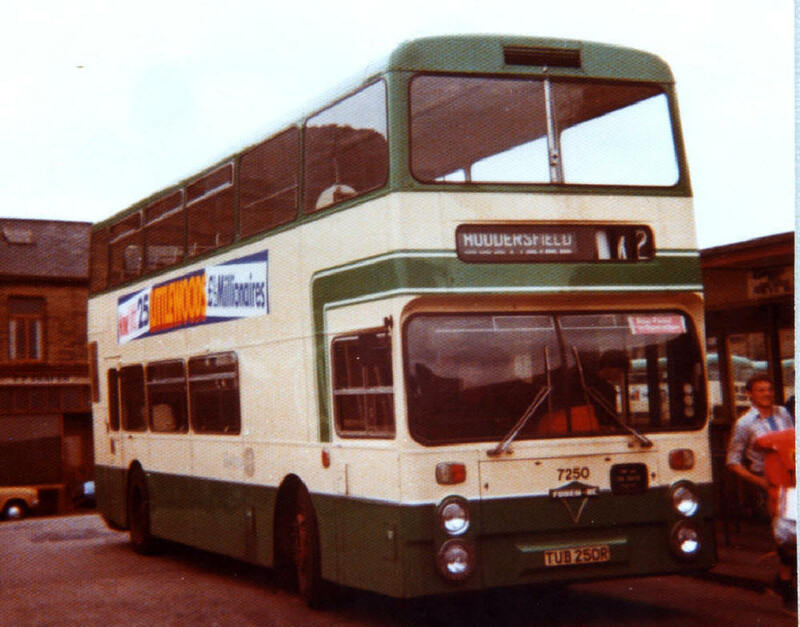 7129 (WUM129S) Leyland Fleetline FE30AGR7705931 with C.H.Roe GO7943 H43/33F body built 5/1978, Passed to Yorkshire Rider & Badgerline. 7130 (WUM130S) Leyland Fleetline FE30AGR7705932 with C.H.Roe GO7944 H43/33F body built 5/1978, Passed to Yorkshire Rider & Badgerline. 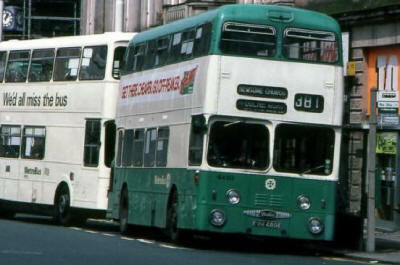 7131 (WUM131S) Leyland Fleetline FE30AGR7705937 with C.H.Roe GO7948 H43/33F body built 6/1978, Passed to Yorkshire Rider & Badgerline. 7132 (WUM132S) Leyland Fleetline FE30AGR7800003 with C.H.Roe GO7955 H43/33F body built 6/1978, Passed to Yorkshire Rider & Badgerline. 7133 (WUM133S) Leyland Fleetline FE30AGR7800028 with C.H.Roe GO7946 H43/33F body built 5/1978, Passed to Yorkshire Rider & Badgerline. 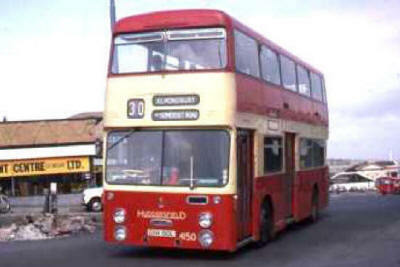 350 Huddersfield - Marsden Hard End. Seen at Hard End, Destination set for next journey 352 to Marsden Dirker. 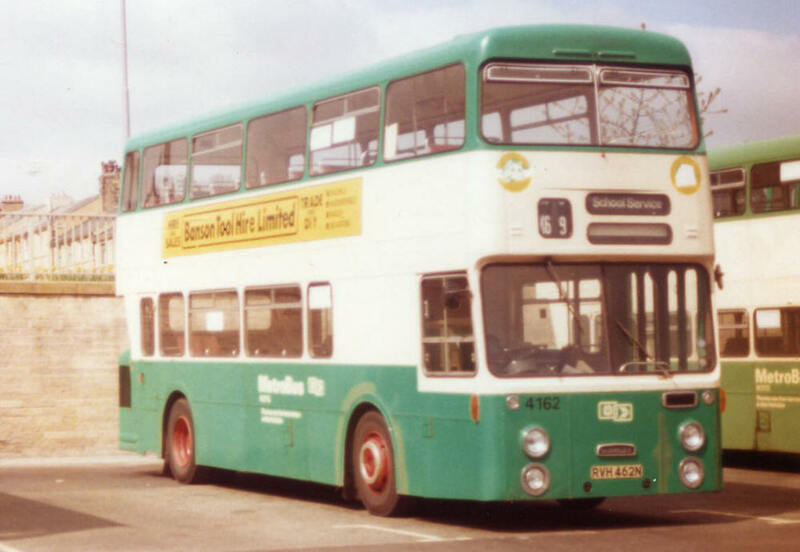 7135 (WUM135S) Leyland Fleetline FE30AGR7800152 with C.H.Roe GO7941 H43/33F body built 4/1978, Passed to Yorkshire Rider & Badgerline. 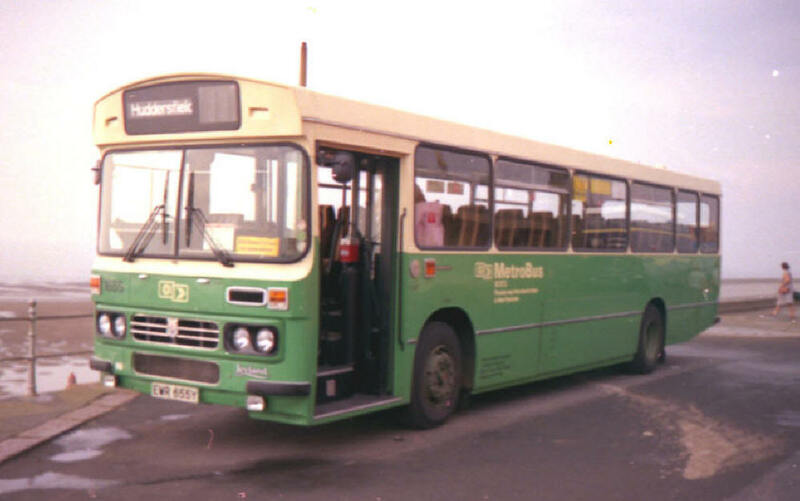 7136 (CWU136T) Leyland Fleetline FE30AGR7801070 with C.H.Roe GO7956 H43/33F body built 9/1978, Passed to Yorkshire Rider & Badgerline. 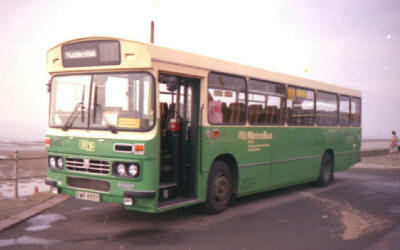 7137 (CWU137T) Leyland Fleetline FE30AGR7801112 with C.H.Roe GO7958 H43/33F body built 9/1978, Passed to Yorkshire Rider & Badgerline. 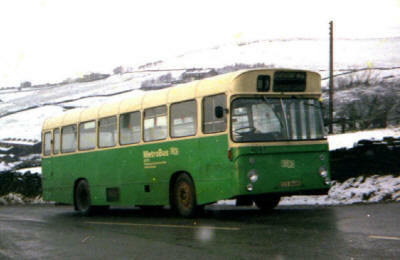 7138 (CWU138T) Leyland Fleetline FE30AGR7801256 with C.H.Roe GO7957 H43/33F body built 9/1978, Passed to Yorkshire Rider & Badgerline. 7139 (CWU139T) Leyland Fleetline FE30AGR7801302 with C.H.Roe GO7960 H43/33F body built 9/1978, Passed to Yorkshire Rider & Badgerline. 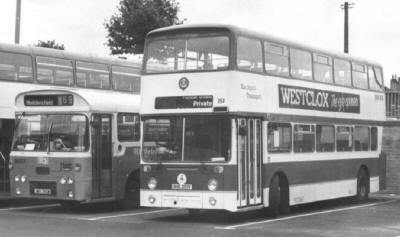 7140 (CWU140T) Leyland Fleetline FE30AGR7801302 with C.H.Roe GO7959 H43/33F body built 9/1978, Passed to Yorkshire Rider & Badgerline. 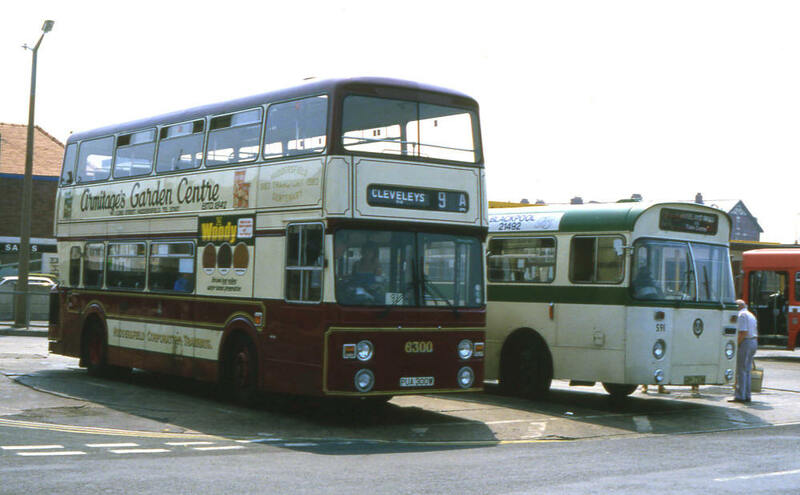 7141 (CWU141T) Leyland Fleetline FE30AGR7801328 with C.H.Roe GO7961H43/33F body built 9/1978, Passed to Yorkshire Rider & Badgerline. 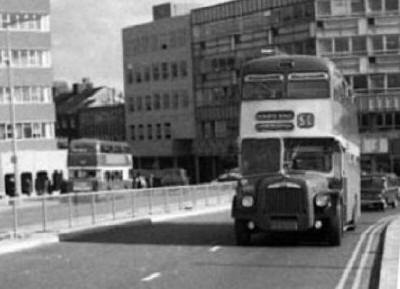 7142 (CWU142T) Leyland Fleetline FE30AGR7801329 with C.H.Roe GO7962 H43/33F body built 9/1978, Passed to Yorkshire Rider & Badgerline. 7143 (CWU143T) Leyland Fleetline FE30AGR7801684 with C.H.Roe GO7974 H43/33F body built 9/1978, Passed to Yorkshire Rider & Badgerline. 7144 (CWU144T) Leyland Fleetline FE30AGR7801685 with C.H.Roe GO7967 H43/33F body built 9/1978, Passed to Yorkshire Rider & Badgerline. 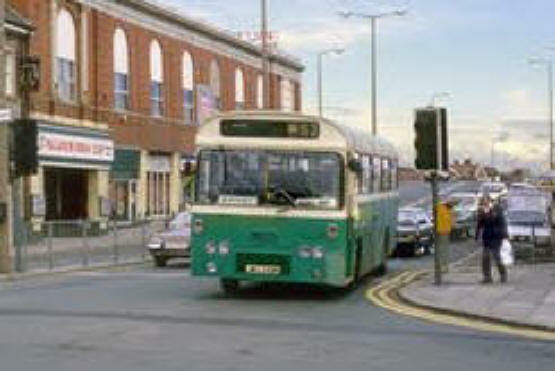 7145 (CWU145T) Leyland Fleetline FE30AGR7801694 with C.H.Roe GO7963 H43/33F body built 9/1978, Passed to Yorkshire Rider & Badgerline. Sold to Gray Line, Ottawa. 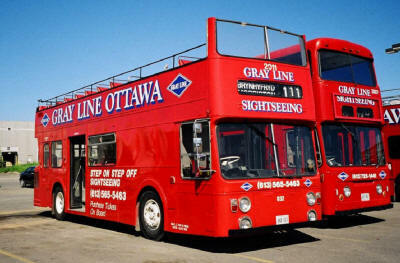 Seen with Gray Line, Ottawa Canada. 7146 (CWU146T) Leyland Fleetline FE30AGR7801695 with C.H.Roe GO7964 H43/33F body built 9/1978, Passed to Yorkshire Rider & Badgerline. 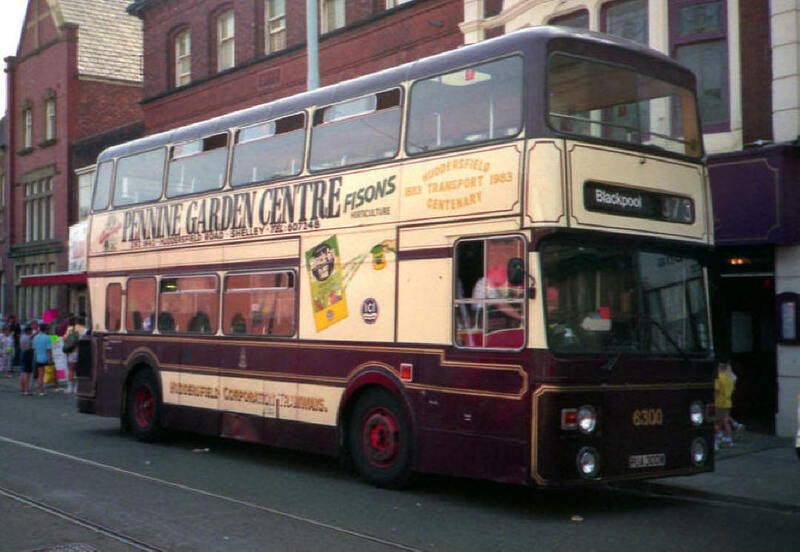 Sold to Floral Pavilian, Birkenhead. 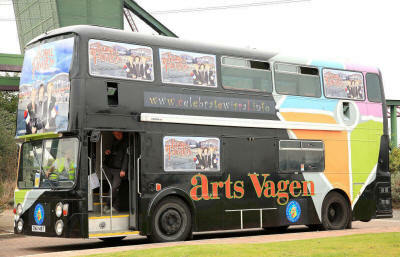 Seen with Floral Pavilion, Birkenhead. 7147 (CWU147T) Leyland Fleetline FE30AGR7801697 with C.H.Roe GO7965 H43/33F body built 9/1978, Passed to Yorkshire Rider & Badgerline. 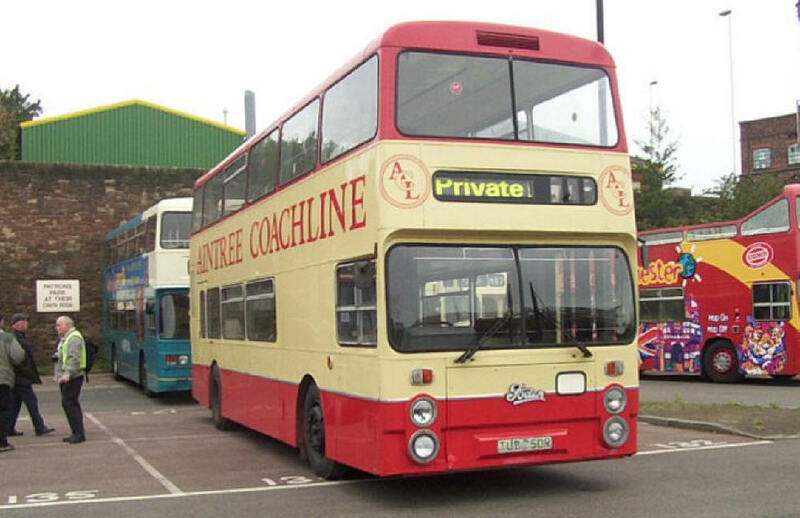 7148 (CWU148T) Leyland Fleetline FE30AGR7801720 with C.H.Roe GO7969 H43/33F body built 9/1978, Passed to Yorkshire Rider & Badgerline. 7149 (CWU149T) Leyland Fleetline FE30AGR7801760 with C.H.Roe GO7966 H43/33F body built 9/1978, Passed to Yorkshire Rider & Badgerline. 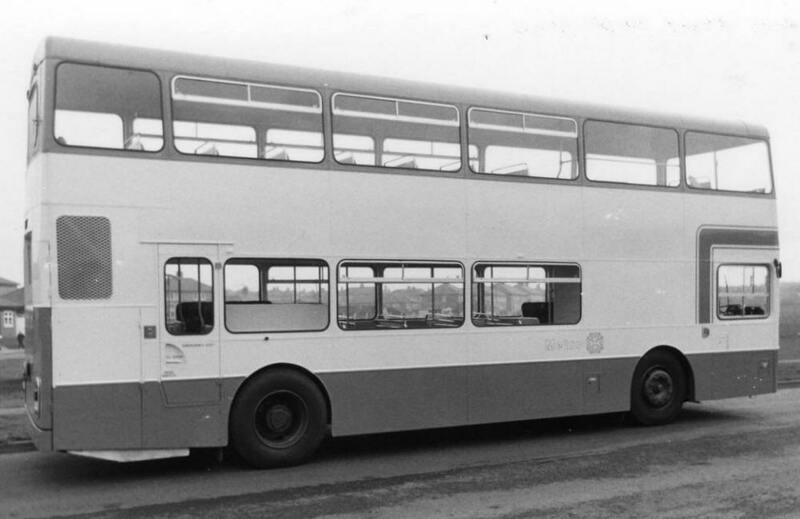 7150 (CWU150T) Leyland Fleetline FE30AGR7802038 with C.H.Roe GO7968 H43/33F body built 9/1978, Passed to Yorkshire Rider & Badgerline. 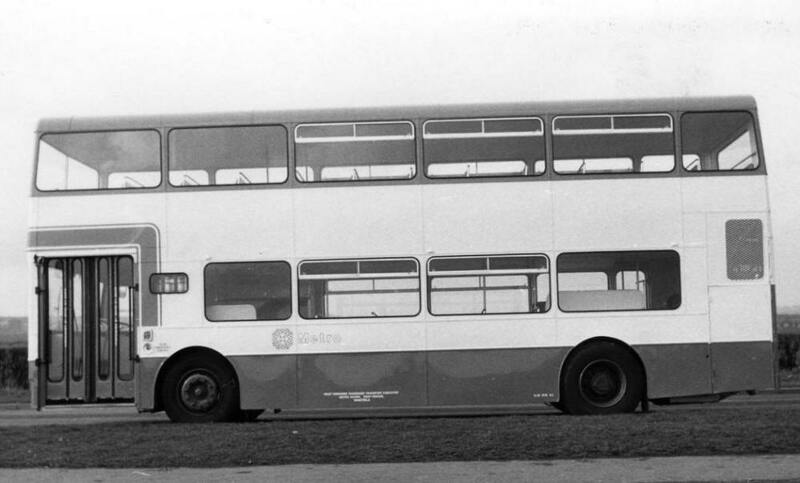 7151 (CWU151T) Leyland Fleetline FE30AGR7802039 with C.H.Roe GO7970 H43/33F body built 9/1978, Passed to Yorkshire Rider & Badgerline. 7250 (TUB250R) Foden-NC 04B018G180093742 with Northern Counties 8133 H43/31F body built 3/1977, Sold for Preservation in Weymouth, Sold to Aintree Coachline back in service & still in service 2012. 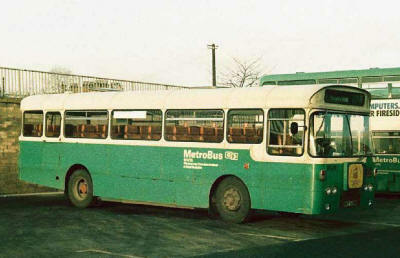 Seen with Northern Counties, Wigan before delivery. 42 Huddersfield - Elland - West Vale - Halifax. Seen at Calder & Hebble. 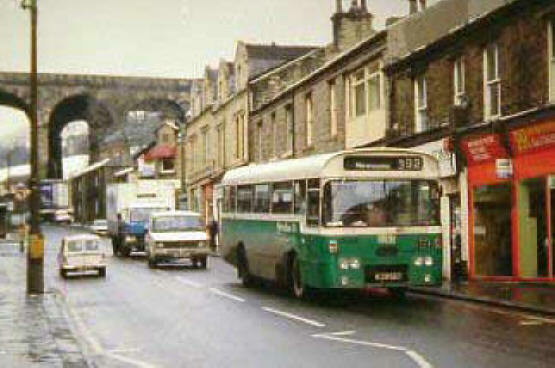 Seen in Merton Street, Huddersfield. 48 Huddersfield - Slaithwaite - Hill Top. Seen in Huddersfield Bus Station. Seen on Huddersfield, John William Street. 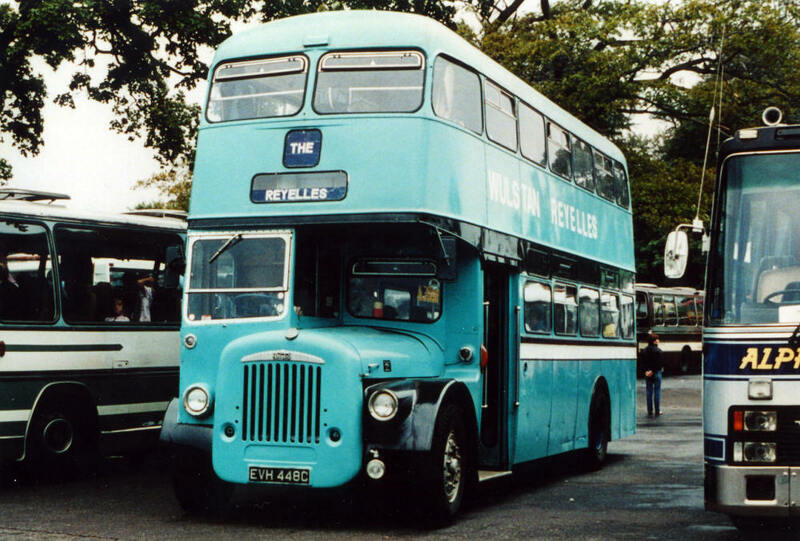 8501 (JWU244N) Leyland Leopard PSU4C/4R7501070 with Plaxton Derwent 7510LB802 DP43F body built 6/1975. Loaned to Easyway, Blackpool. 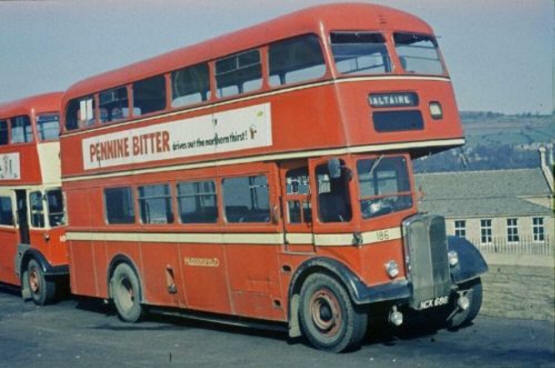 Then given to Mining Museum, Sold to Huddersfield Passenger Transport Group, passed to Mel Munday, Leny Spence & Gordon Beeby, sold for further Preservation. 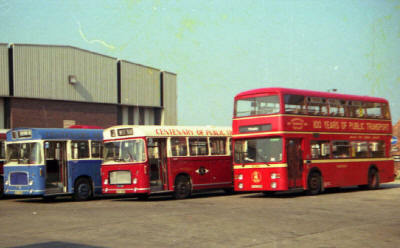 8502 (JWU245N) Leyland Leopard PSU4C/4R7501071 with Plaxton Derwent 7510LB805 DP43F body built 6/1975. Loaned to Easyway, Blackpool. 57 Huddersfield - Lepton seen in Huddersfield Bus Station. 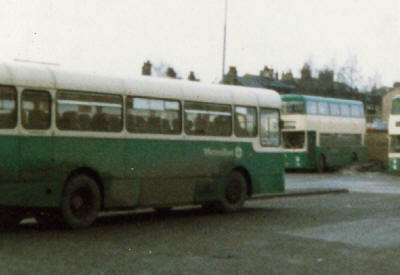 8503 (JWU246N) Leyland Leopard PSU4C/4R7501073 with Plaxton Derwent 7510LB806 DP43F body built 6/1975. 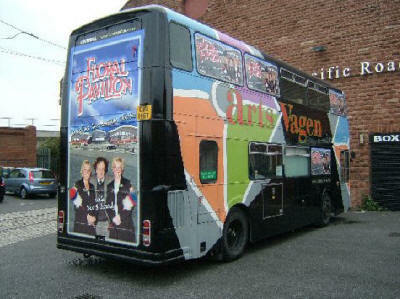 Loaned to Easyway, Blackpool. 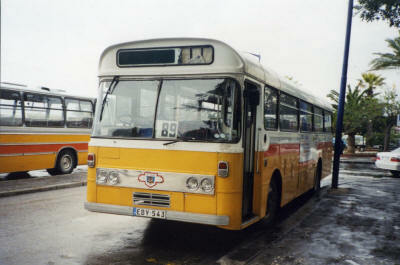 8504 (JWU247N) Leyland Leopard PSU4C/4R7501074 with Plaxton Derwent 7510LB809 DP43F body built 6/1975. 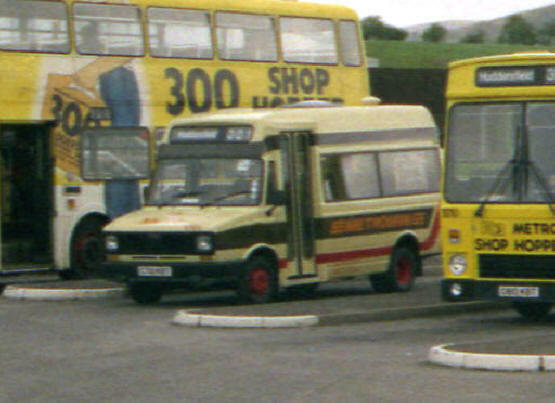 Loaned to Easyway, Blackpool. 8505 (JWU248N) Leyland Leopard PSU4C/4R7501075 with Plaxton Derwent 7510LB804 DP43F body built 6/1975. Loaned to Easyway, Blackpool. 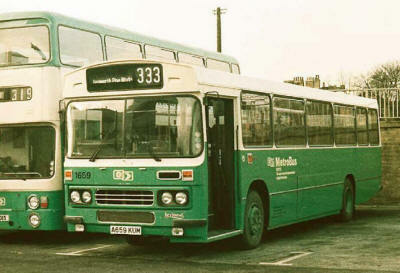 8506 (JWU249N) Leyland Leopard PSU4C/4R7501317 with Plaxton Derwent 7510LB801 DP43F body built 6/1975. 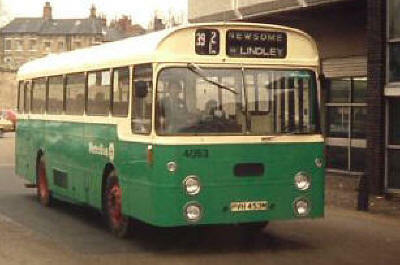 Loaned to Easyway, Blackpool. 8507 (JWU250N) Leyland Leopard PSU4C/4R7501318 with Plaxton Derwent 7510LB803 DP43F body built 6/1975. Loaned to Easyway, Blackpool. 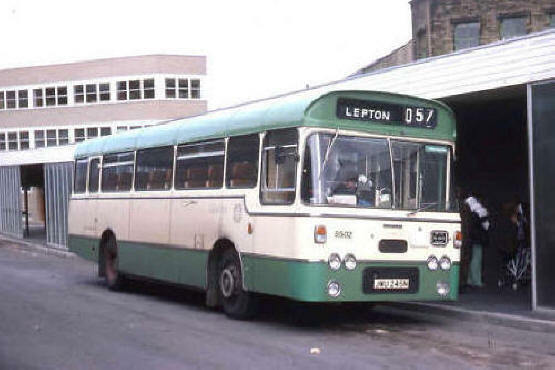 8524 (LUG524P) Leyland Leopard PSU4C/4R7504473 with Plaxton Derwent 7610LB804 DP43F body built 3/1976. 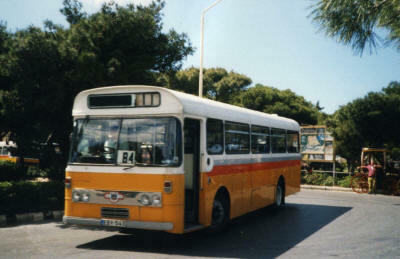 Sold for further service & to Malta EBY543 & ran until 2011. 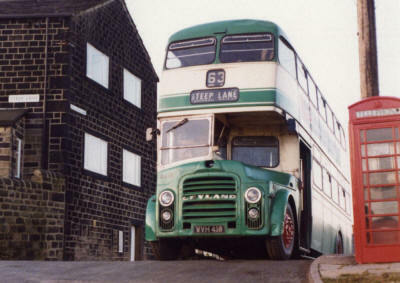 335 Huddersfield -Scholes - Holmfirth - Meltham - Marsden Hard End route at Chain Road. 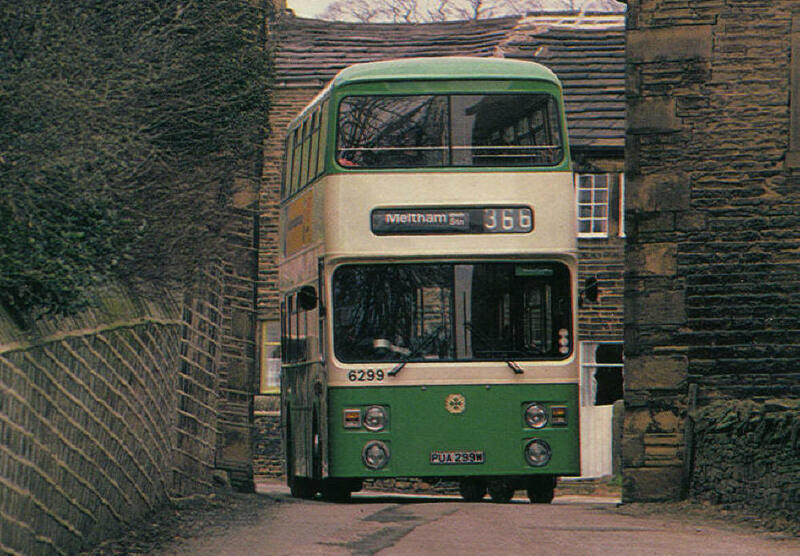 335 Huddersfield -Scholes - Holmfirth - Meltham - Marsden Hard End route at Slaithwaite Road. 392 Huddersfield - Birkby - Weatherhill - Milnsbridge - Newsome route at Milnsbridge. 89 Valletta - Sigglewl, route Malta at Valletta. 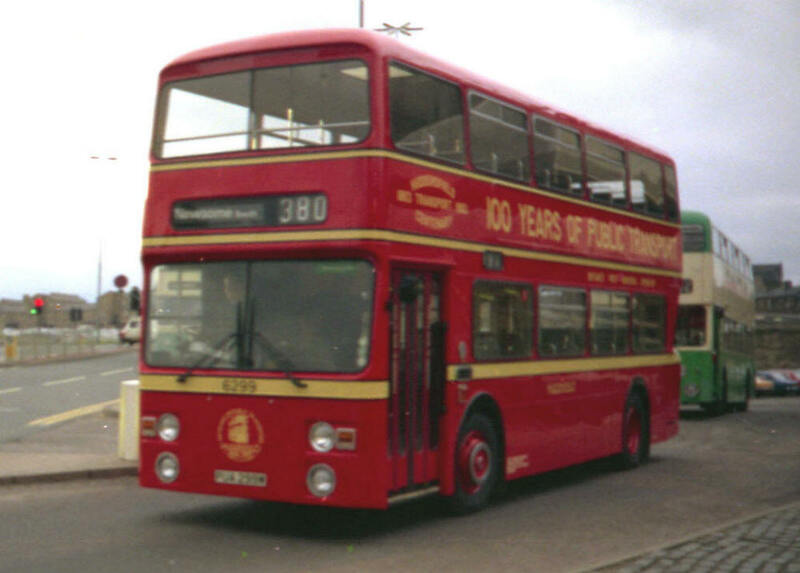 391 Huddersfield - Birkby - Weatherhill - Milnsbridge - Newsome route at Huddersfield Bus Station. 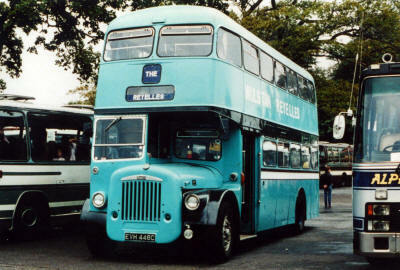 8527 (RWT527R) Leyland Leopard PSU4D/4R7603334 with Plaxton Derwent 7610LB810 DP43F body built 10/1976. 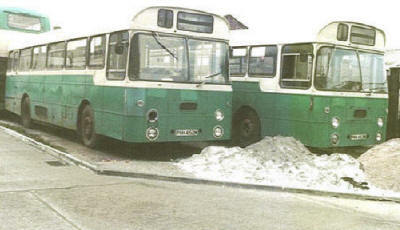 Sold to Green Bus Service. 378 Huddersfield - Taylor Hill seen at Huddersfield Bus Station. 336 Huddersfield - Scholes - Holmfirth - Meltham - Slaithwaite seen at Holmfirth. 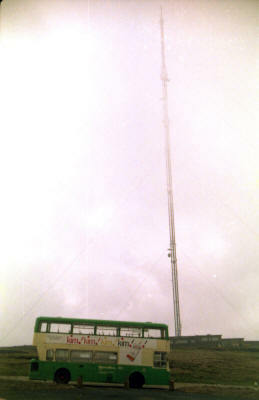 Seen with Green Bus Service. 8528 (RWT528R) Leyland Leopard PSU4D/4R7603340 with Plaxton Derwent 7610LB807 DP43F body built 9/1976 in 1983 fitted with a illuminated sign for the Huddersfield Centenary of Transport. Sold to Green Bus Service. 336 Huddersfield - Scholes - Holmfirth - Meltham - Slaithwaite seen at Lee Homes, Mount Tabor, Scholes. 1501 (JWU239N) Leyland Leopard PSU3C/4R7501664 with Plaxton 7511LX533M C51F body built 6/1975. Transferred from Bingley's. 1504 (JWU242N) Leyland Leopard PSU3C/4R7502269 with Plaxton 7511LX532M C51F body built 6/1975.Transferred from Bingley's. 1528 (GWU528T) Leyland Leopard PSU3E/4R7901161 with Plaxton 7511LX604 C53F body built 7/1979.Transferred from Bingley's. 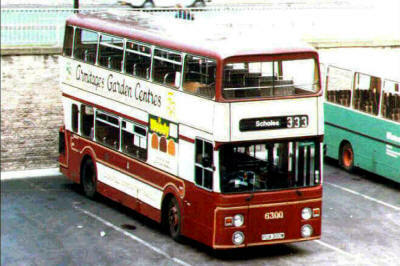 5501 (B141RWY) Leyland Olympian ONLXB1515 with C.H.Roe GO8854 CH43/27F body built 8/1984 for X6 service. 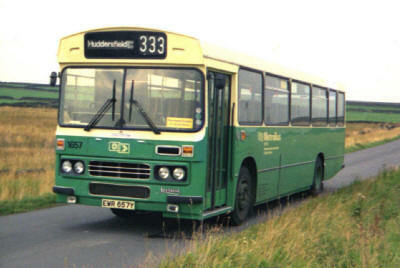 Transferred from Calderdale. 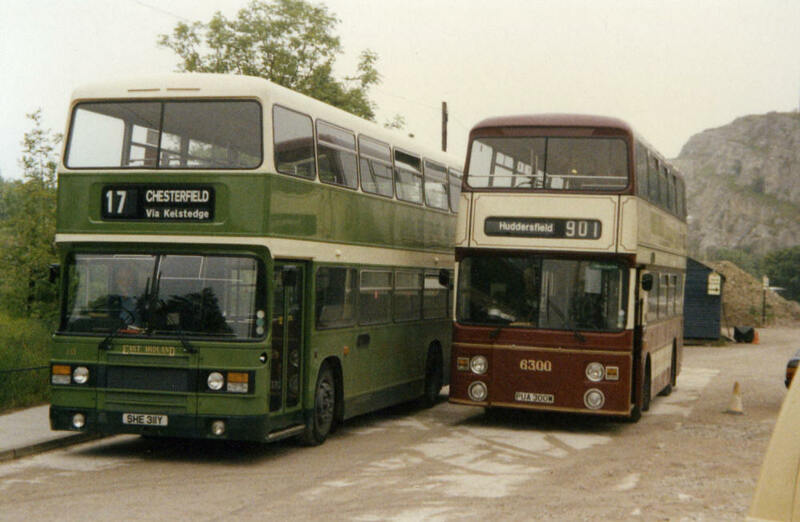 5502 (B142RWY) Leyland Olympian ONLXB1516 with C.H.Roe GO8855 CH43/27F body built 8/1984 for X6 service. 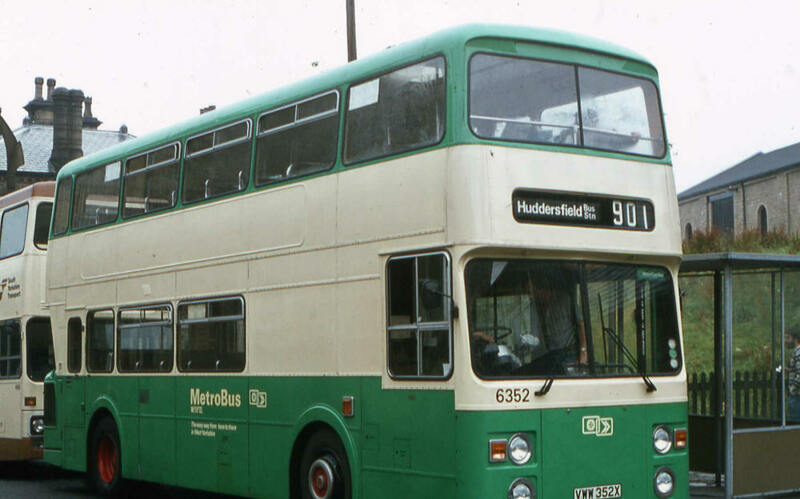 Transferred from Calderdale. 7008 (SUA8R) Leyland Fleetline FE30AGR7603873 with Northern Counties 7838 H43/31F body built 10/1976, for routes 288-290. 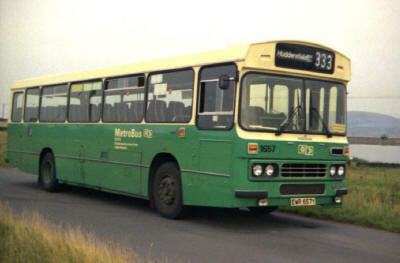 Transferred from Calderdale. 320 Deighton - Huddersfield - Meltham. Seen on John William Street. 7009 (SUA9R) Leyland Fleetline FE30AGR7603920 with Northern Counties 7840 H43/31F body built 10/1976, for routes 288-290 former Halifax Jubilee bus 1977. 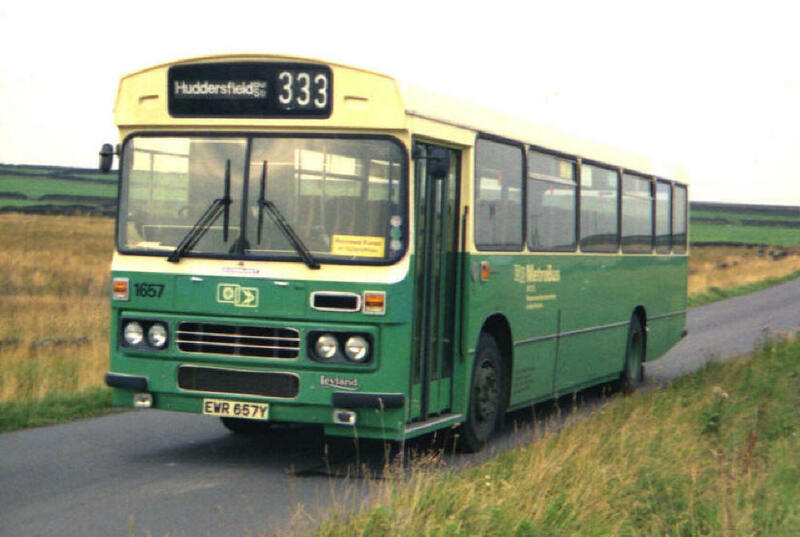 Transferred from Calderdale. 7010 (SUA10R) Leyland Fleetline FE30AGR7603948 with Northern Counties 7839 H43/31F body built 10/1976, for routes 288-290. 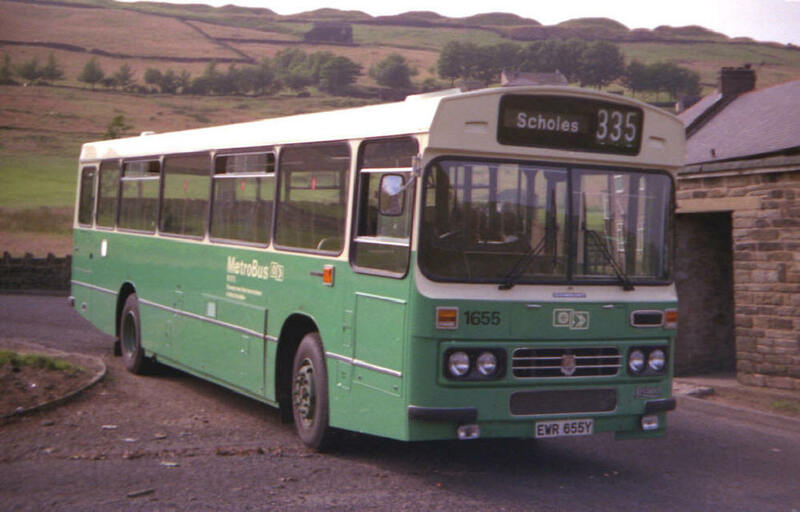 Transferred from Calderdale. 351 (UHG351Y) Leyland Atlantean AN68D/2R8200553 with East Lancashire A3001 H49/36F body built 7/1982 on loan to Kirklees in summer 1985. 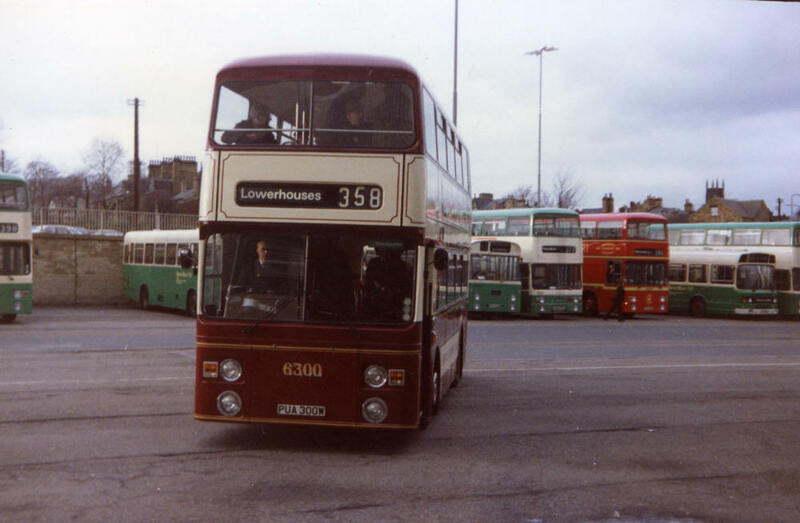 363 Huddersfield - Bradford route seen in Bradford. Seen in Huddersfield Bus Station on a Excursion to Blackpool. 352 (UHG352Y) Leyland Atlantean AN68D/2R8200554 with East Lancashire A3002 H49/36F body built 7/1982 on loan to Kirklees in summer 1985. 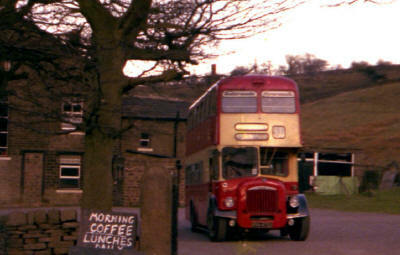 Seen at Crich Tramway Museum. 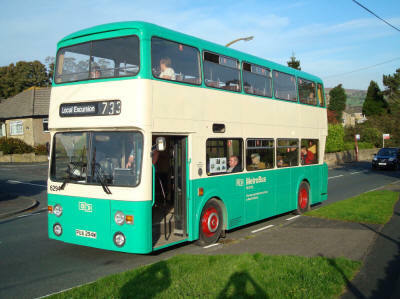 Change over of buses at Crich 352 ran Excursion Blackpool-Crich then 901 Crich-Huddersfield, 6299 901 Huddersfield-Crich & Excursion to Blackpool. Seen on Blackpool Middle Walk. 360 Brackenhall - Huddersfield - Balmoral Avenue seen in Huddersfield Bus Station. 361 Brackenhall - Huddersfield - Balmoral Avenue seen on Blackmoorfoot Road. 361 Balmoral Avenue - Huddersfield - Brackenhall seen on Market Street, Huddersfield.